This set contains visual experimentation for the projects I have recently finished and the projects that I am currently working on. 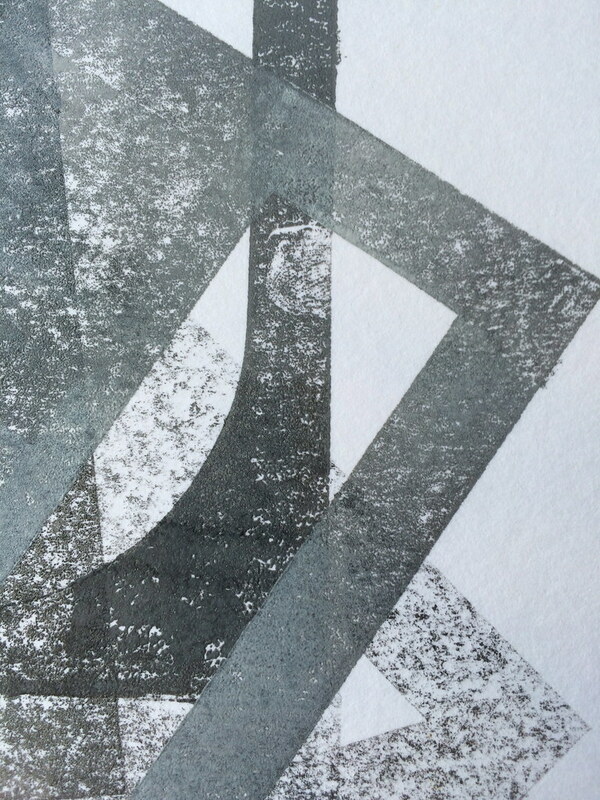 I am really interested in trying all sorts of different processes and methods and combining them in different ways. 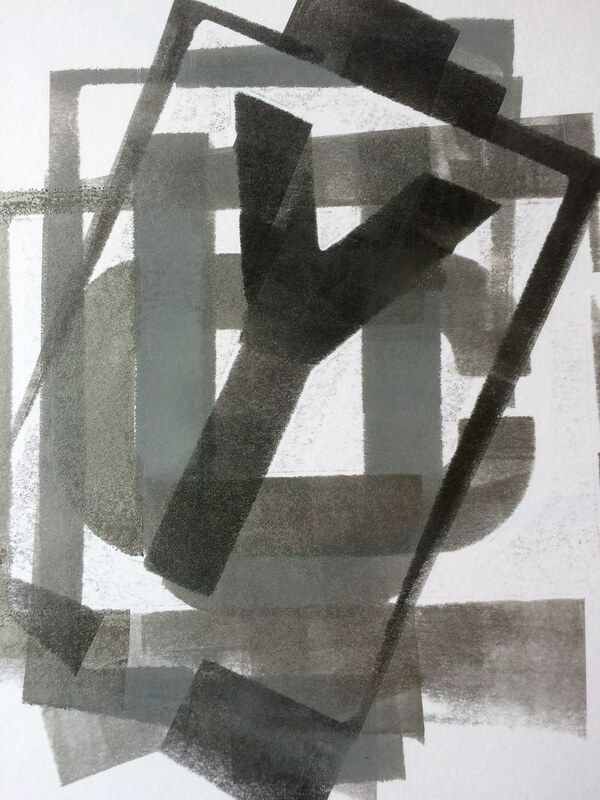 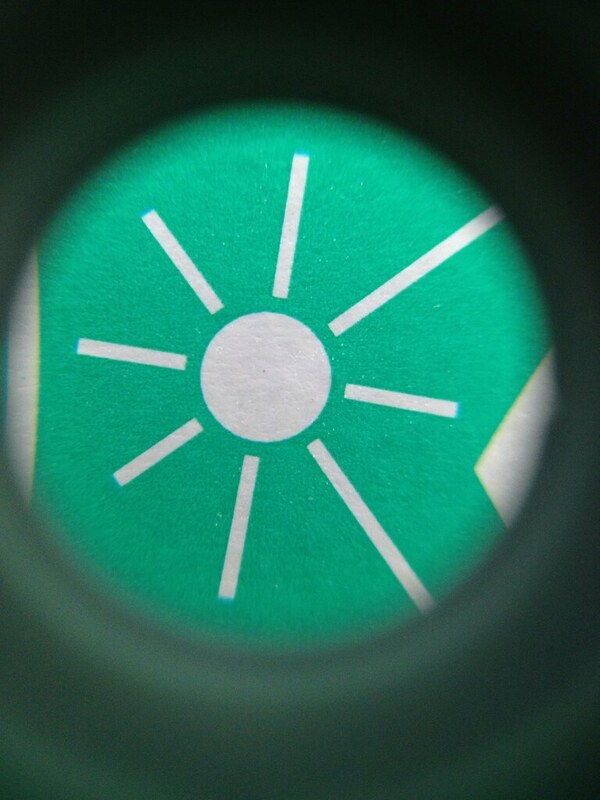 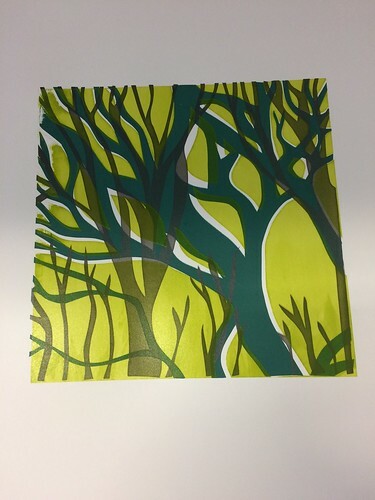 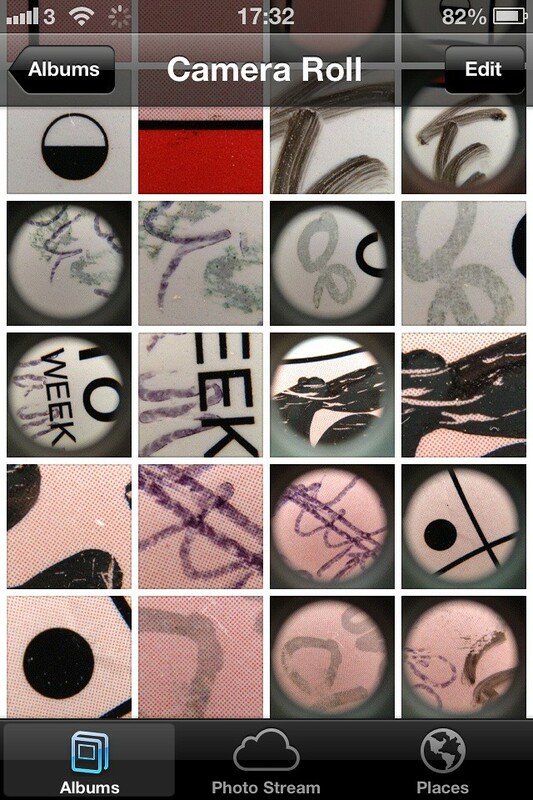 I am currently exploring creating imagery using a digital (iphone attached) microscope, screenprinting stencils and wooden and lead Letterpress. 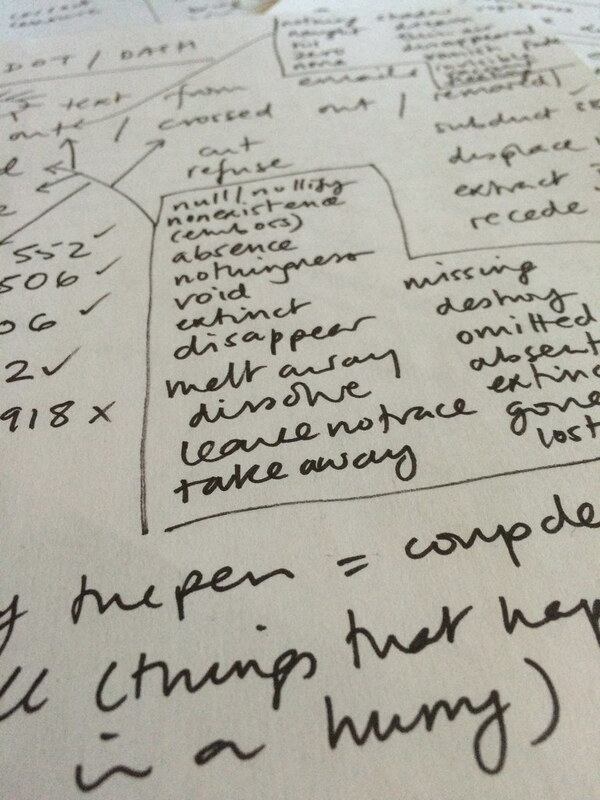 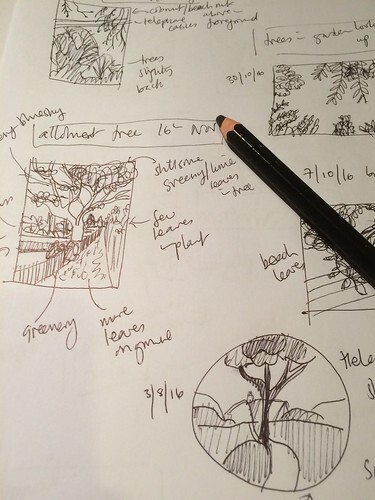 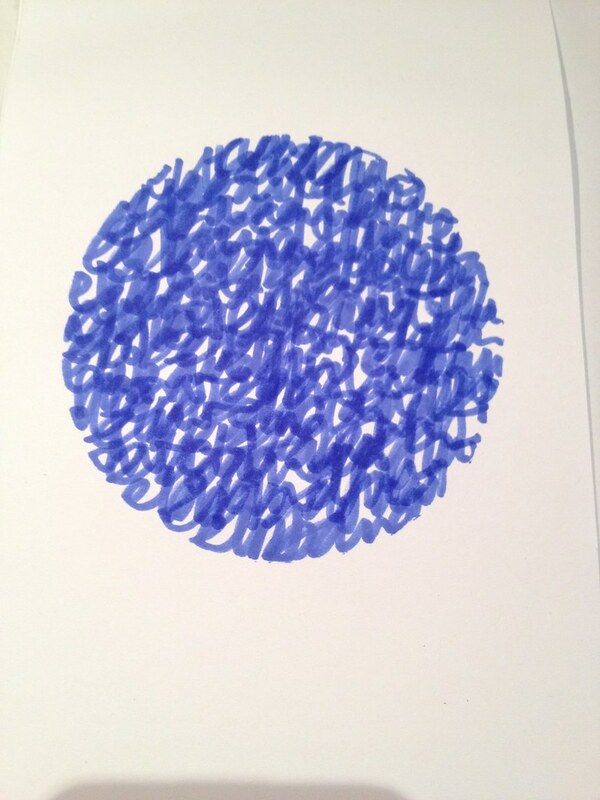 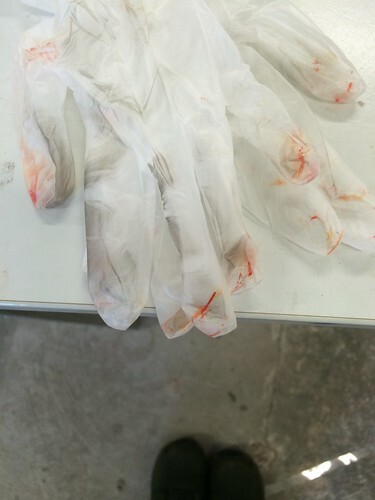 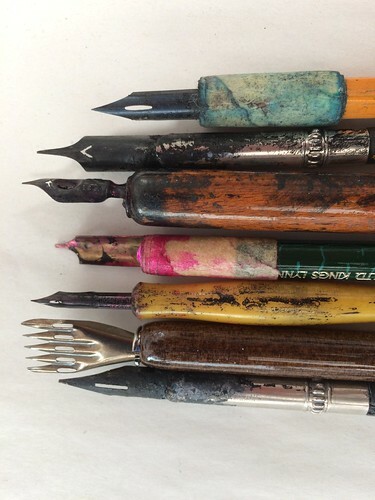 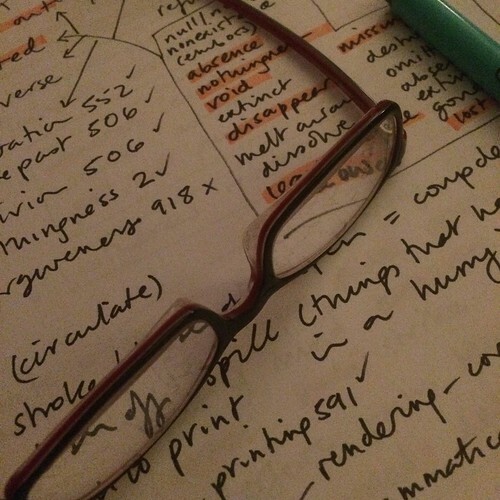 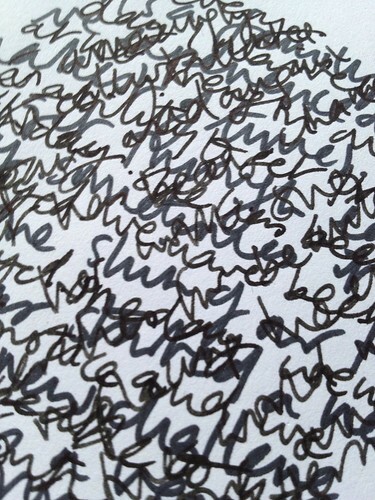 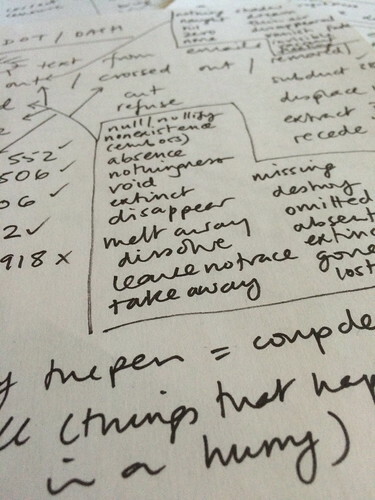 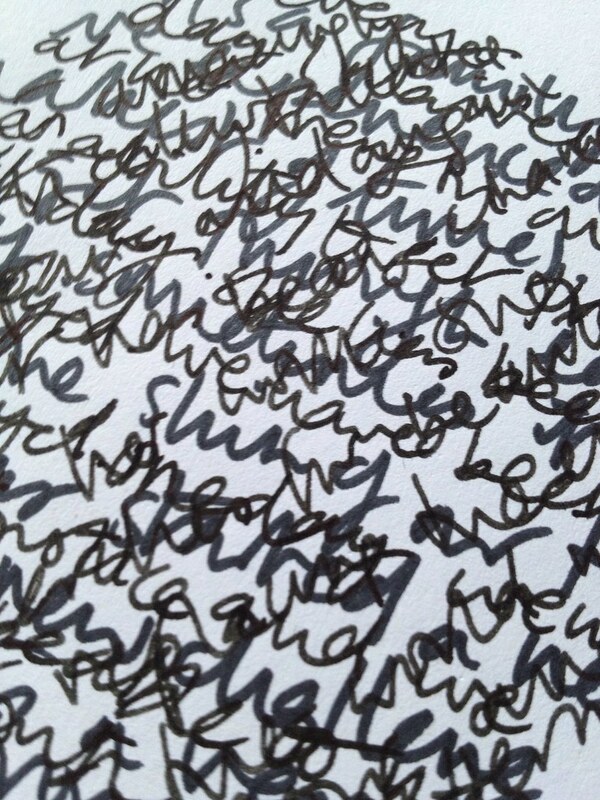 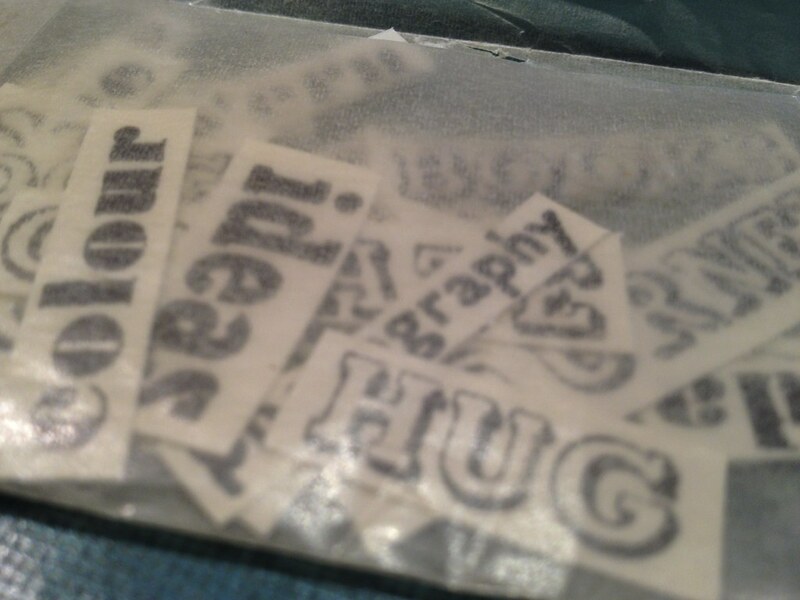 I often combine analogue and digital methods to enhance the communication of my work. 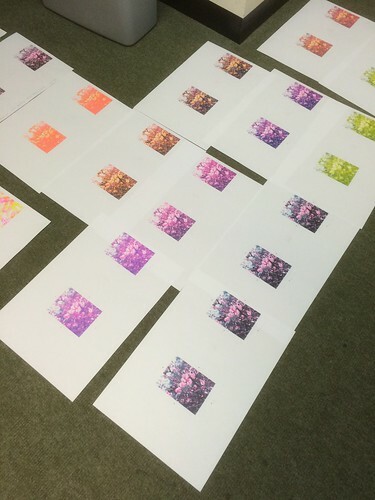 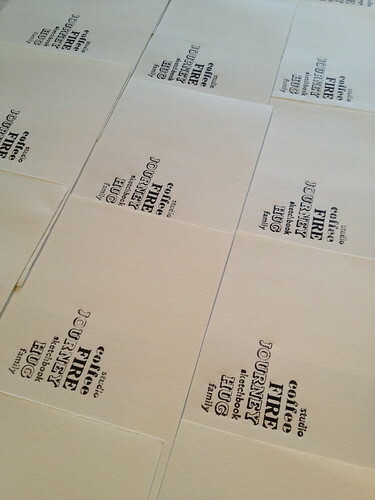 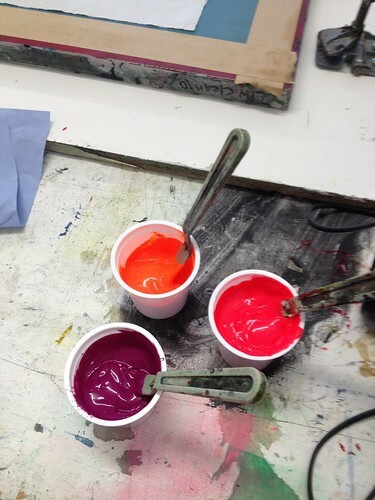 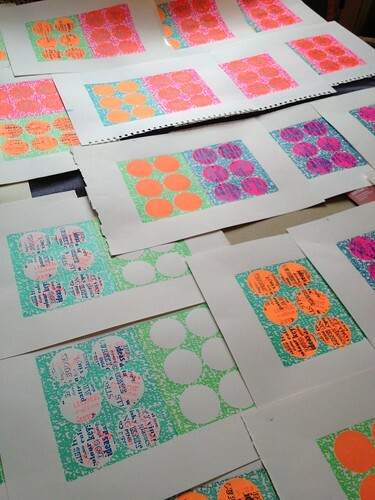 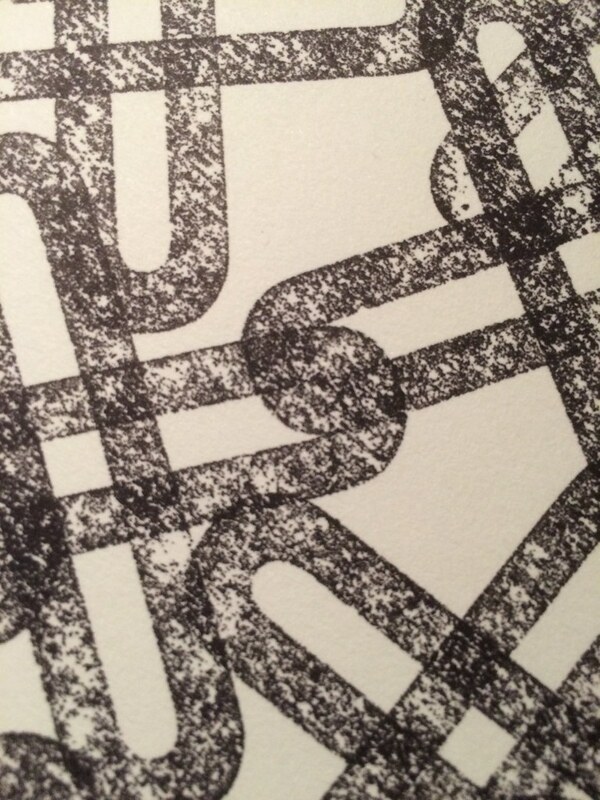 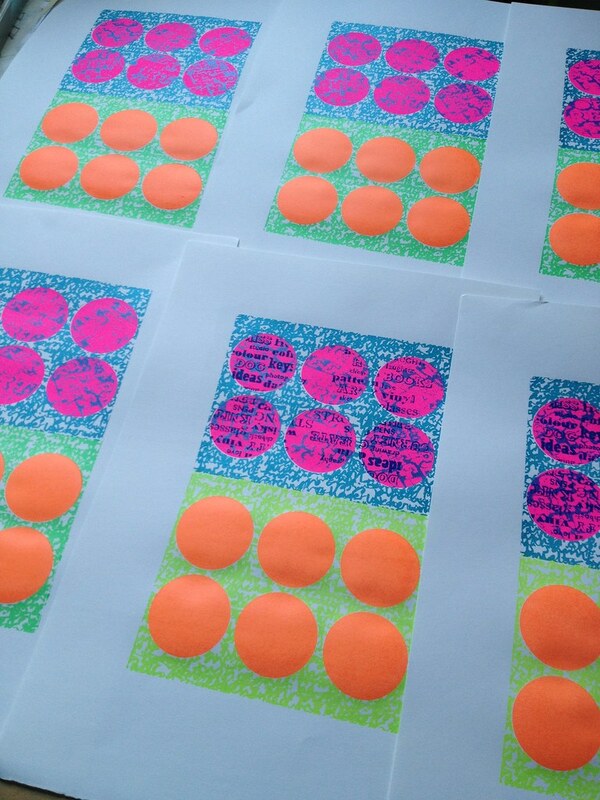 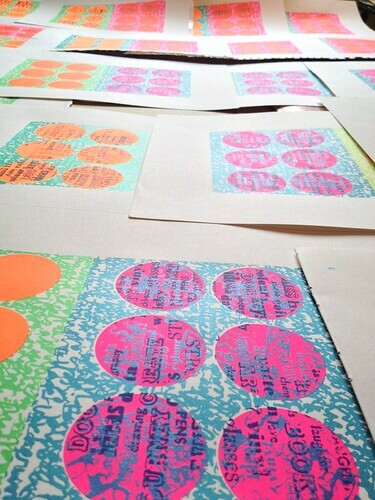 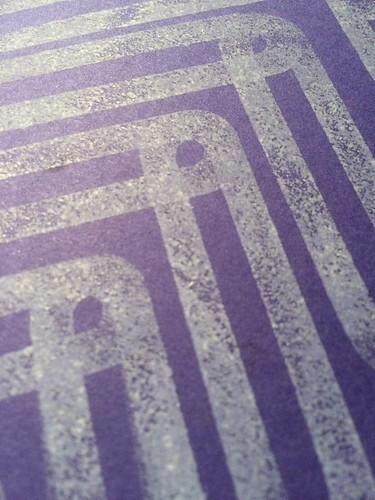 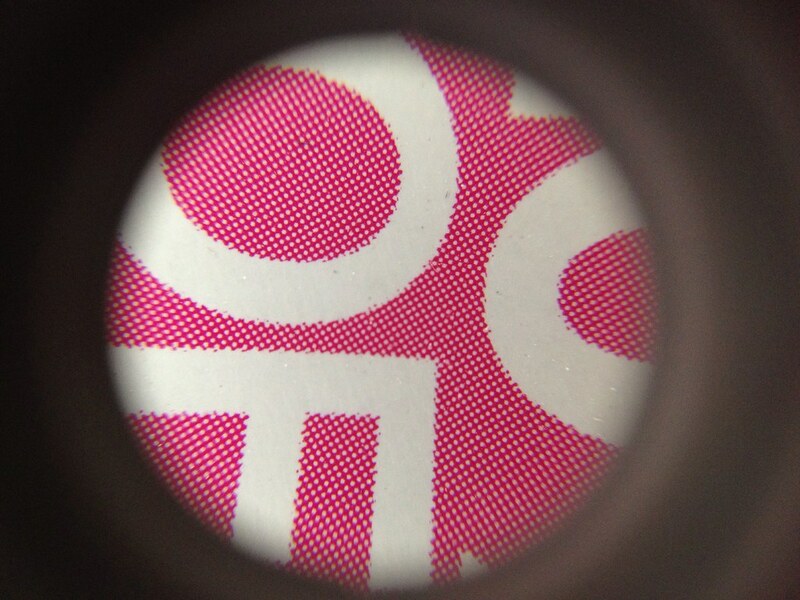 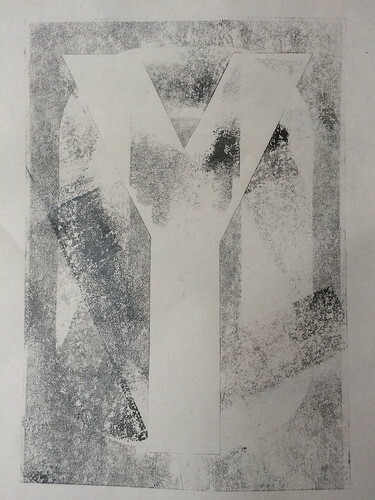 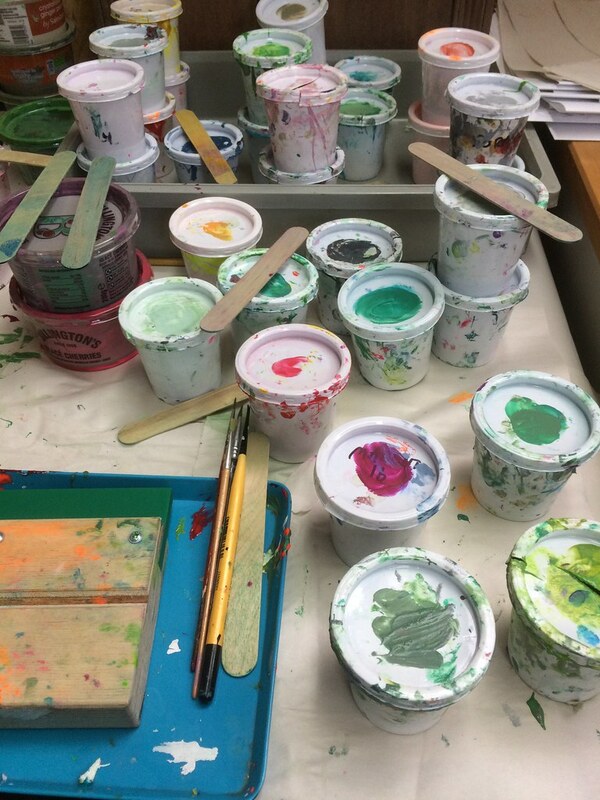 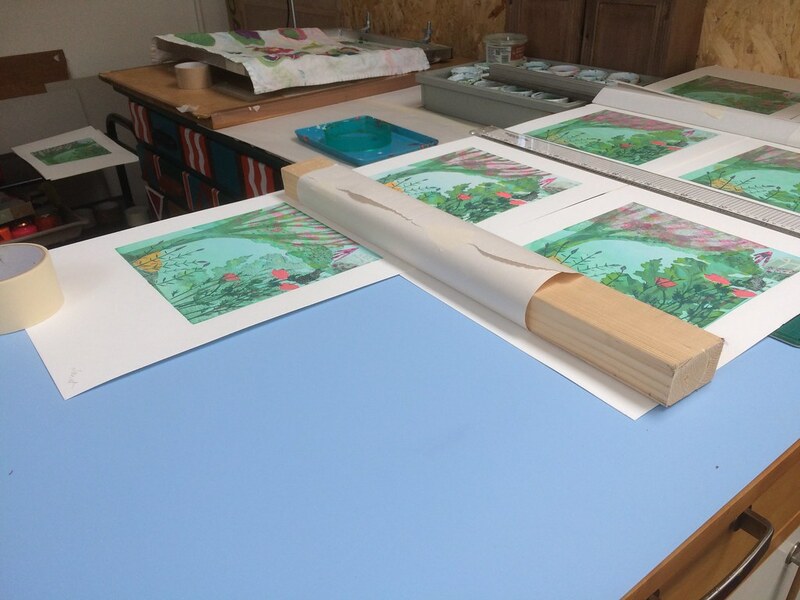 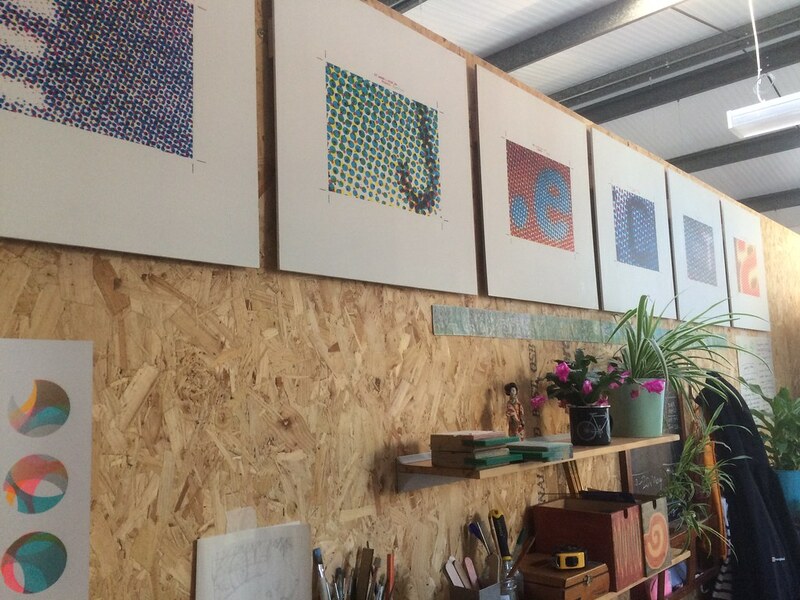 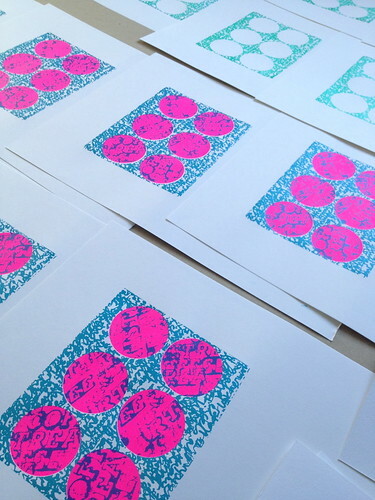 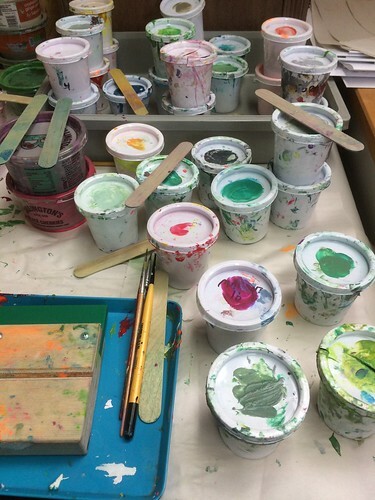 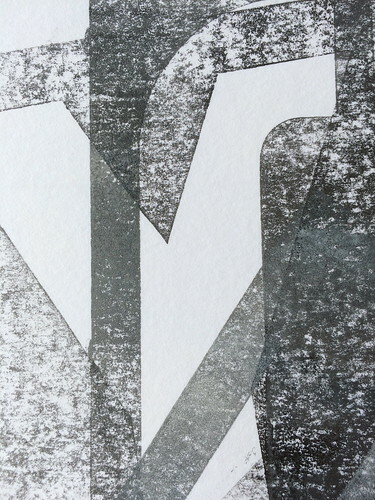 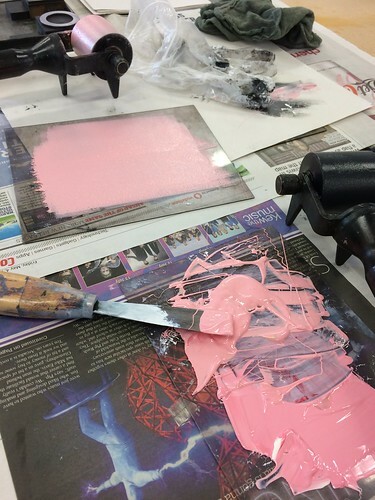 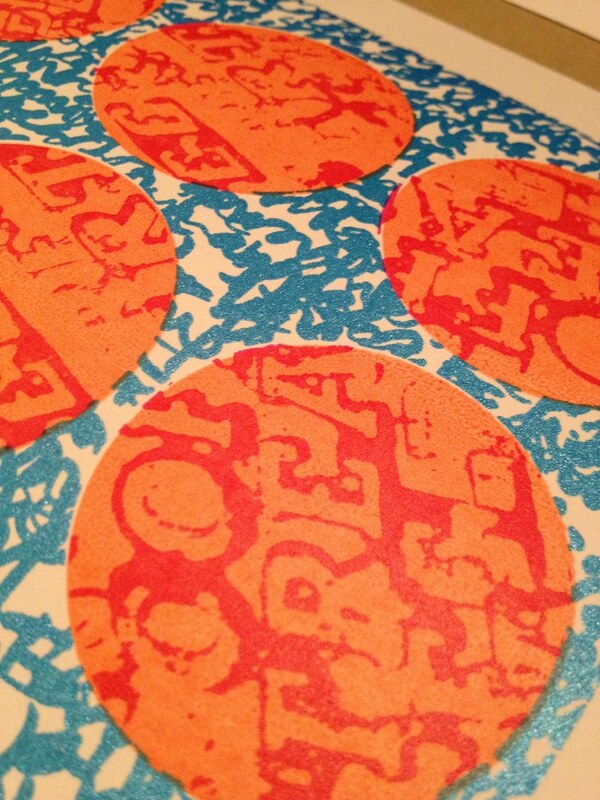 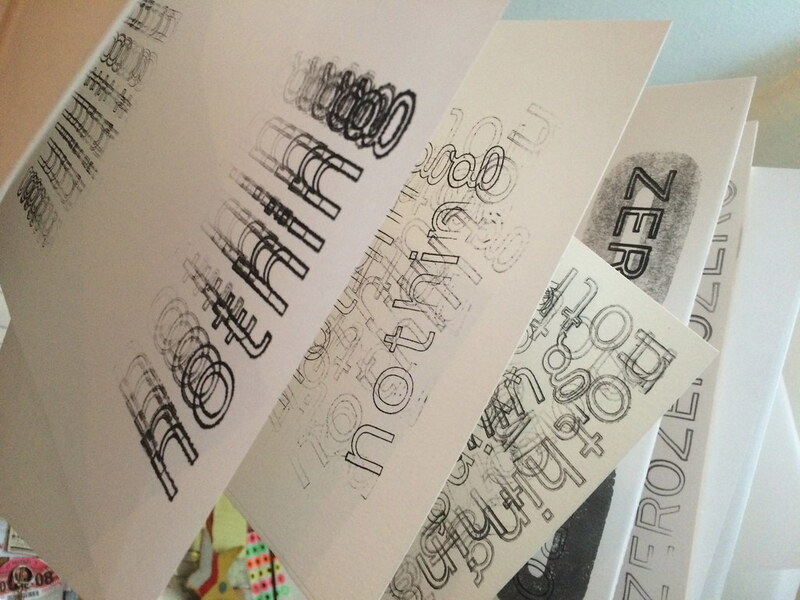 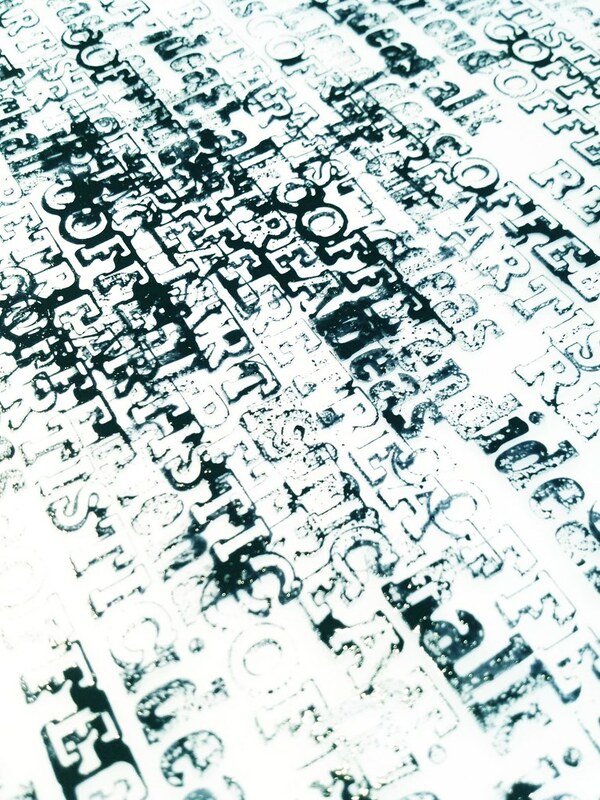 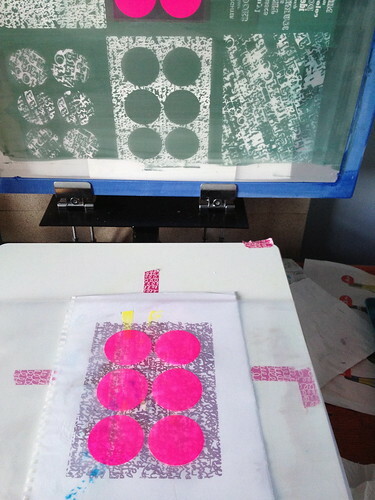 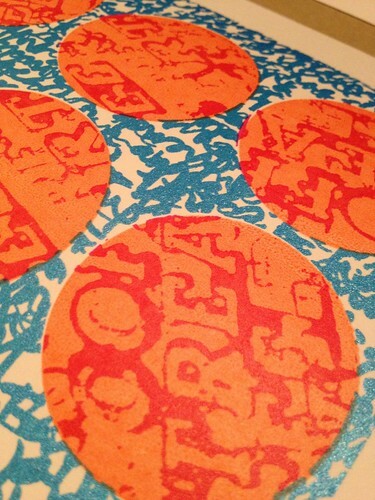 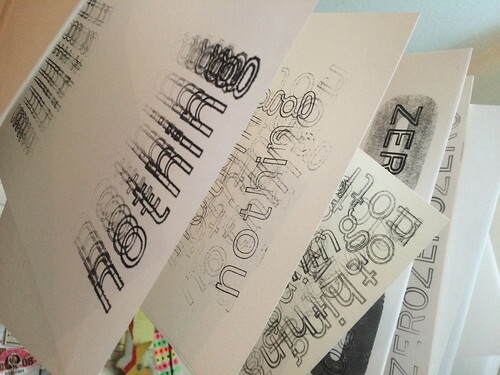 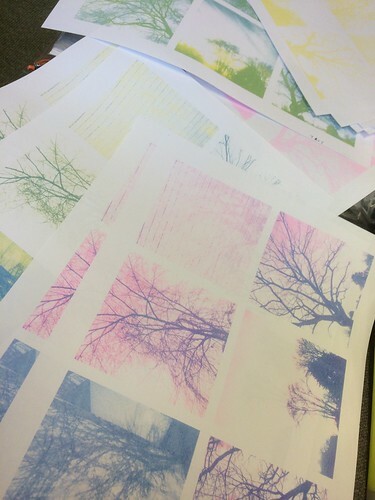 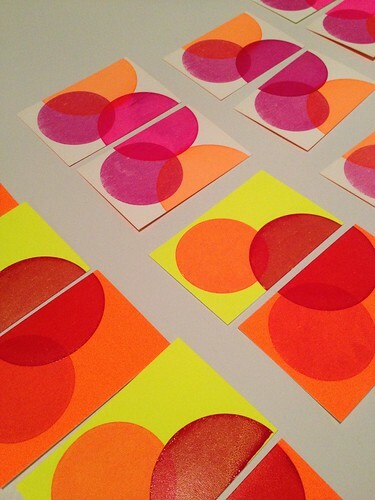 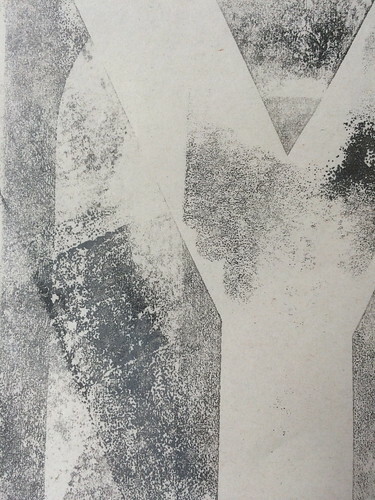 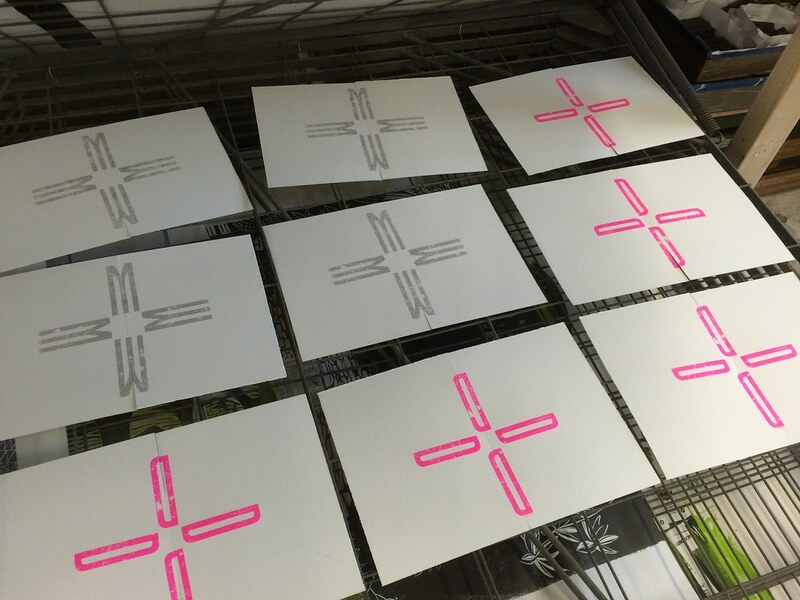 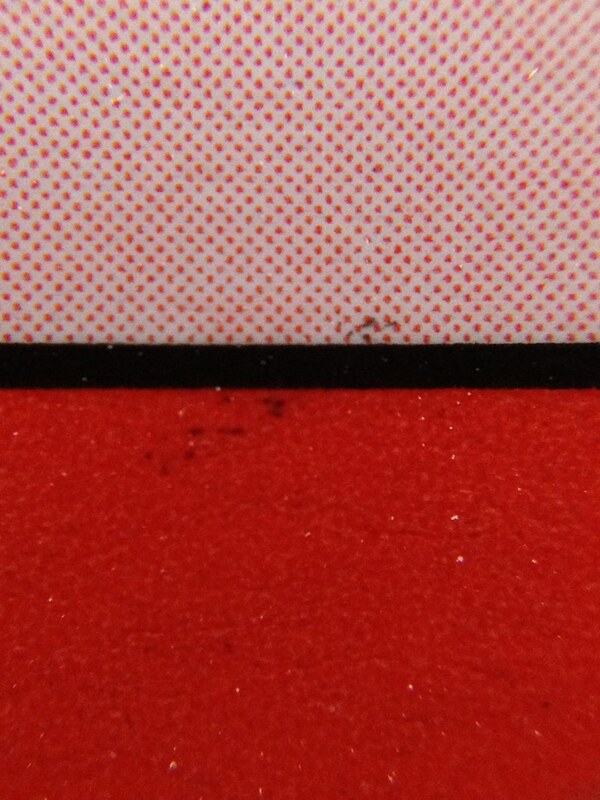 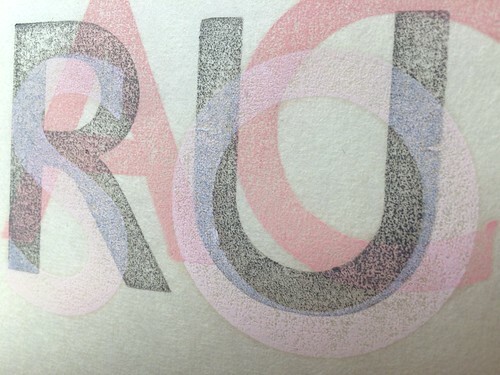 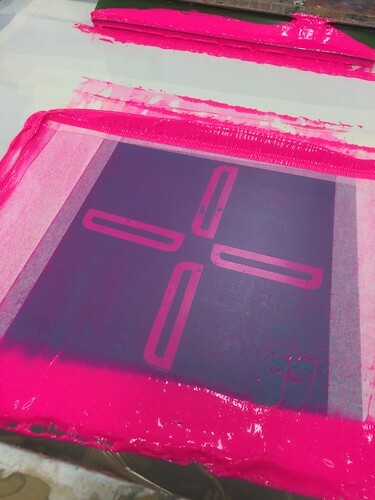 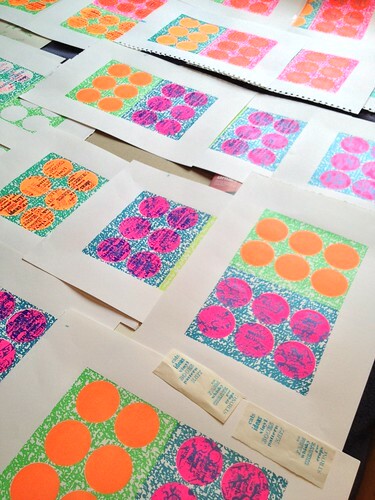 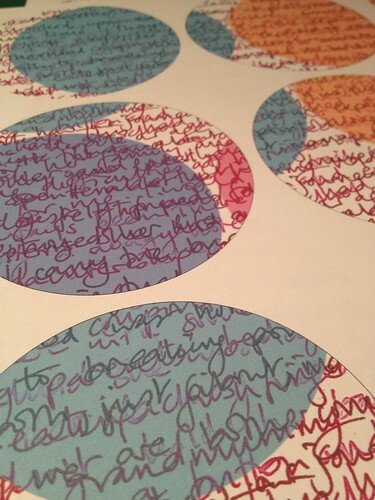 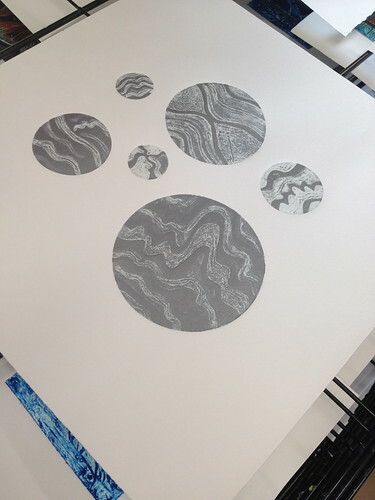 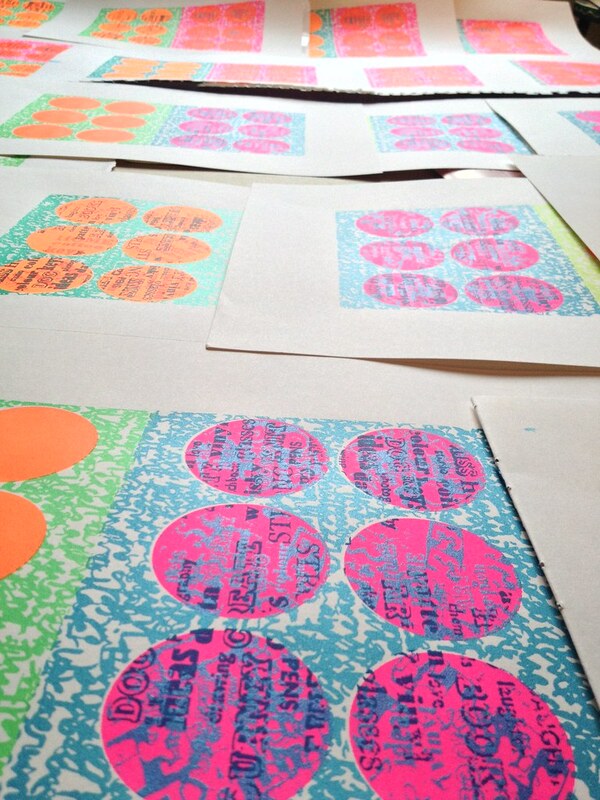 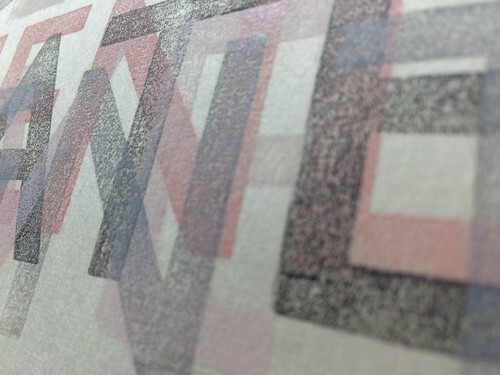 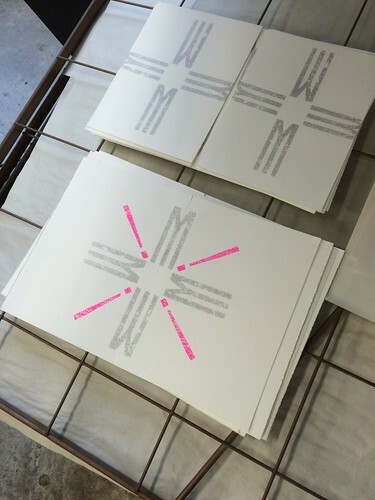 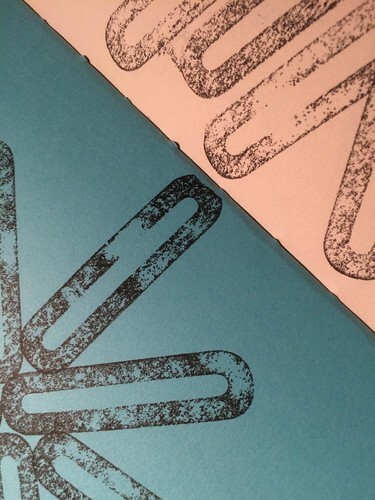 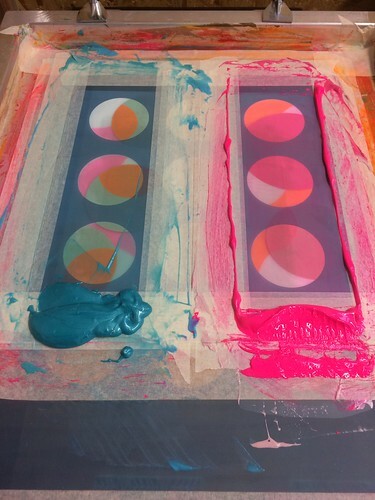 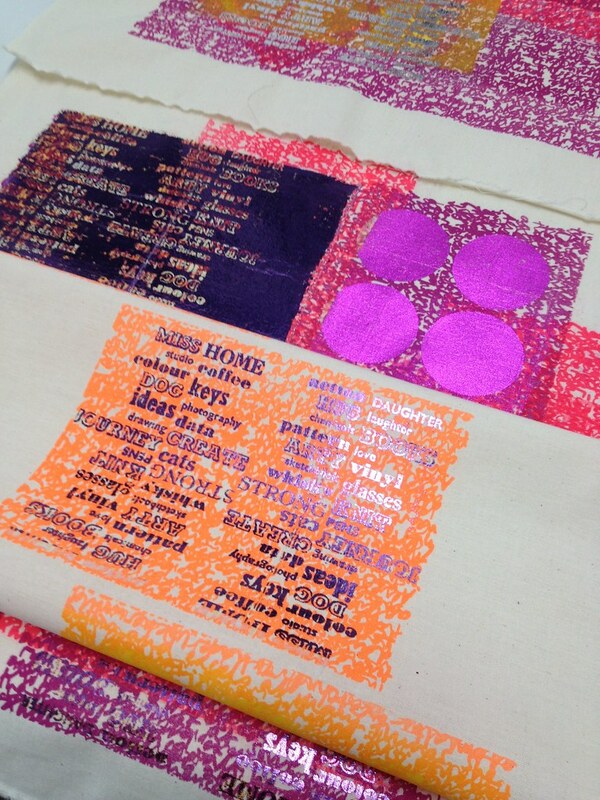 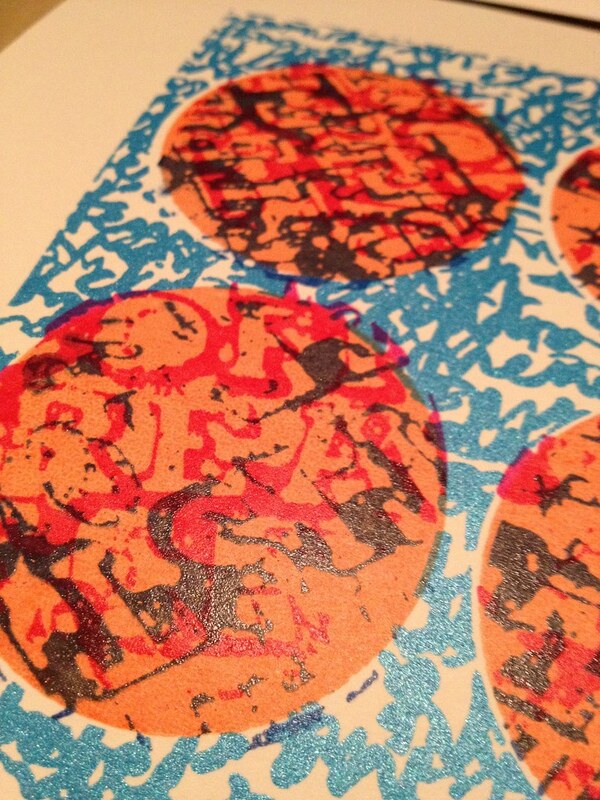 Intersect work in progress - Riso prints hot off the press! 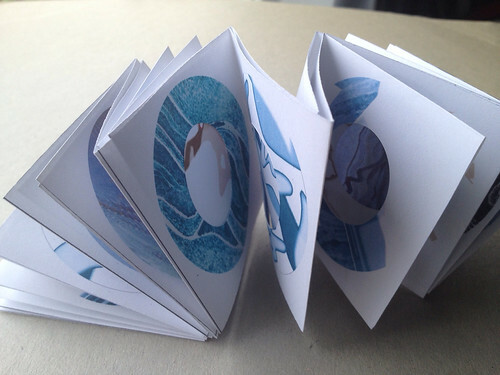 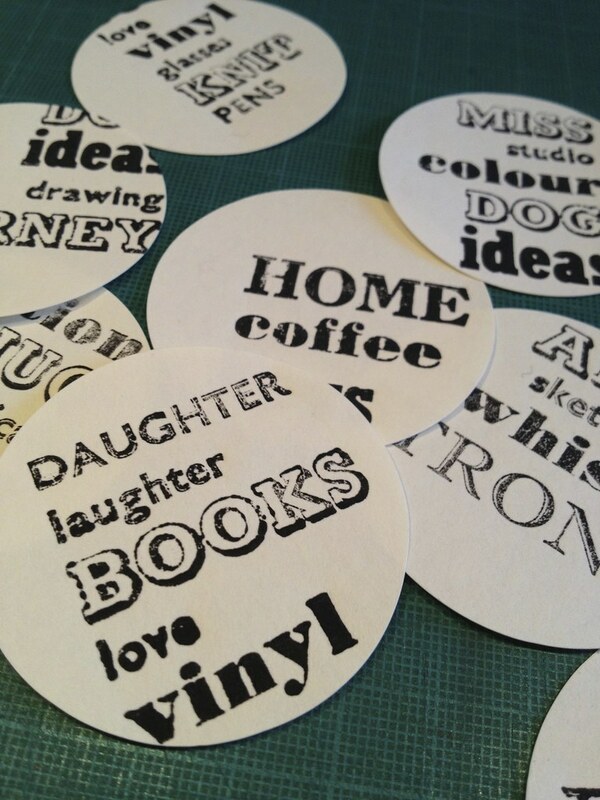 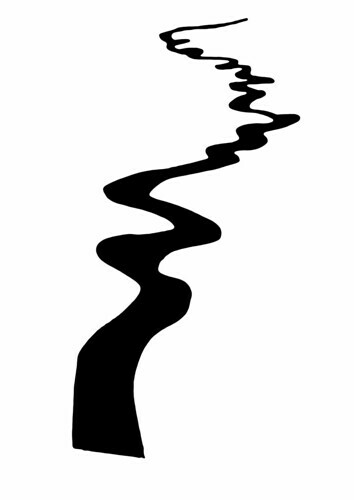 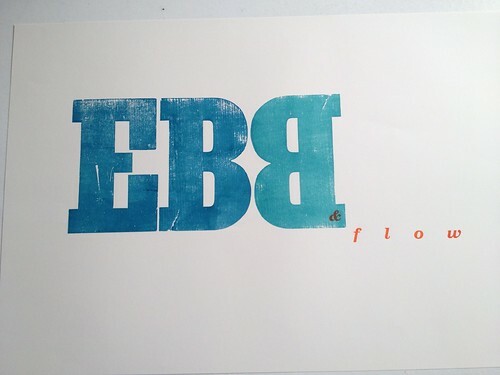 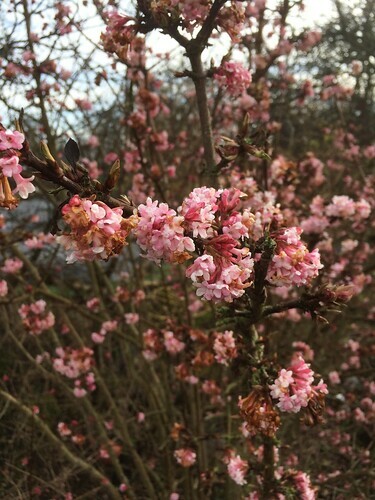 Emma is a co-curator of Ebb and Flow 2015 and a founder member of we love your books. 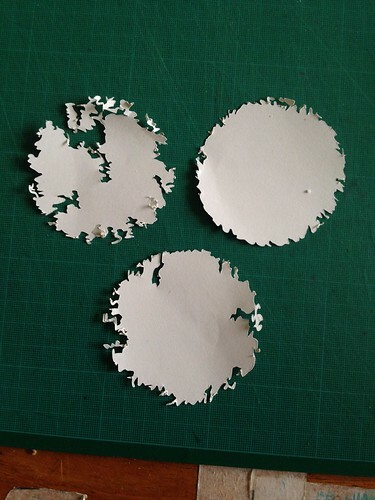 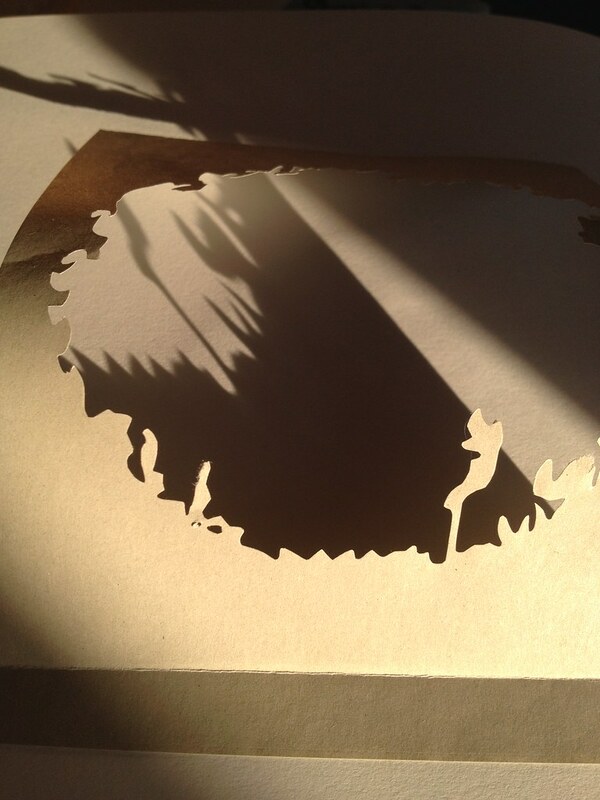 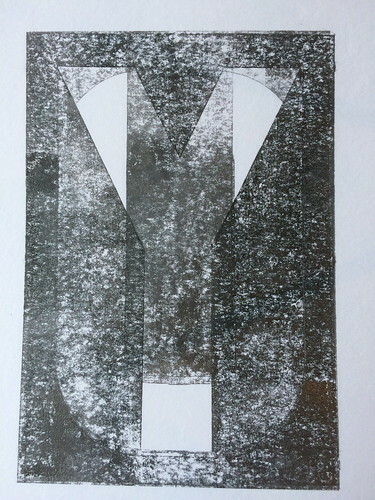 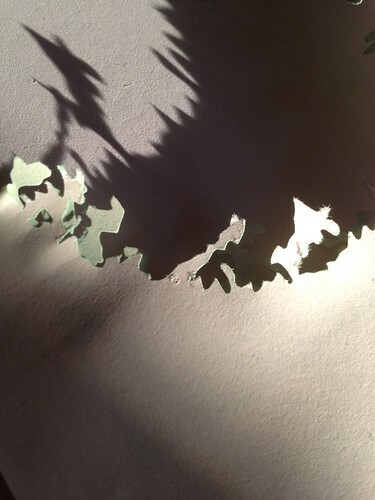 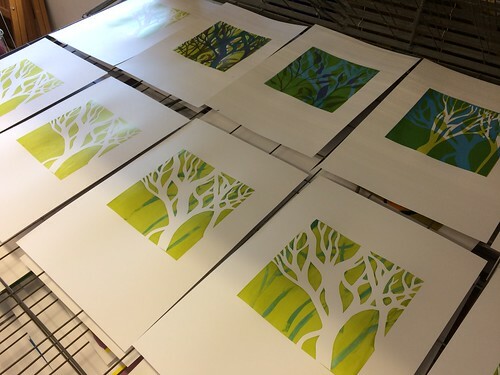 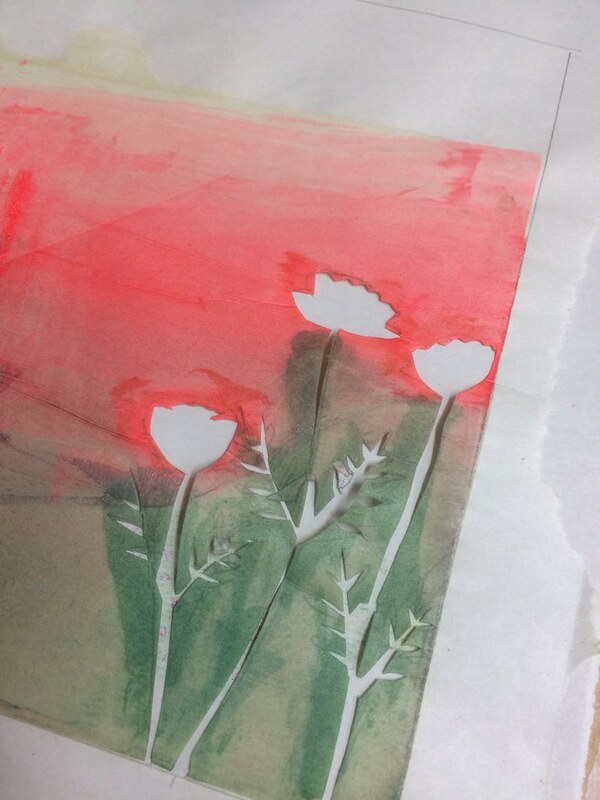 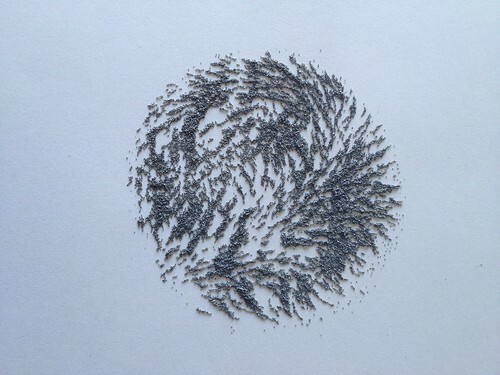 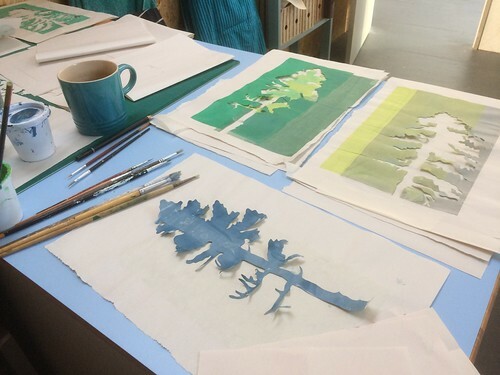 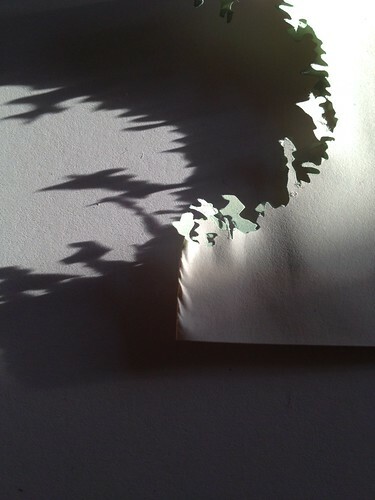 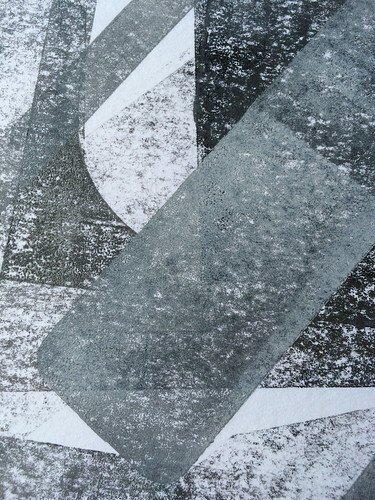 She is a book artist, printmaker and lecturer. 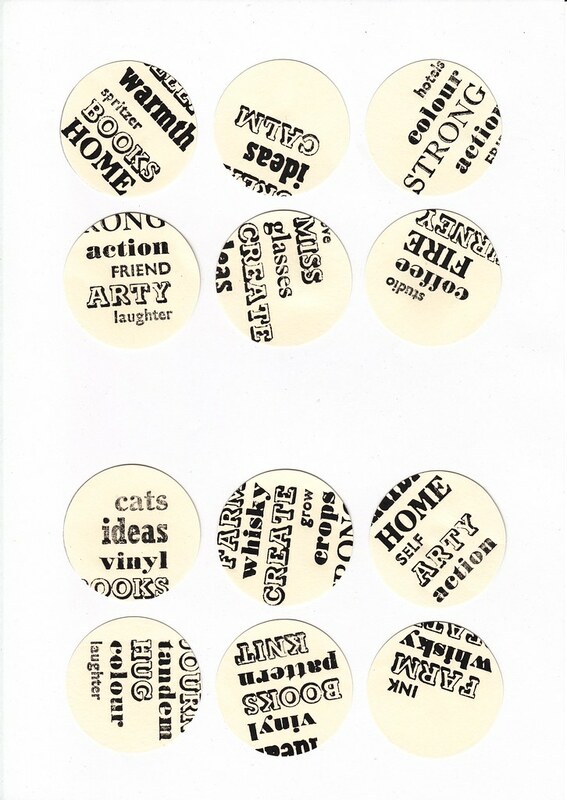 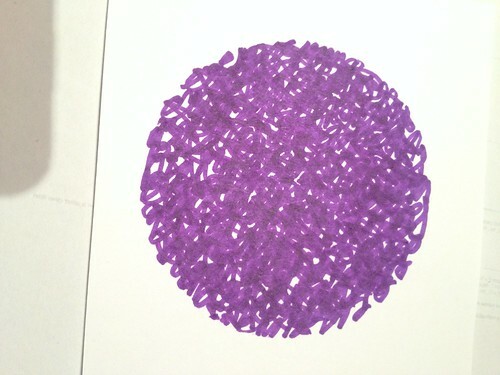 She loves colour and circles and her books often tackle personal and tricky subjects. Her work can be found online and in a variety of collections. 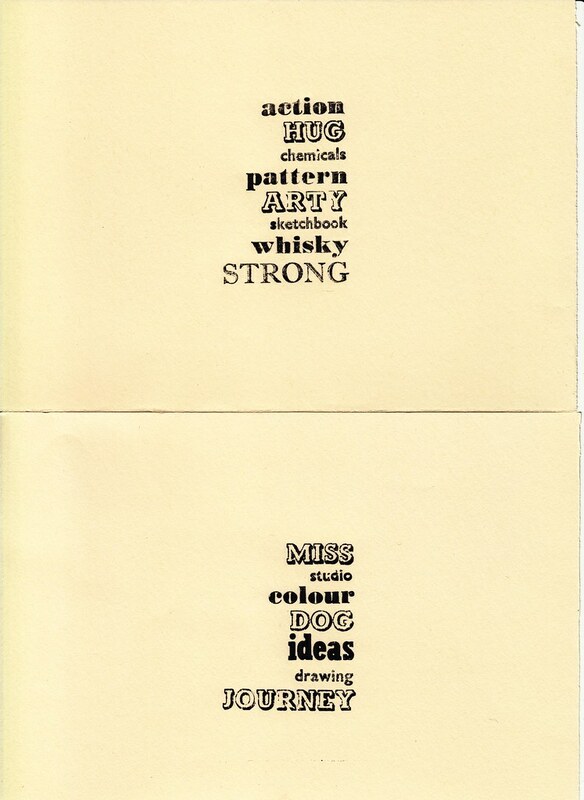 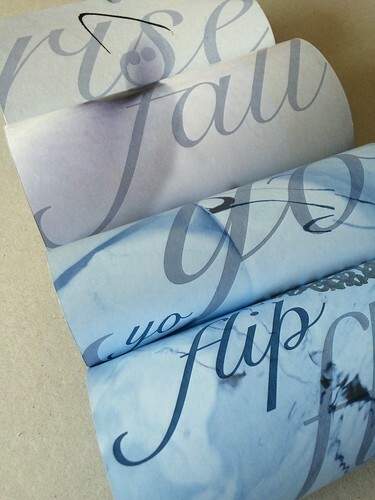 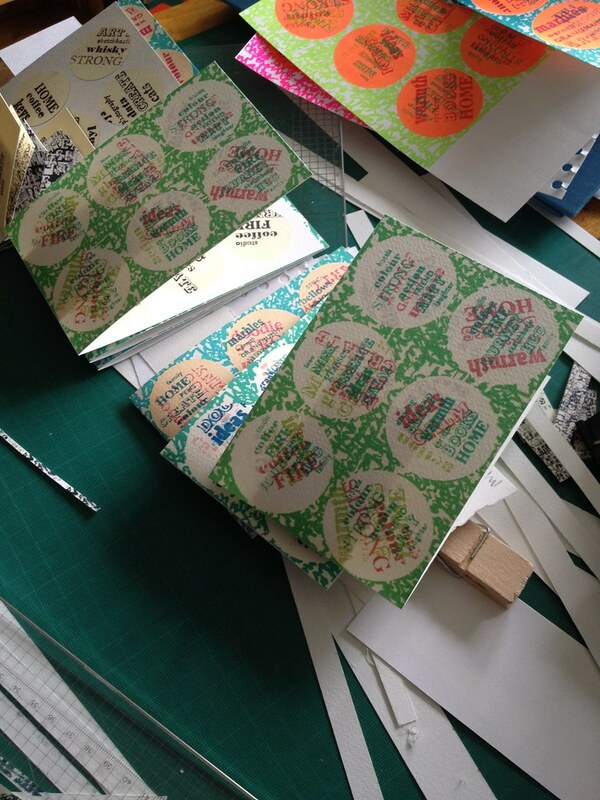 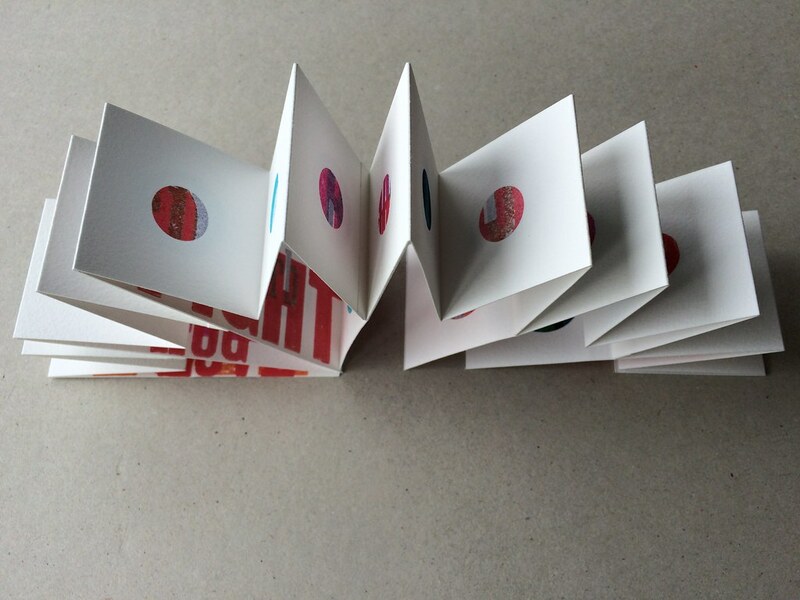 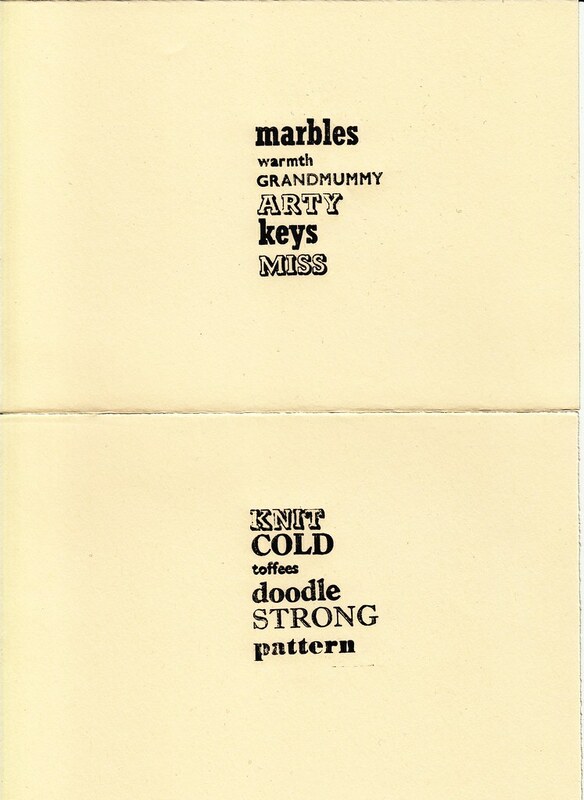 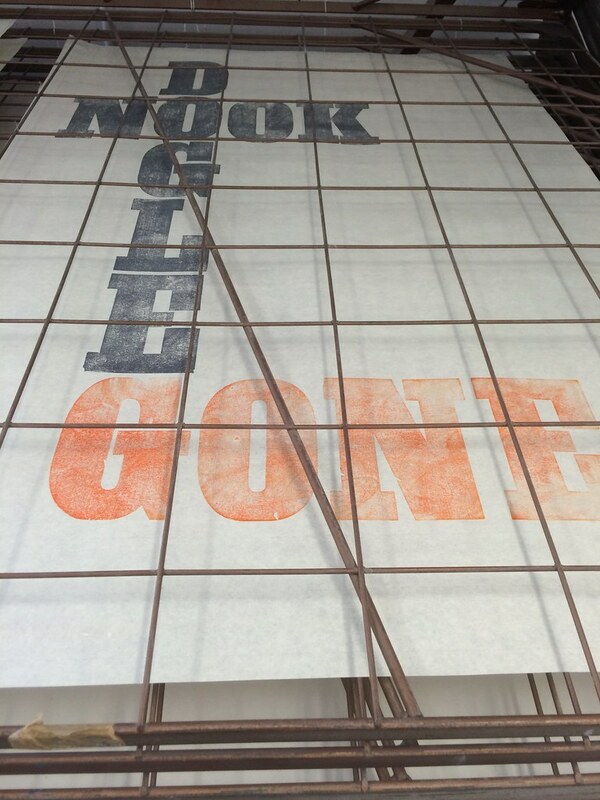 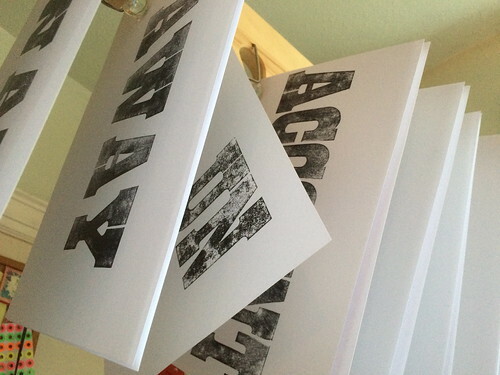 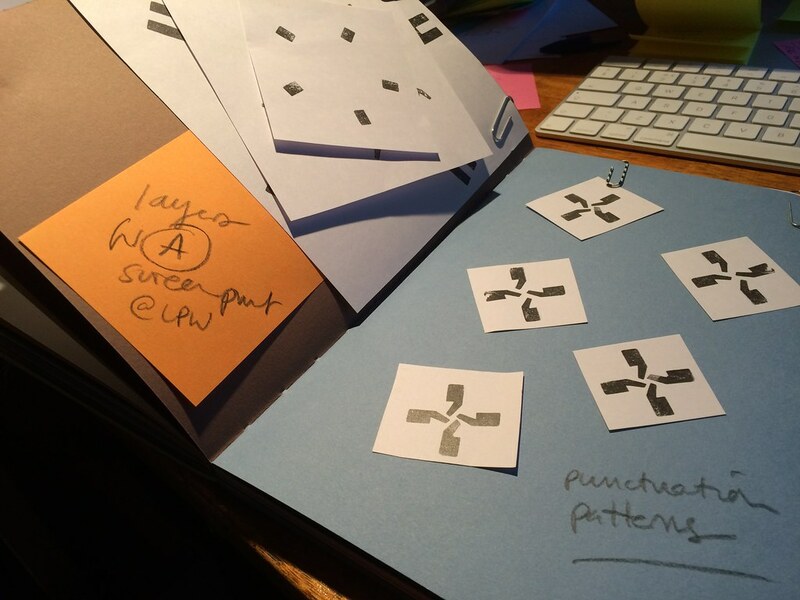 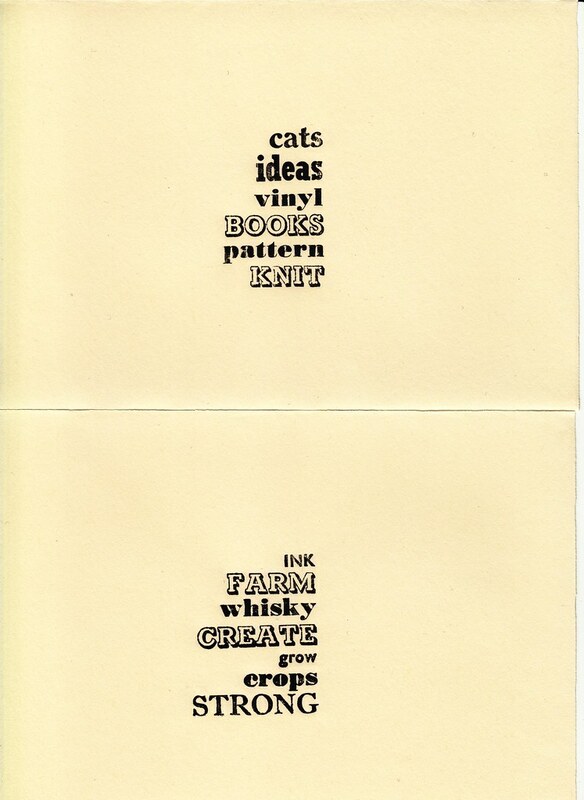 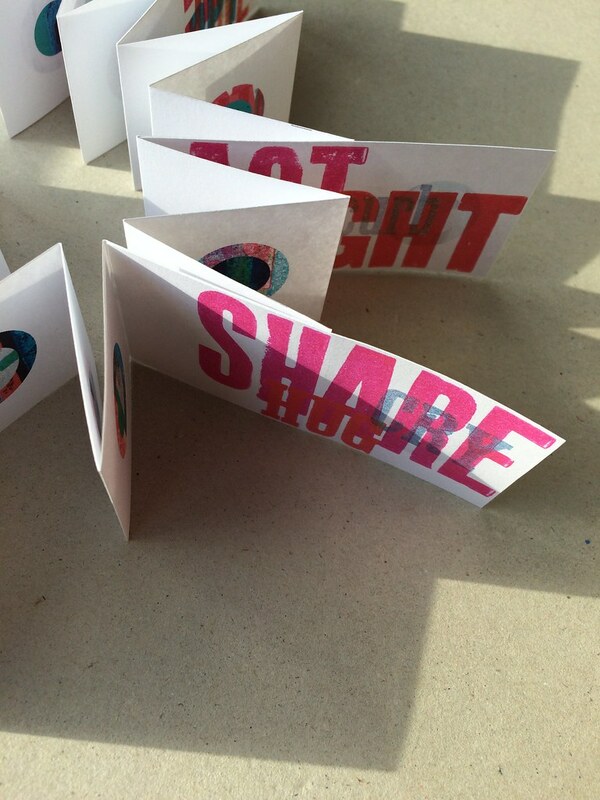 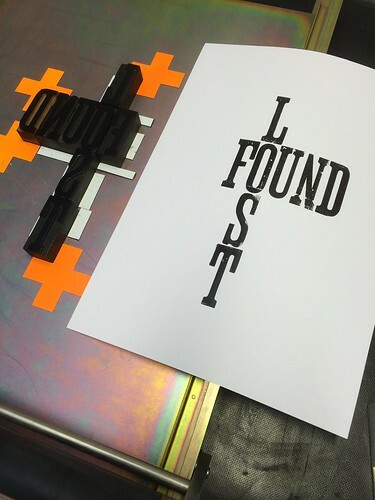 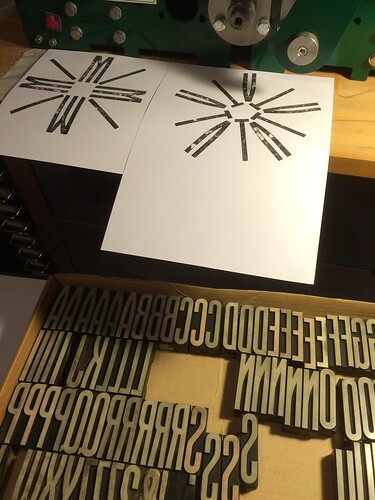 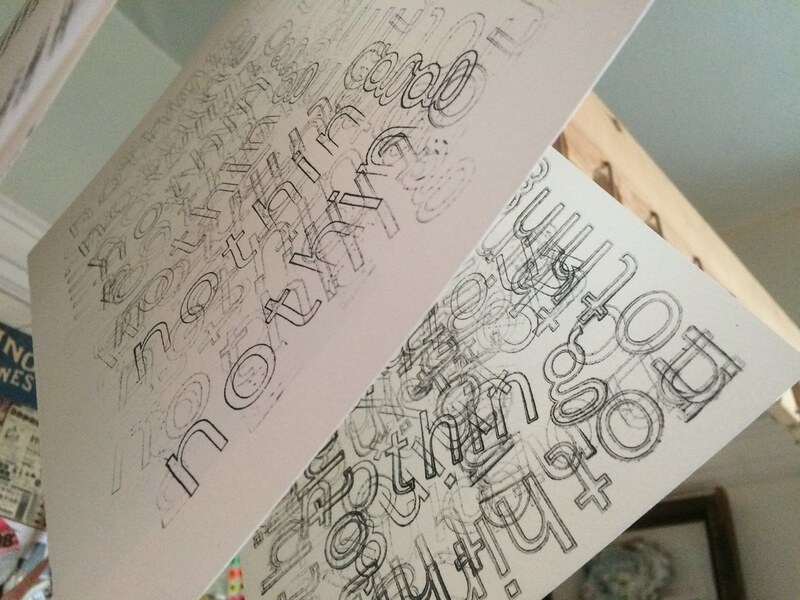 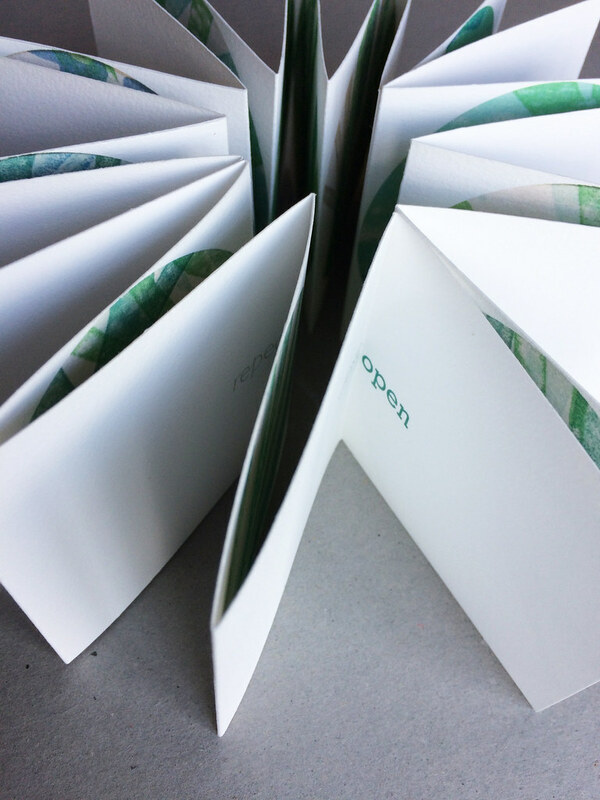 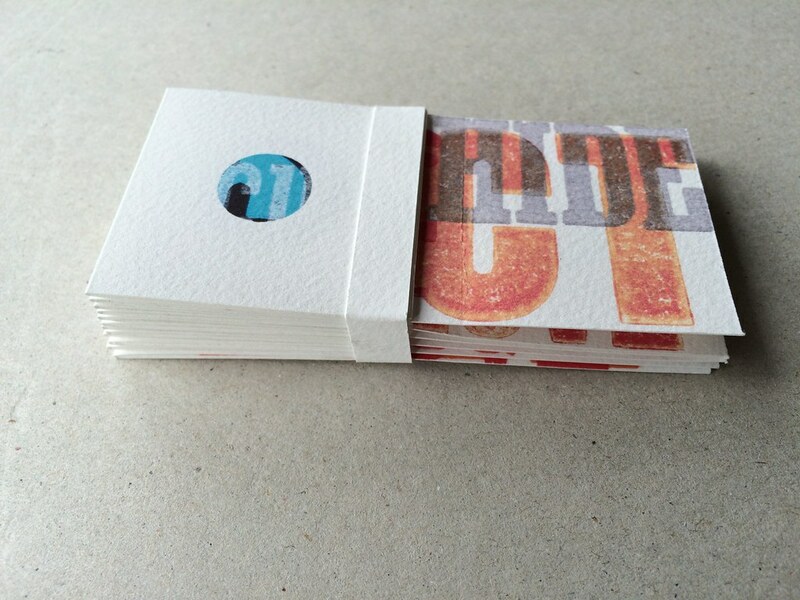 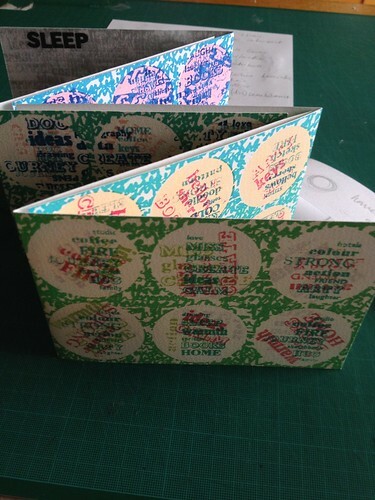 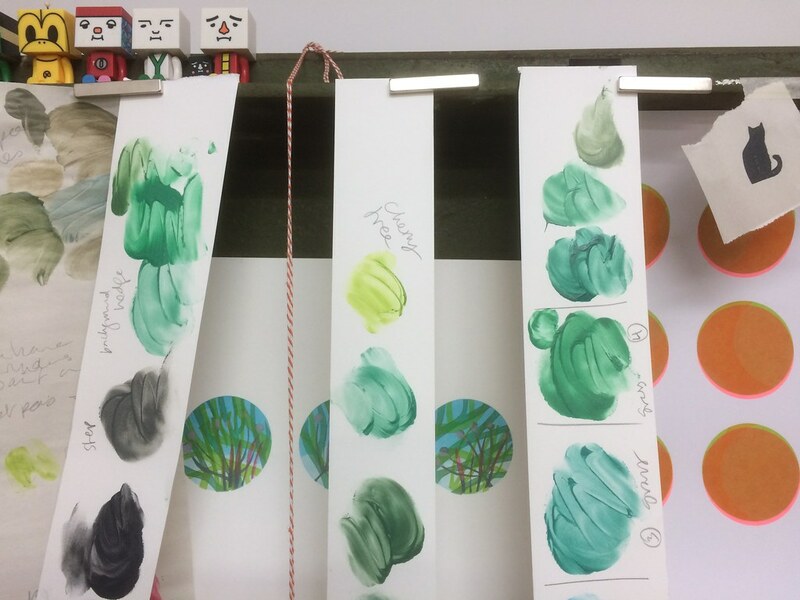 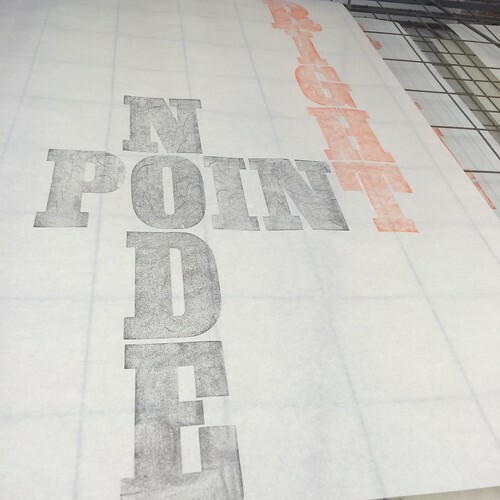 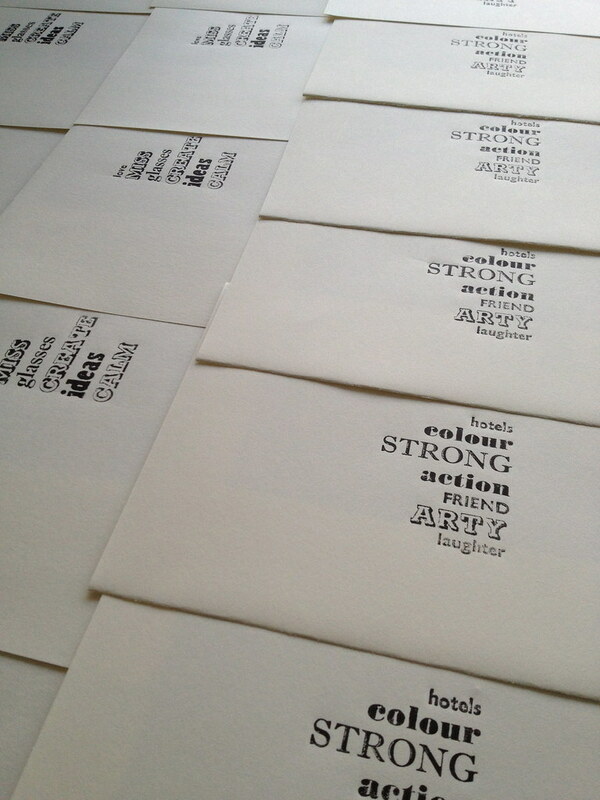 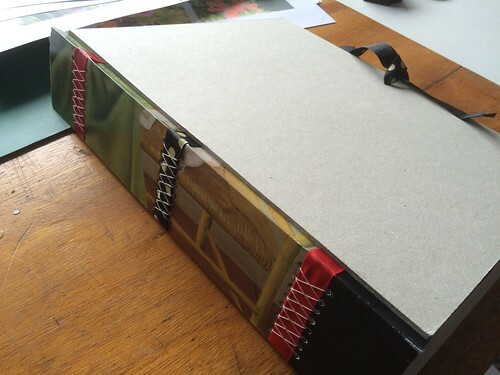 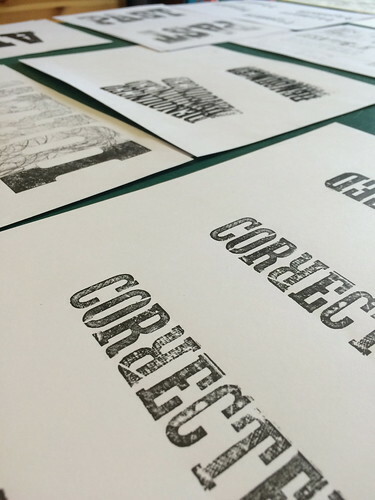 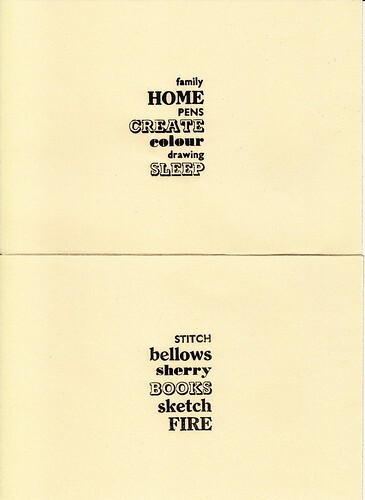 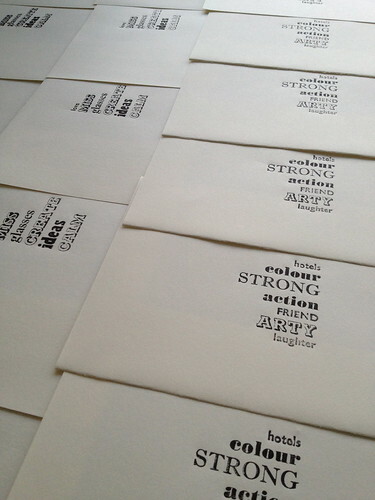 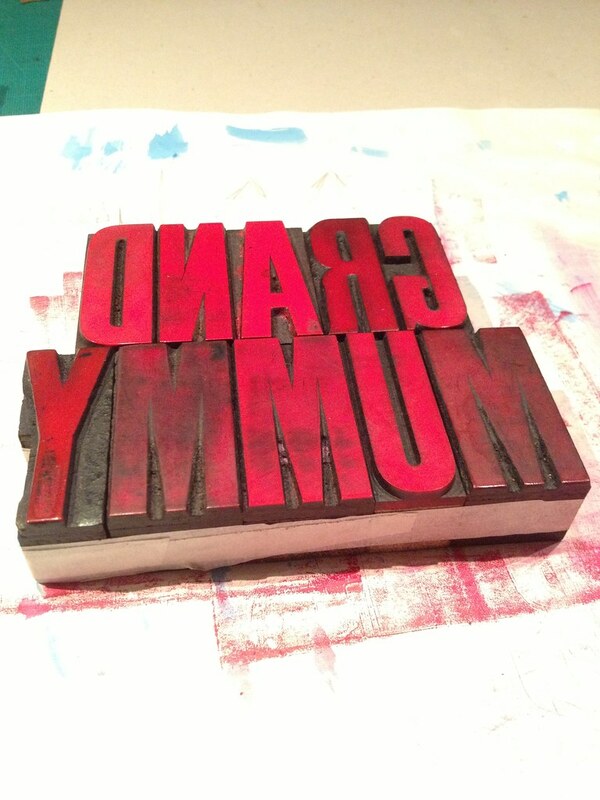 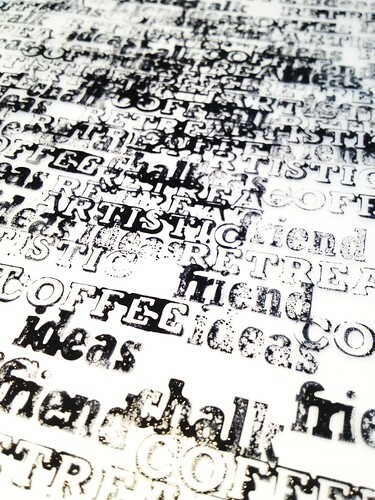 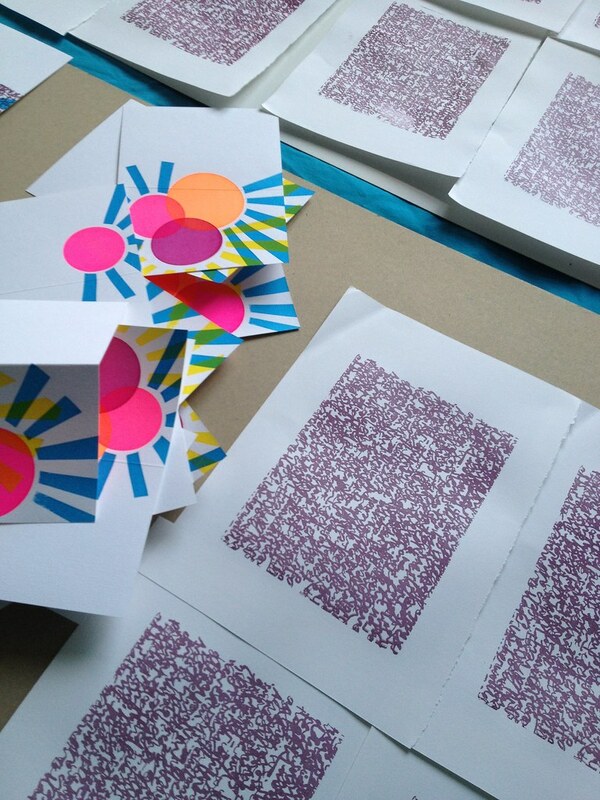 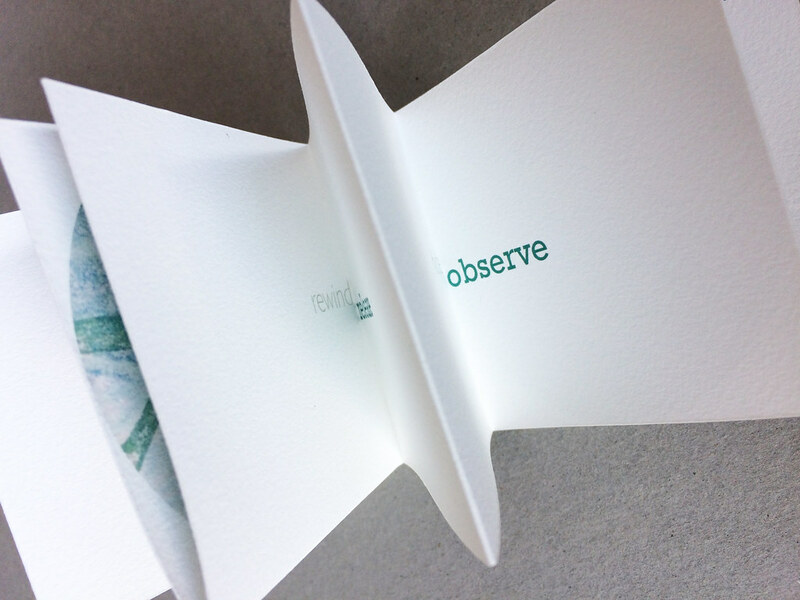 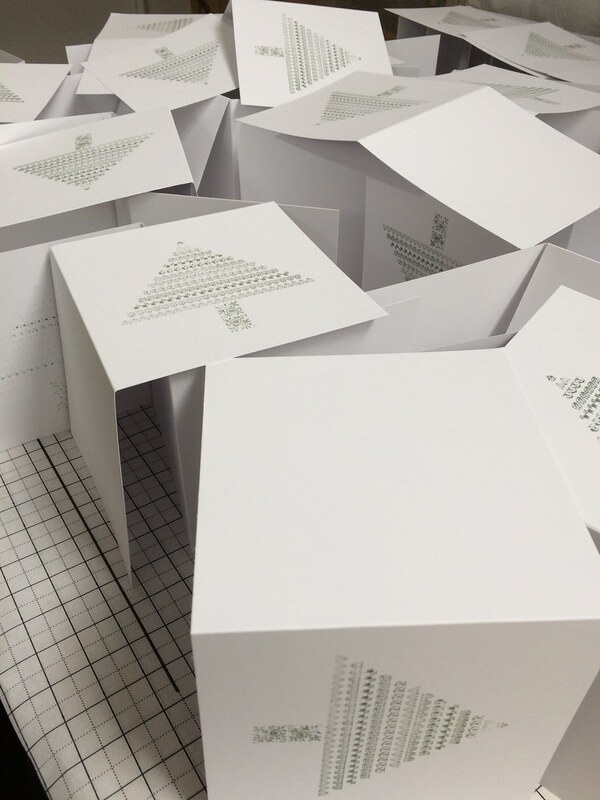 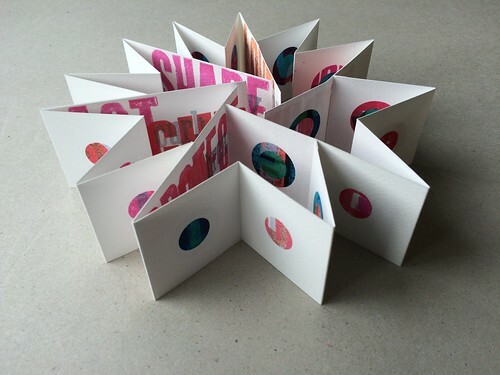 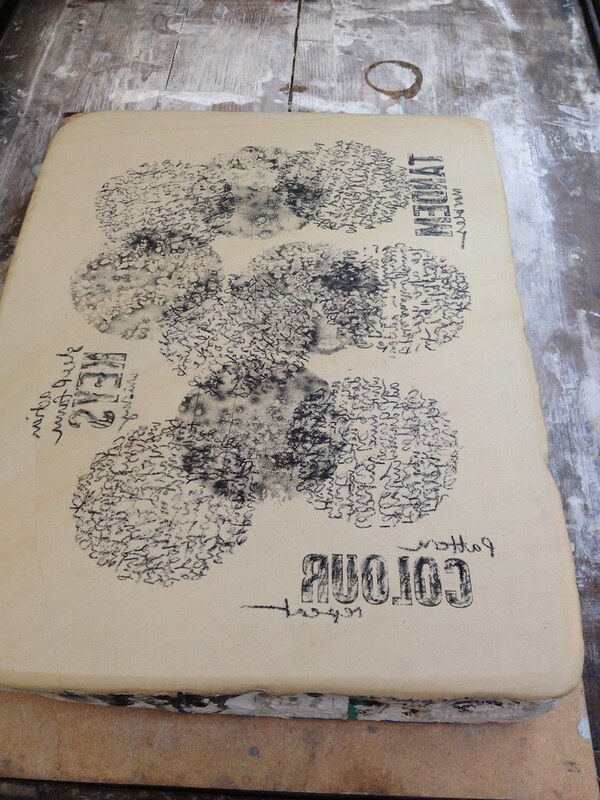 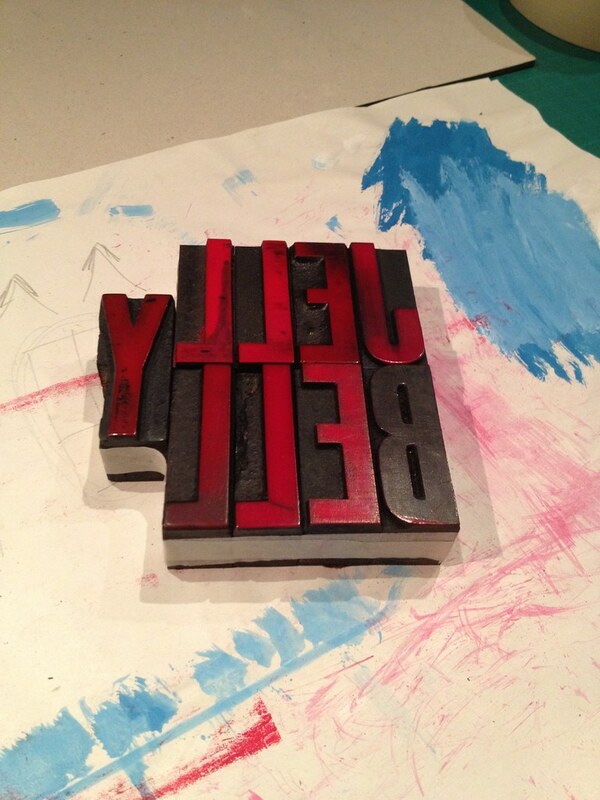 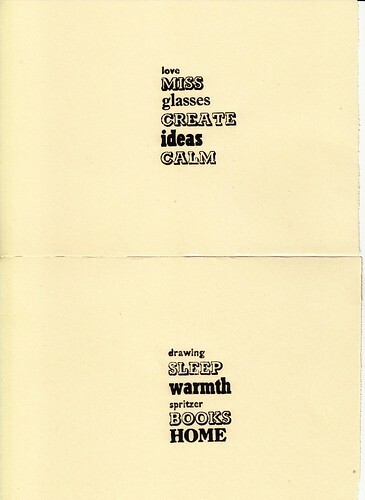 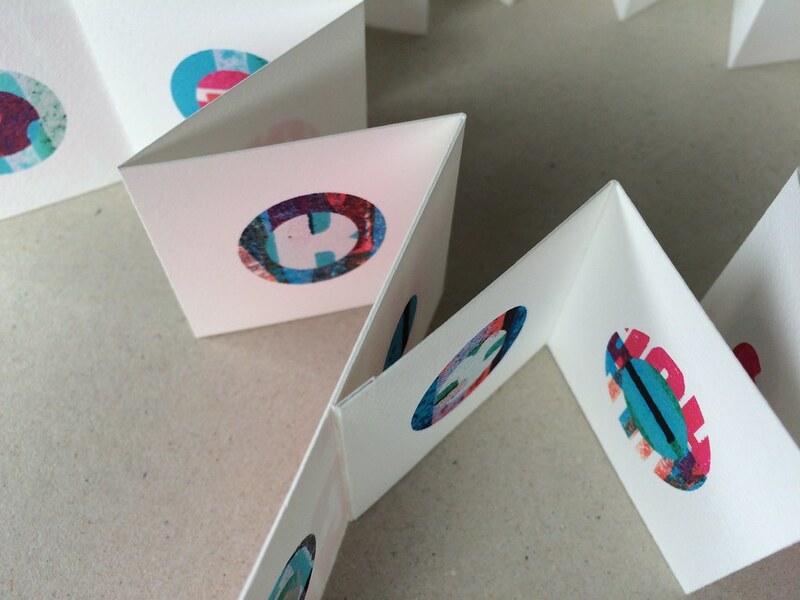 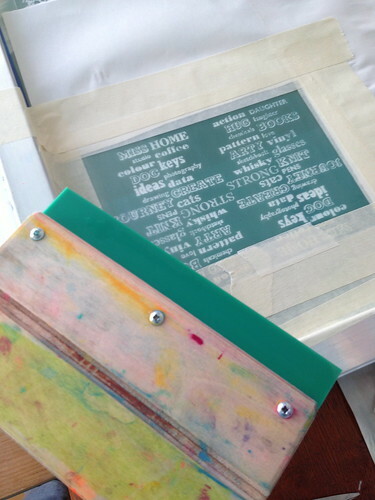 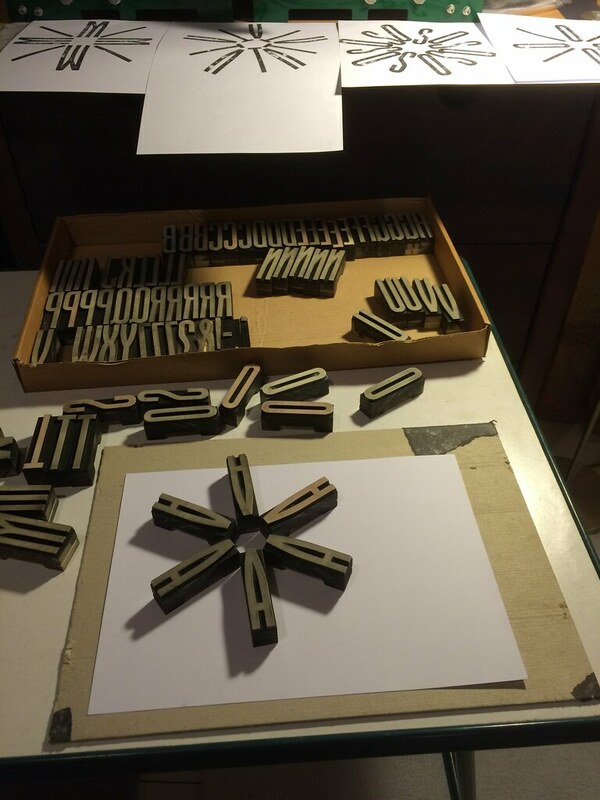 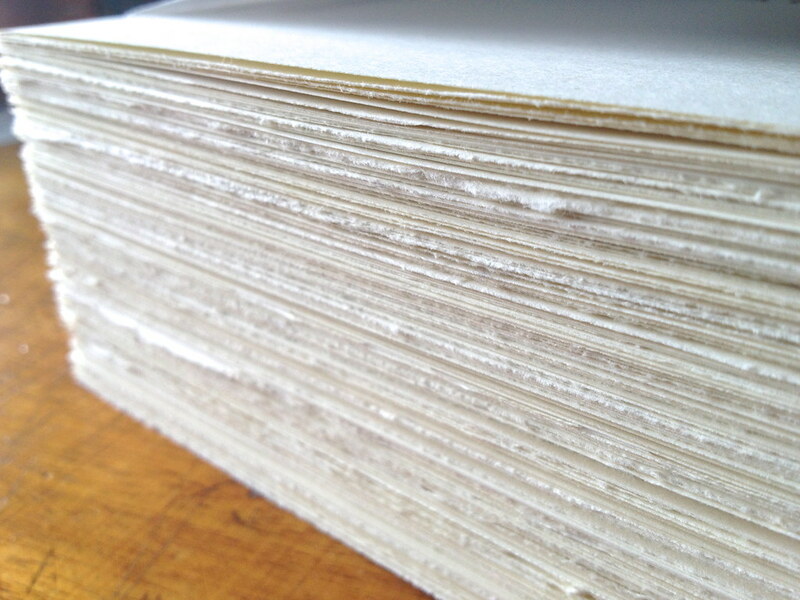 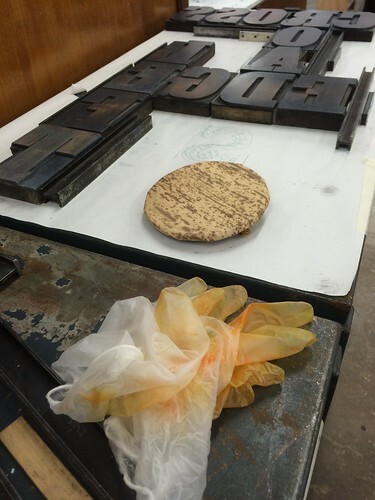 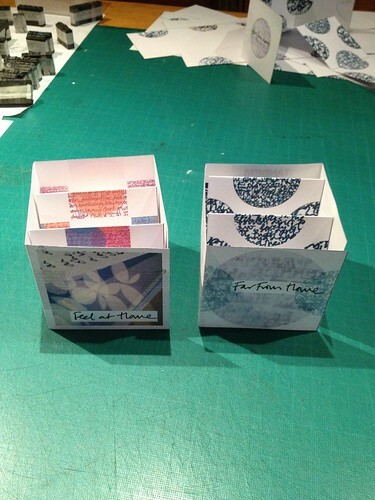 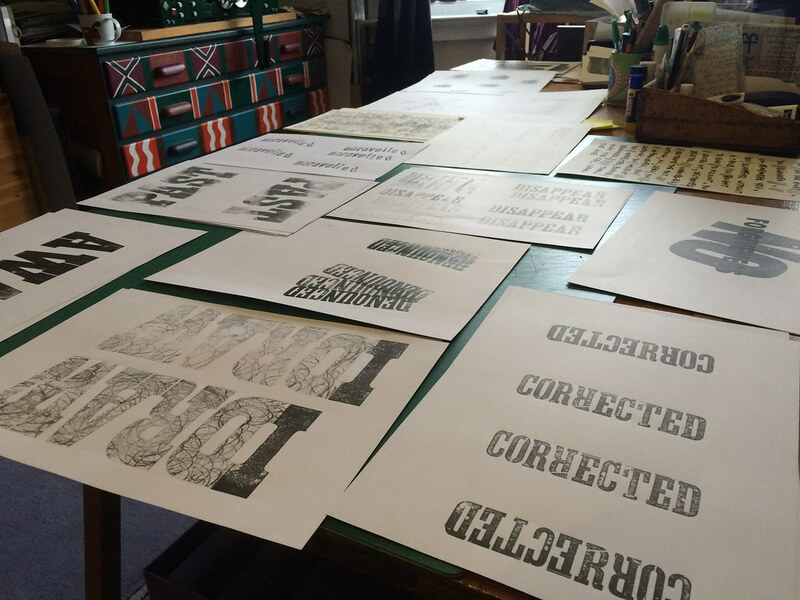 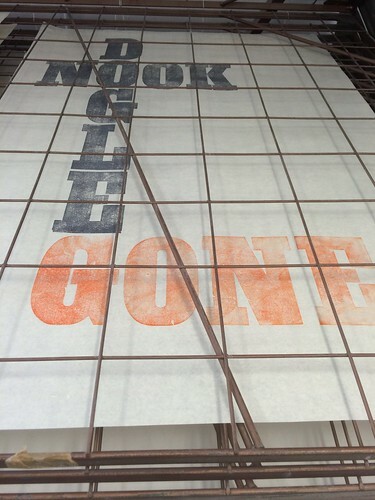 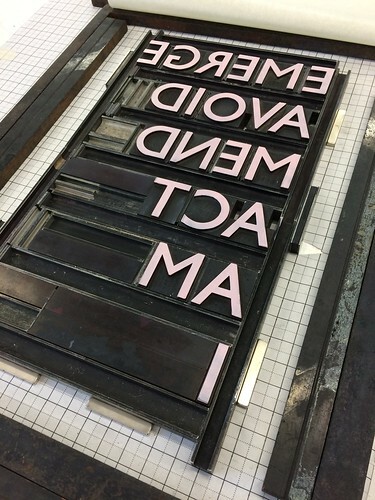 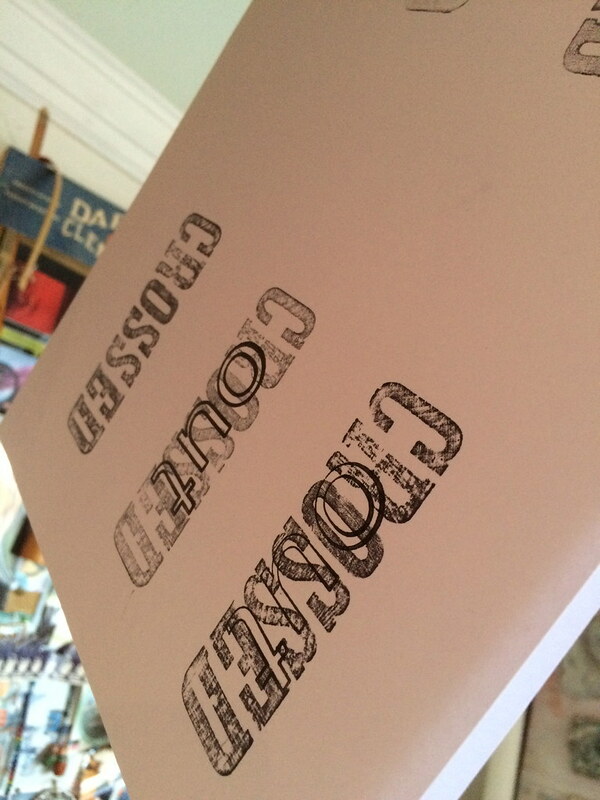 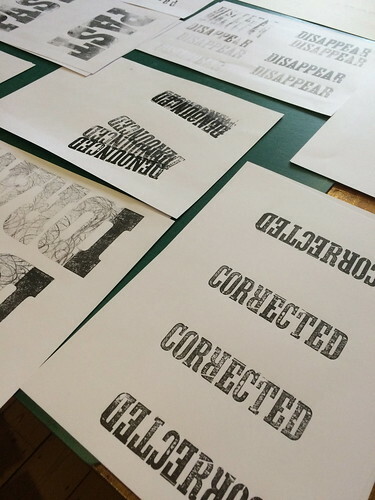 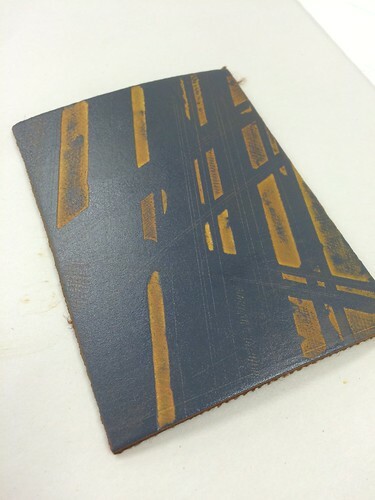 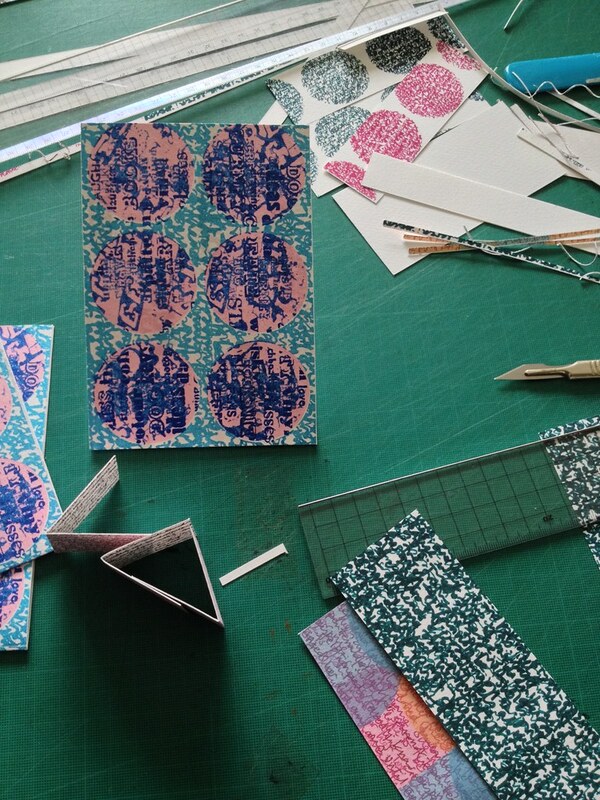 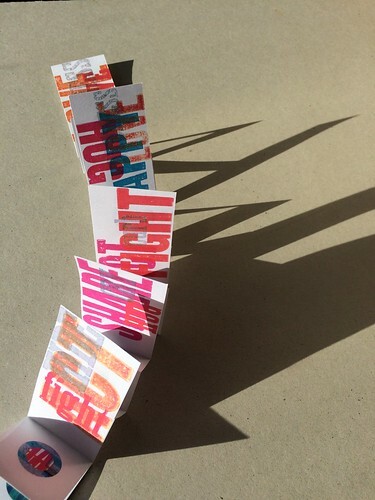 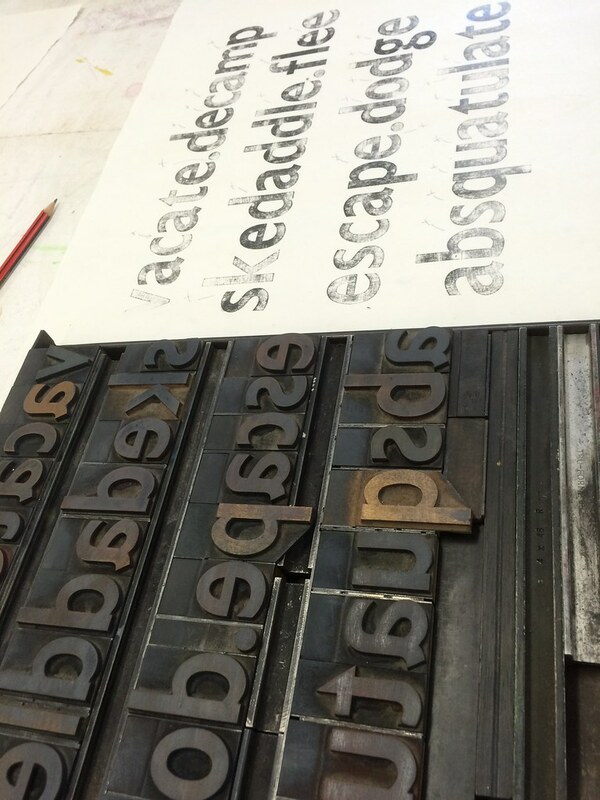 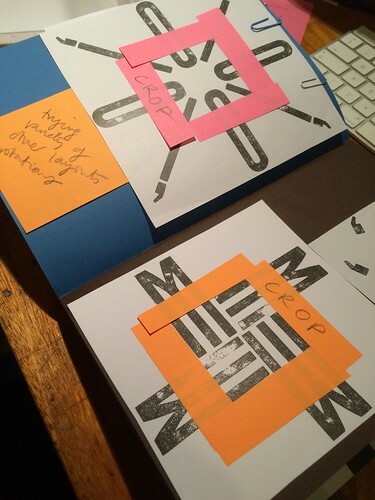 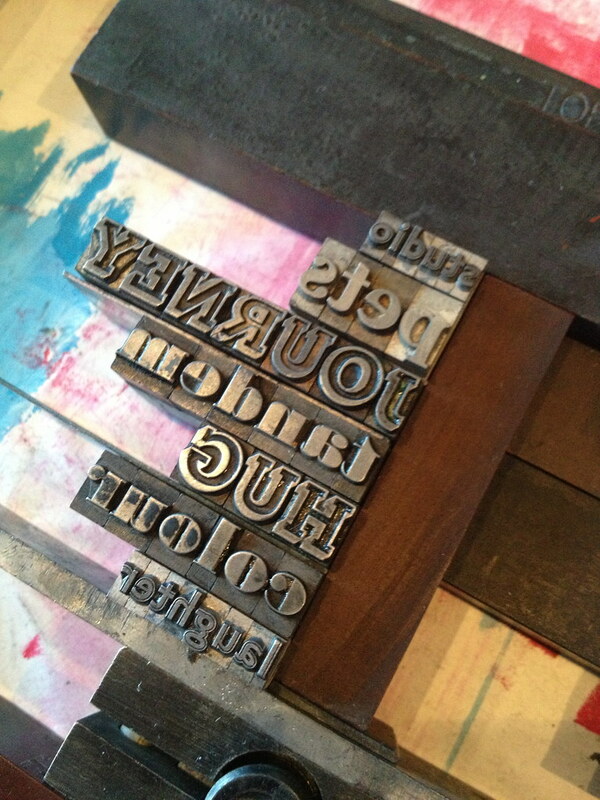 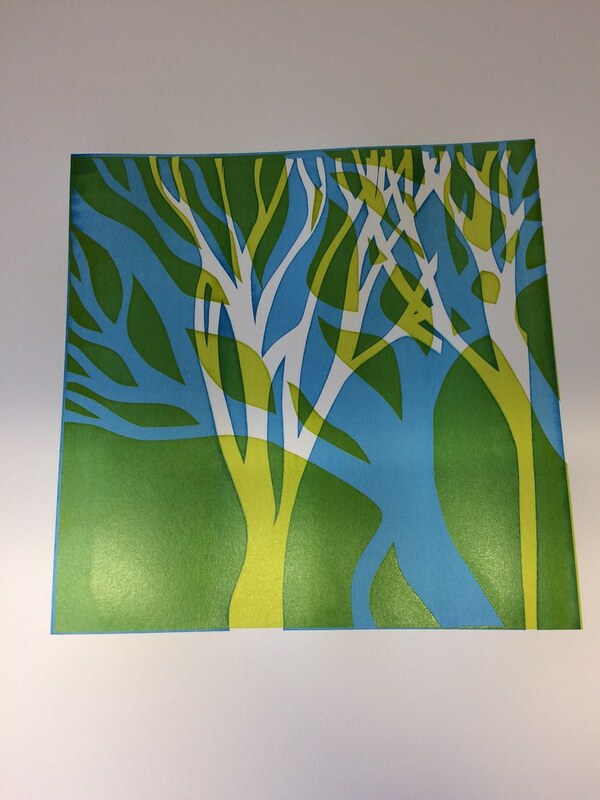 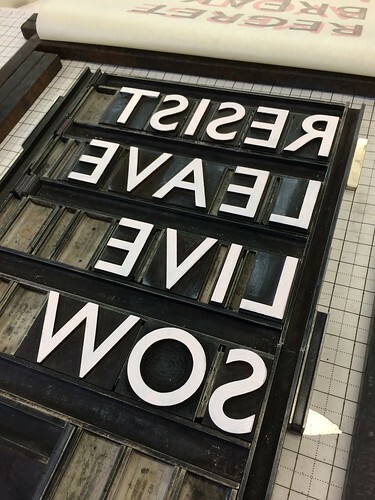 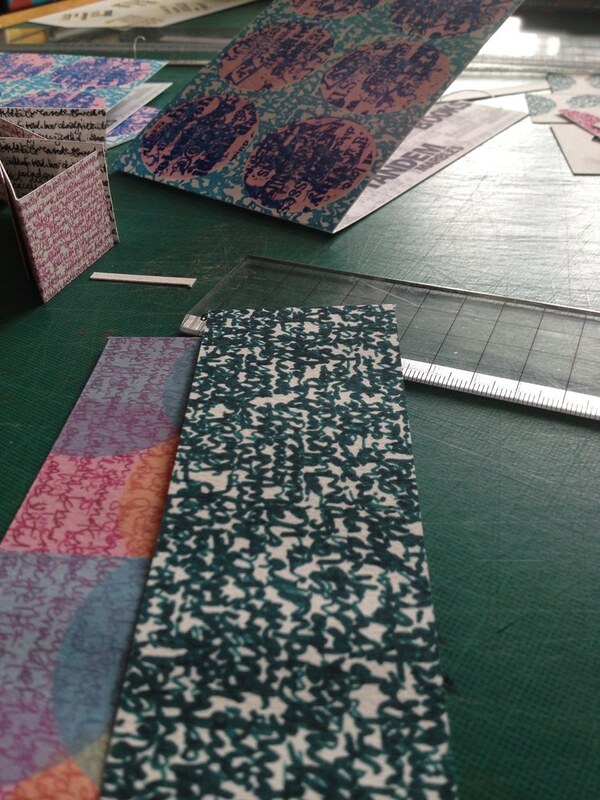 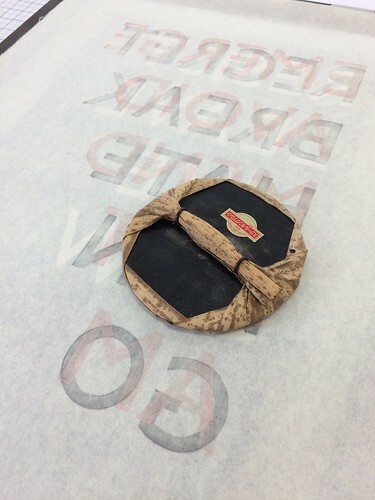 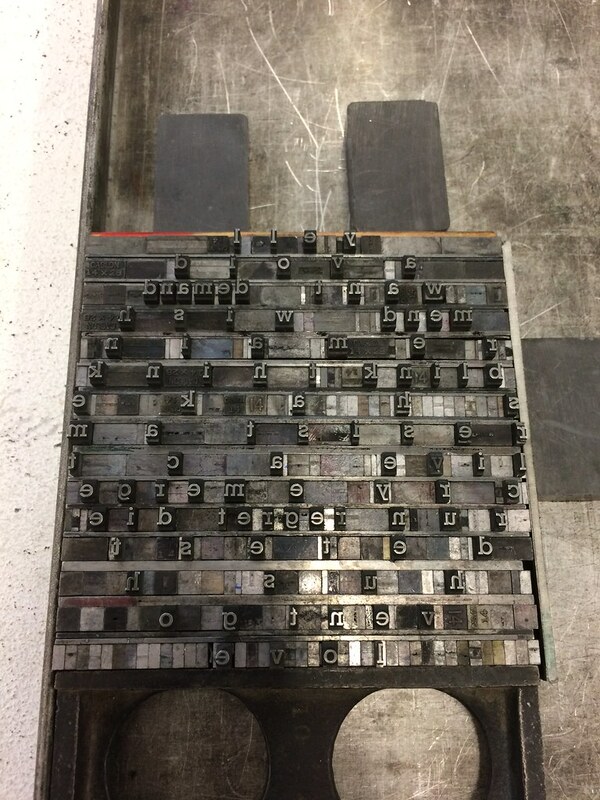 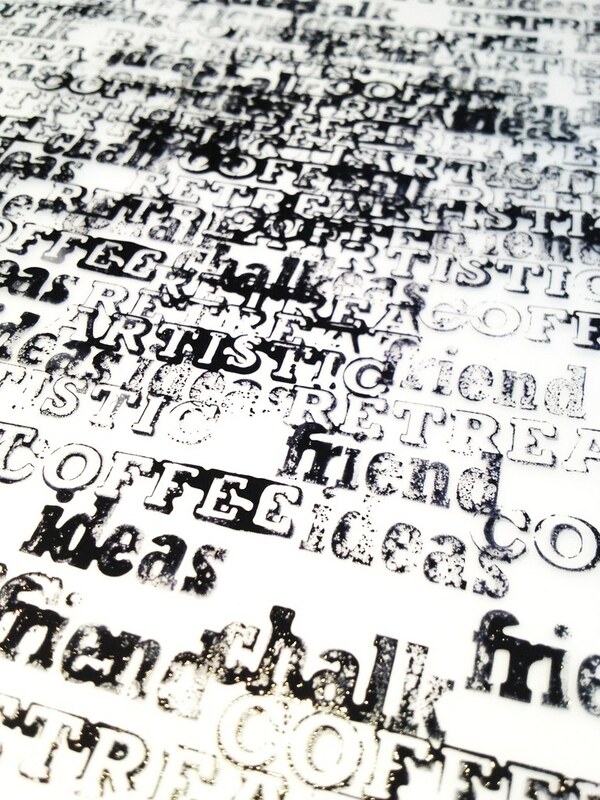 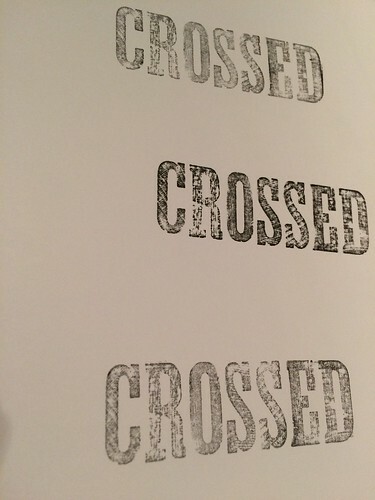 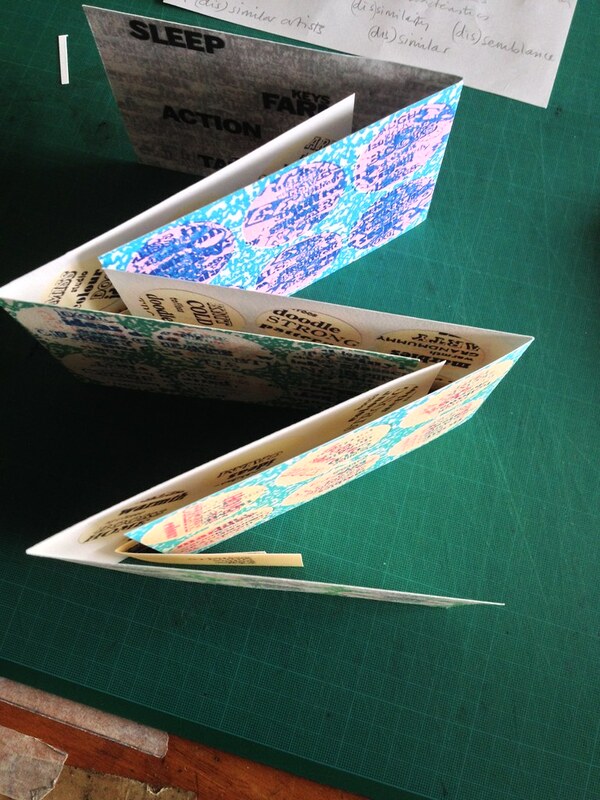 Emma’s book was created using wooden letterpress with digital implementation at the final stage. 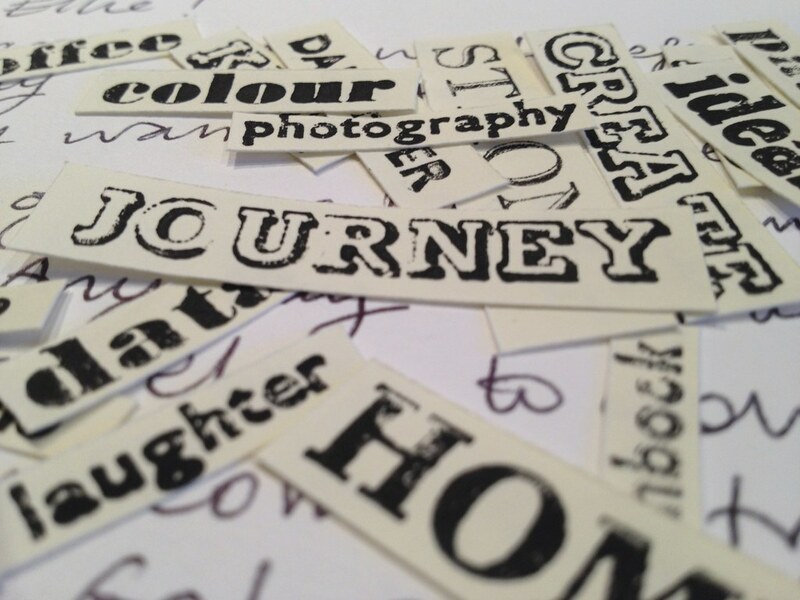 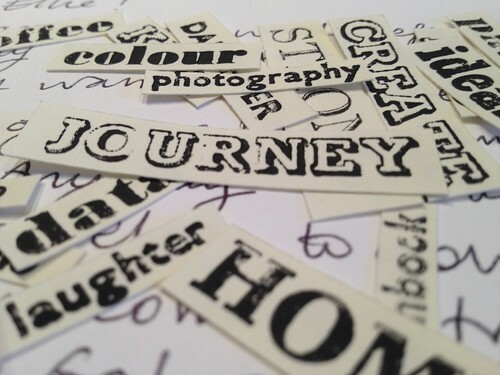 Her words explore the ebb and flow of emotions around the topics of depression, anxiety and fear. 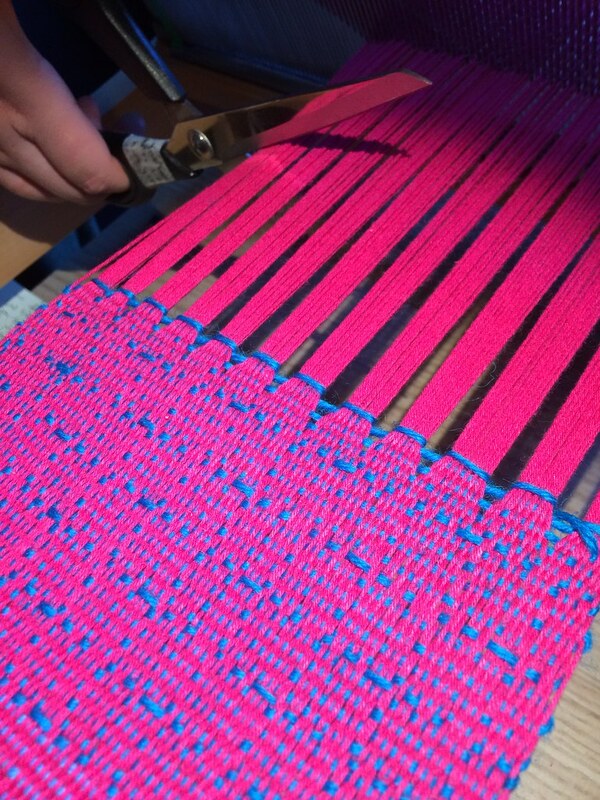 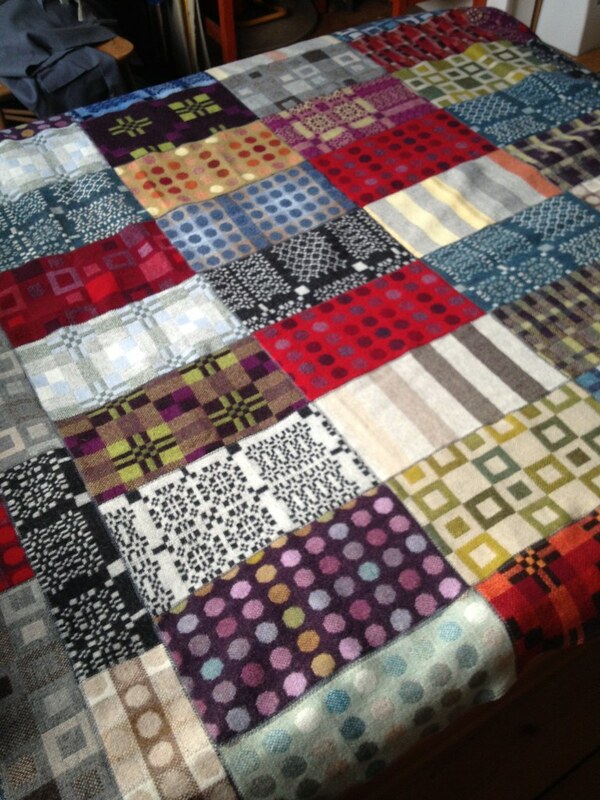 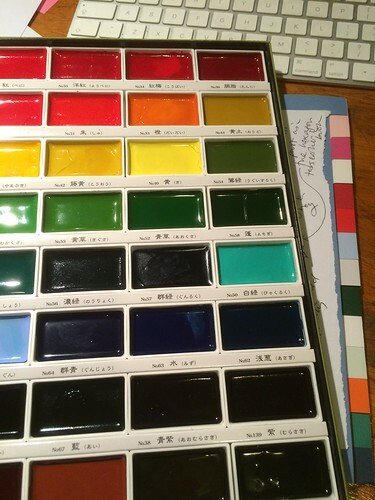 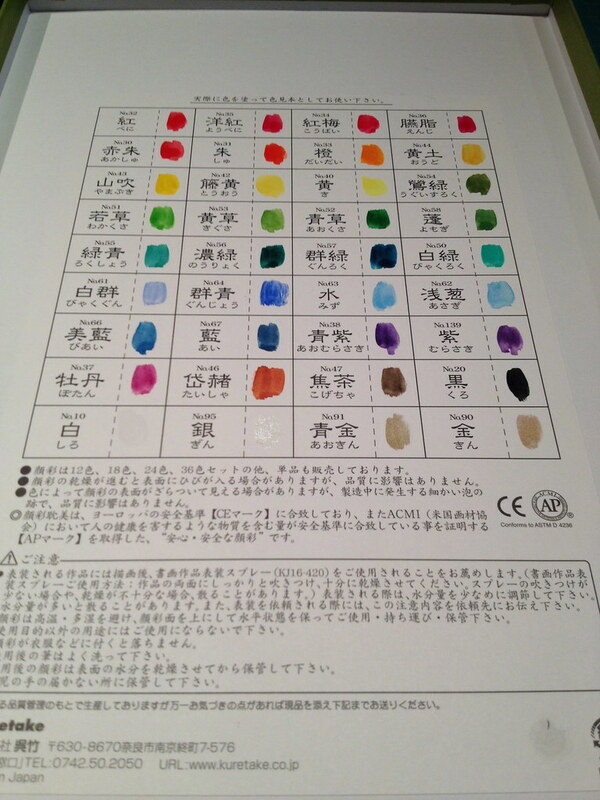 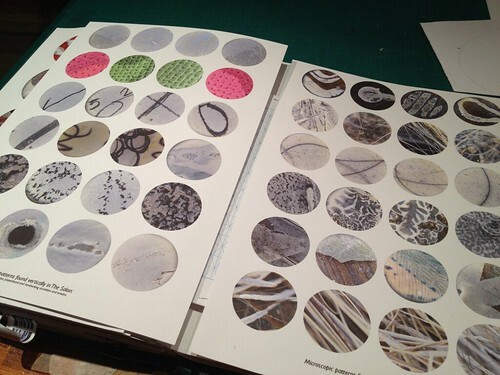 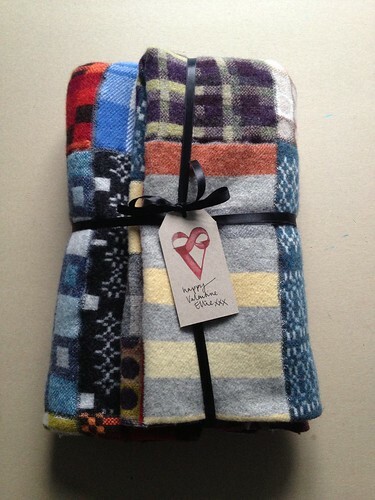 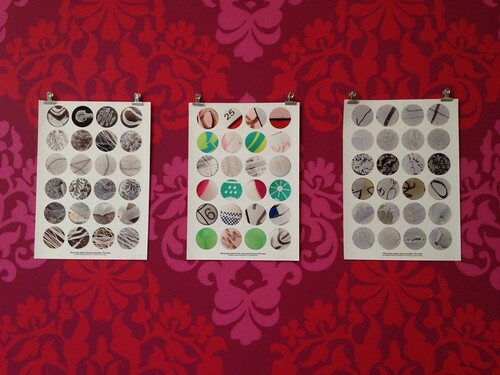 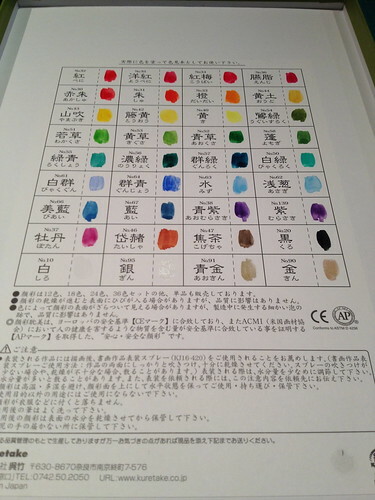 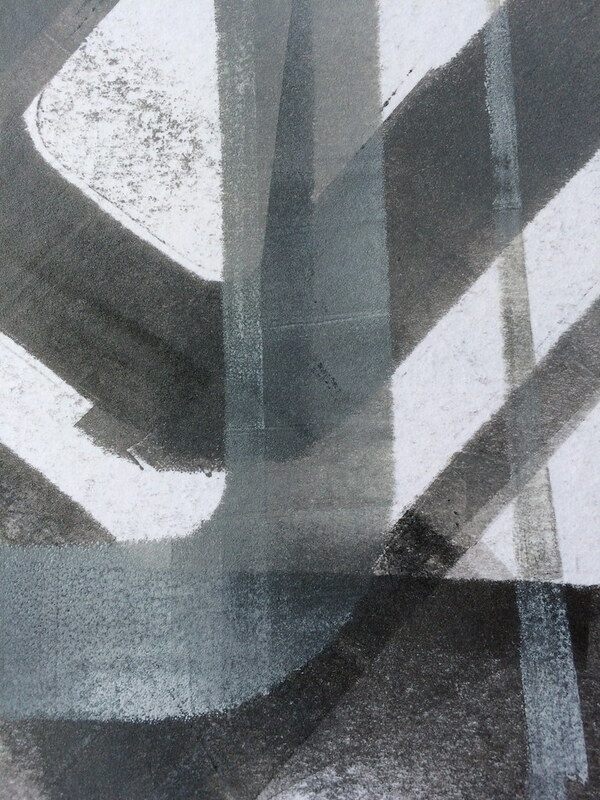 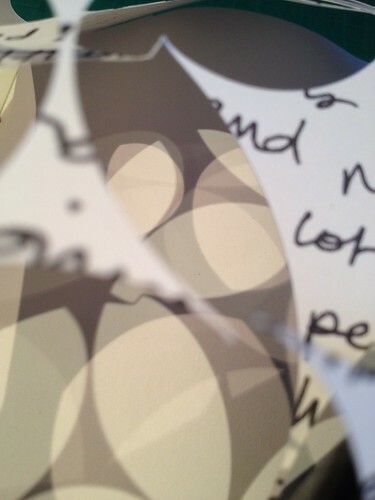 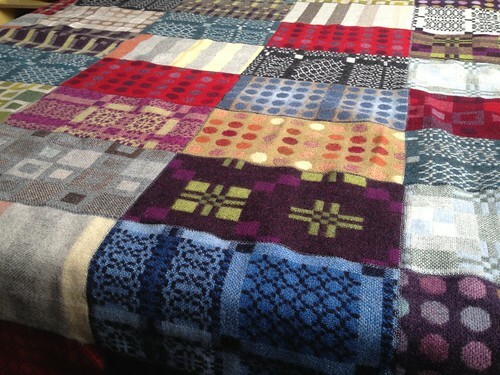 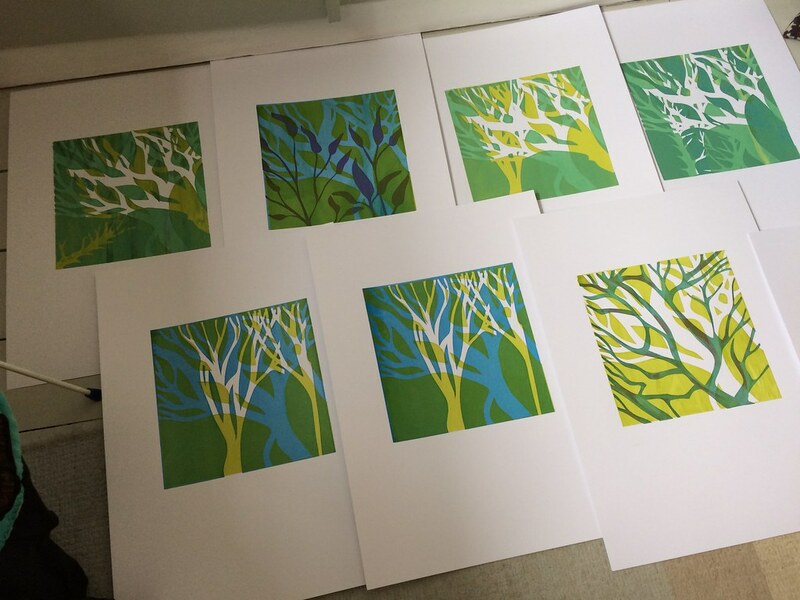 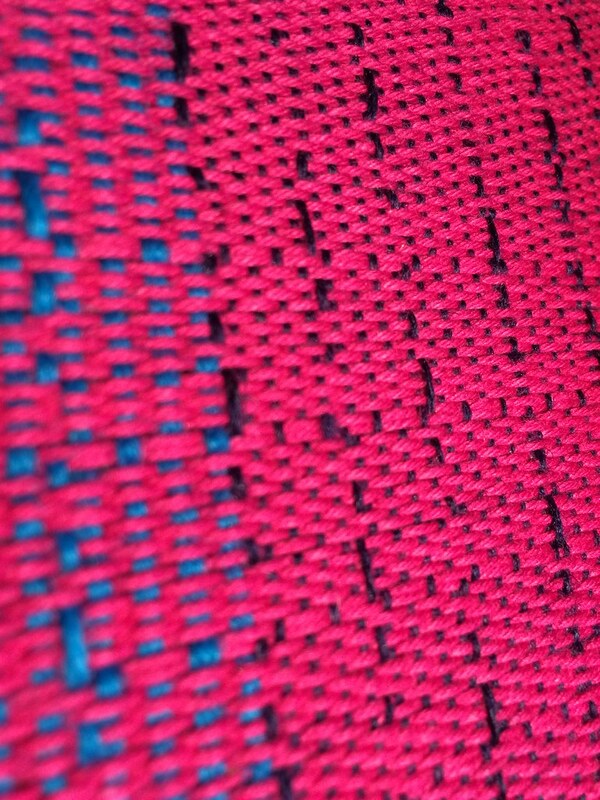 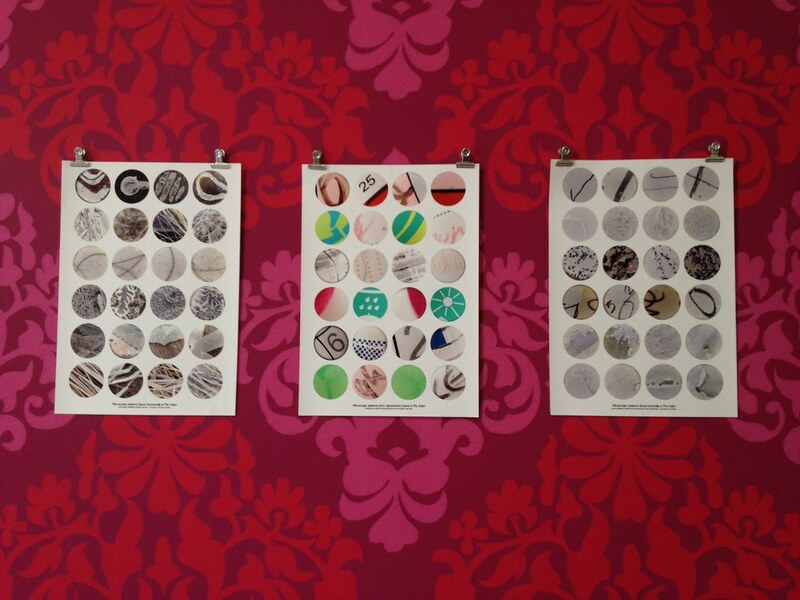 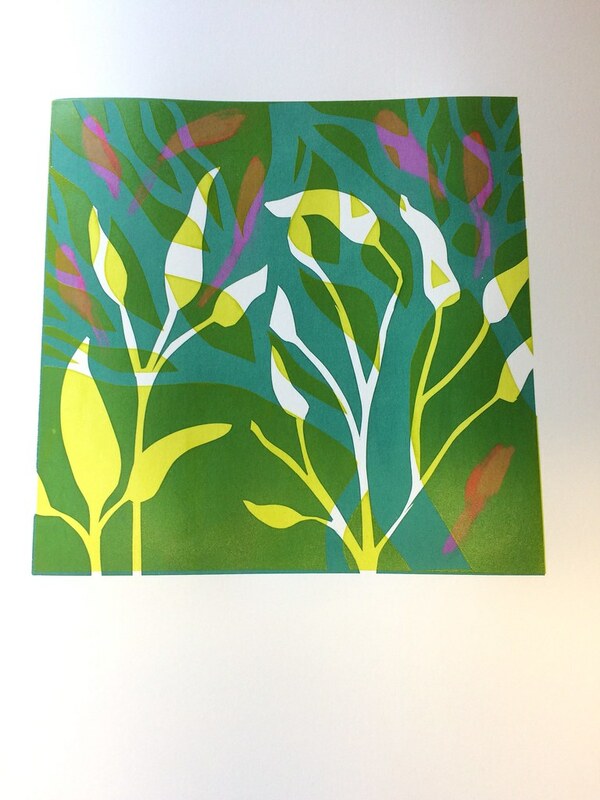 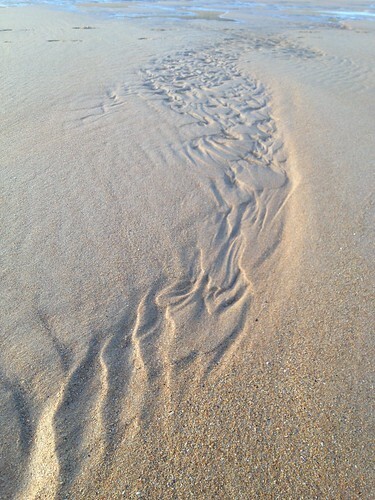 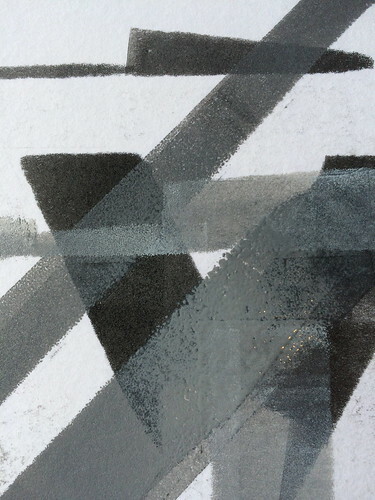 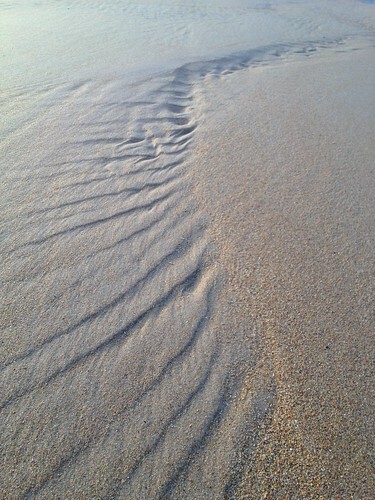 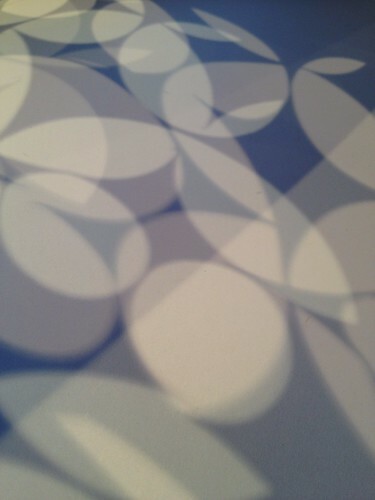 It is a physical attempt to make the positives outweigh the negatives though the use of pattern, colour and cropping. 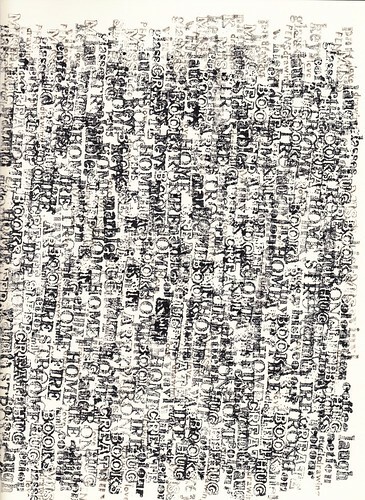 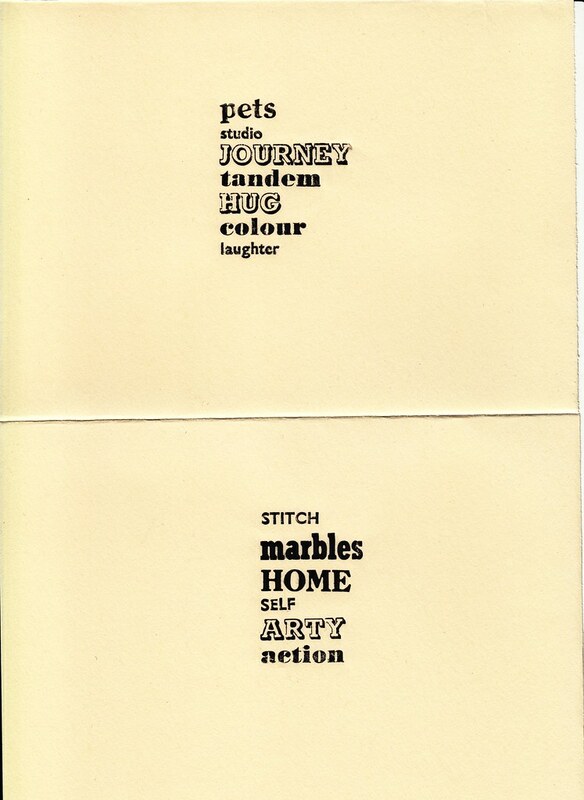 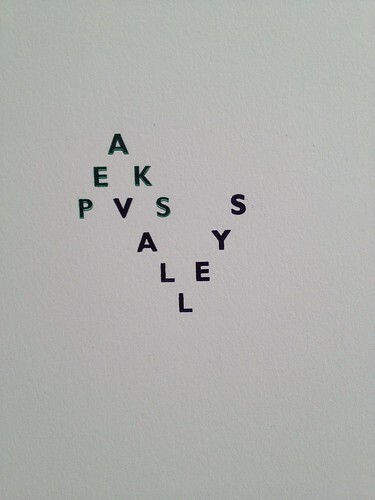 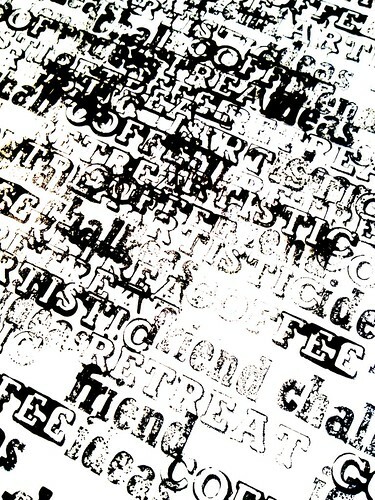 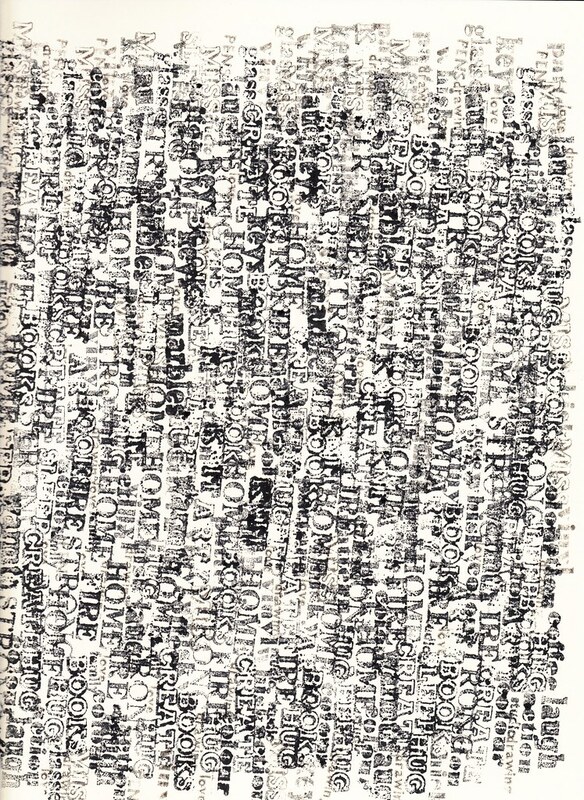 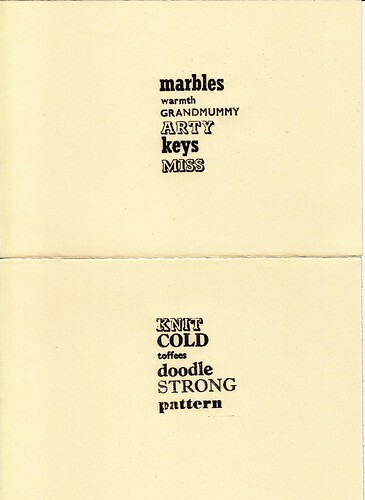 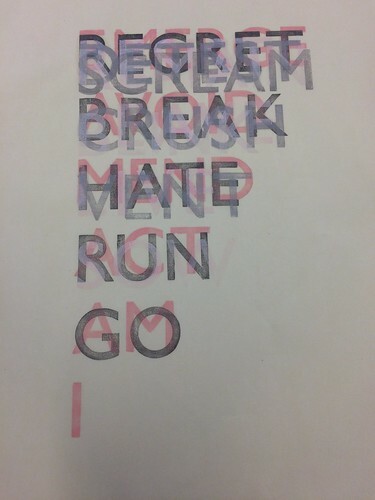 Different combinations of words based on different combinations of the 4 participants. 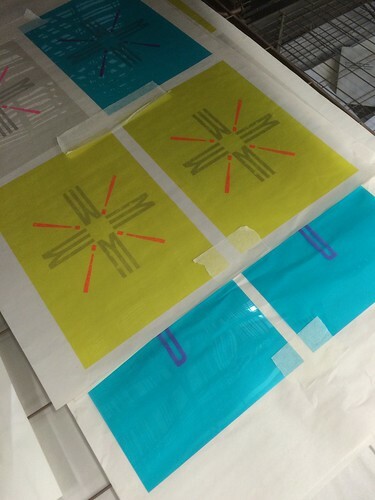 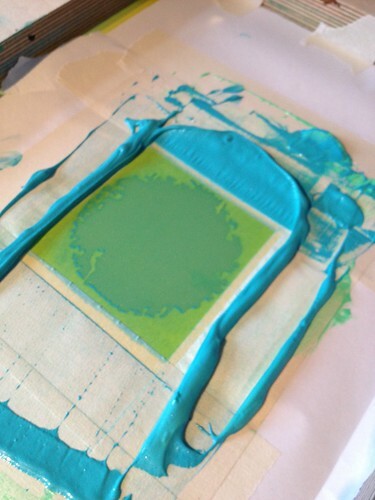 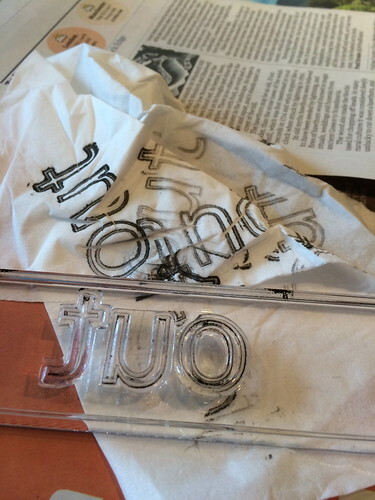 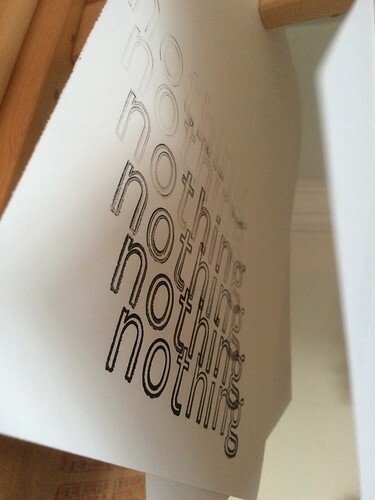 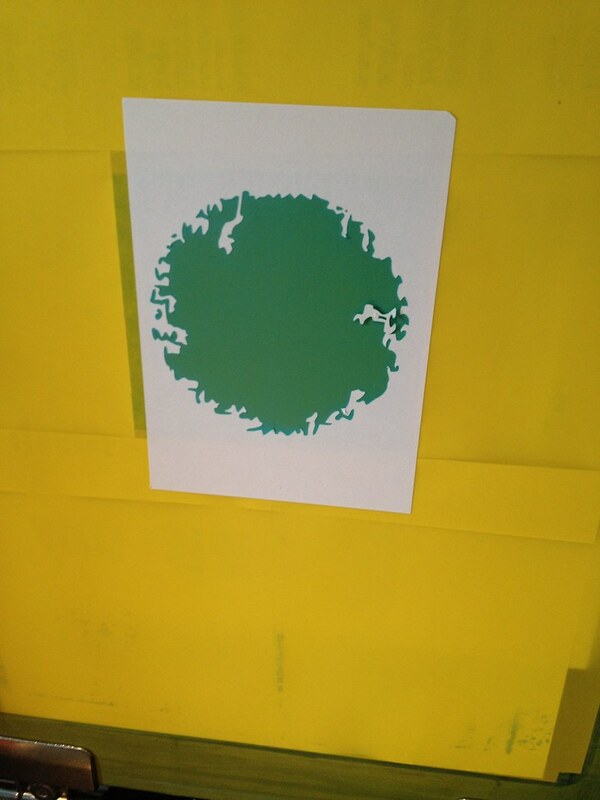 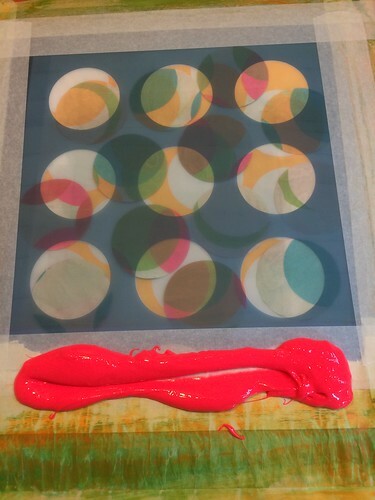 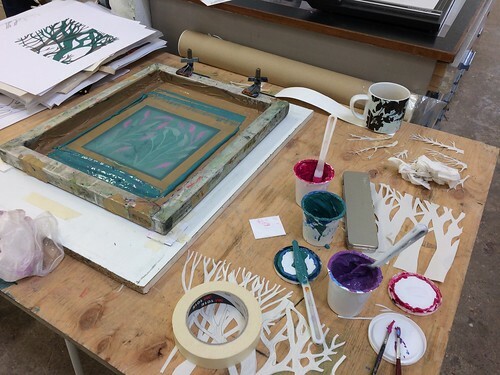 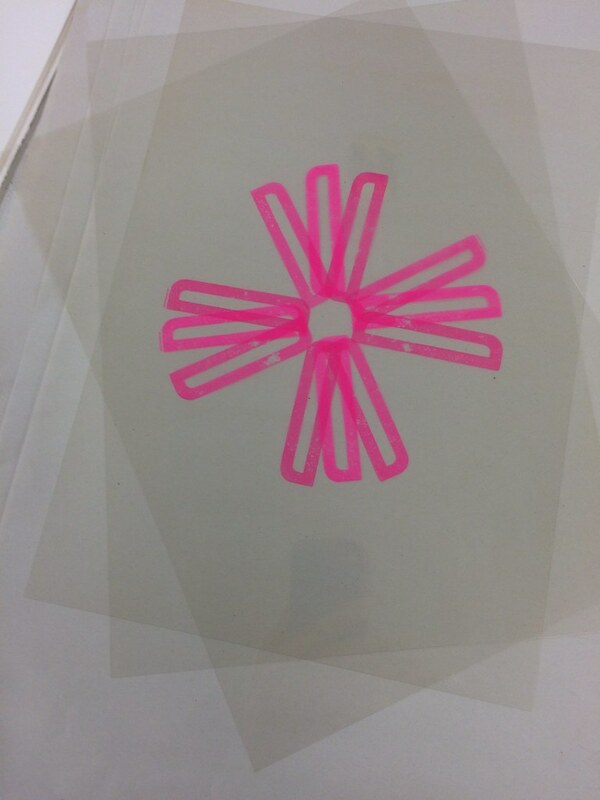 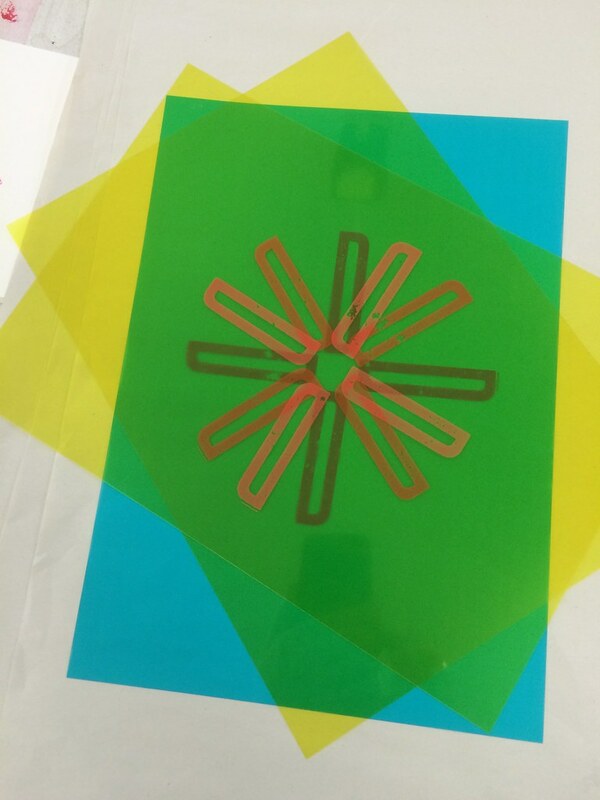 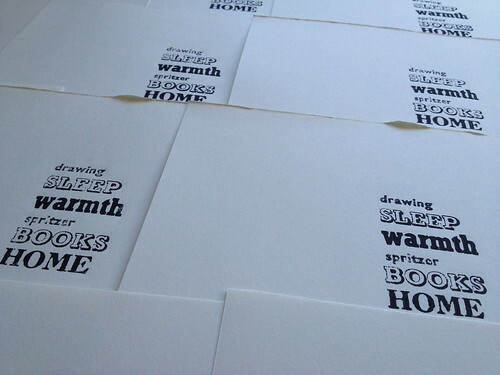 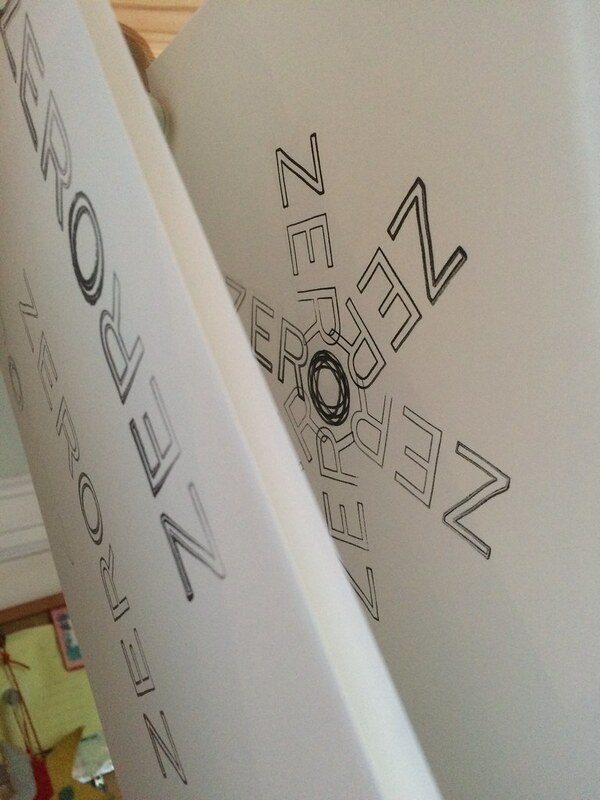 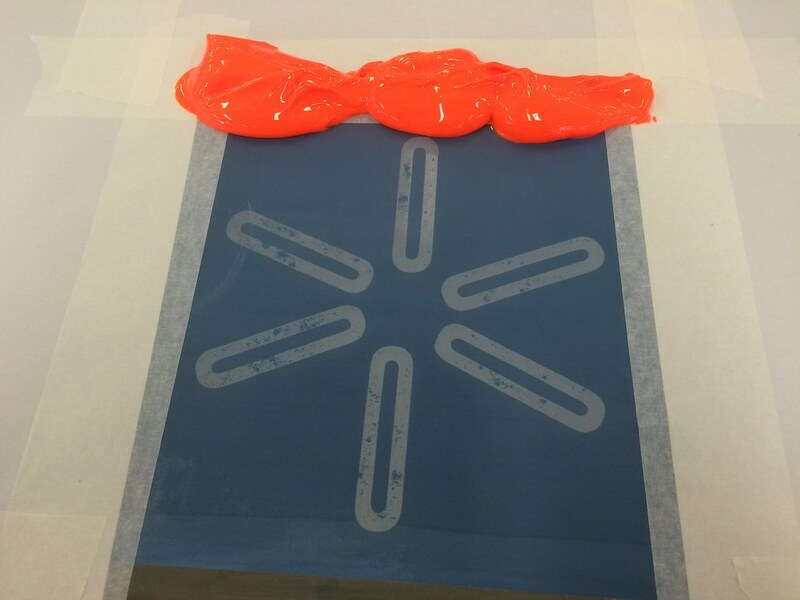 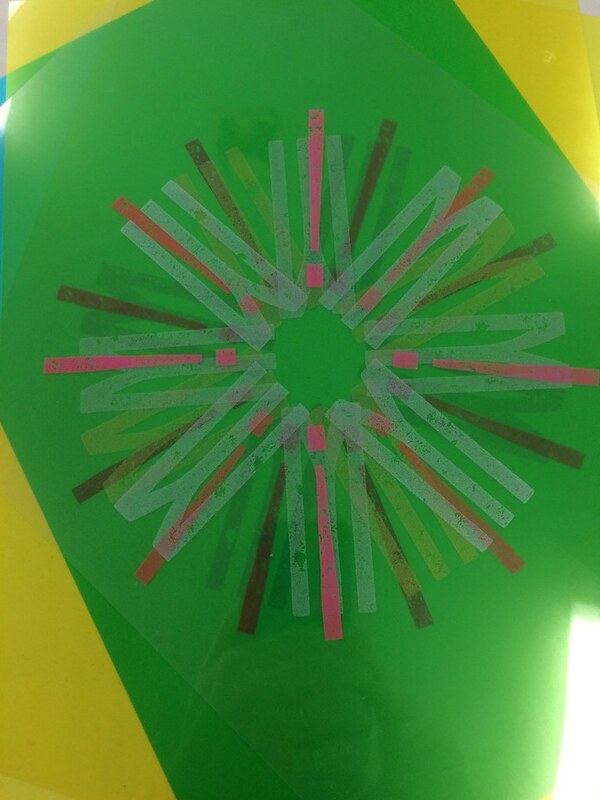 screenprinting tests for Home 2014 project. 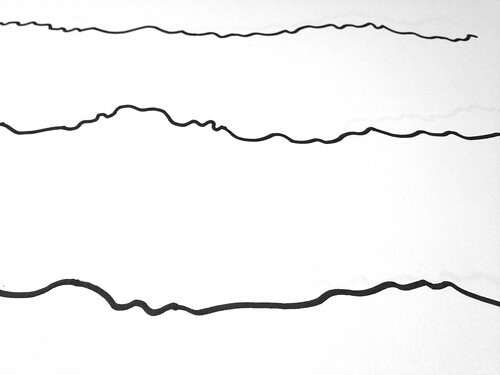 Probably going to be a series of 3 (or 4). 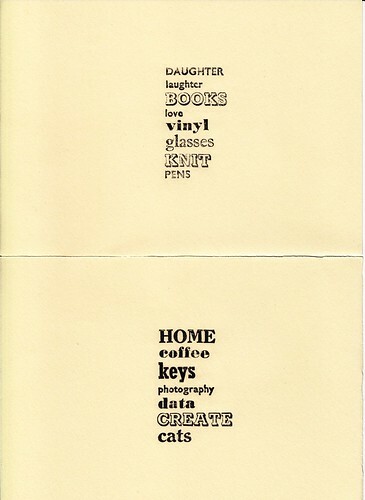 Based on 3 people and the words/objects I associate with them. 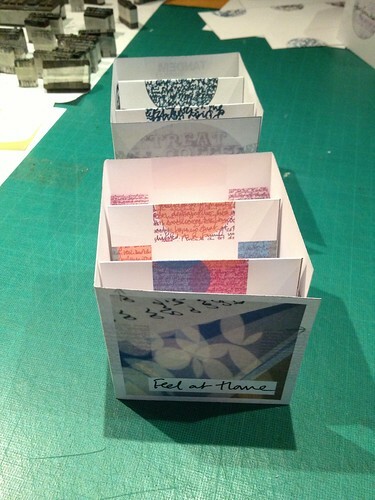 The structure has 4 sides like a room and a section that folds out like the floor or bits of furniture. I recently established this for graphics/illu degree students where I work. 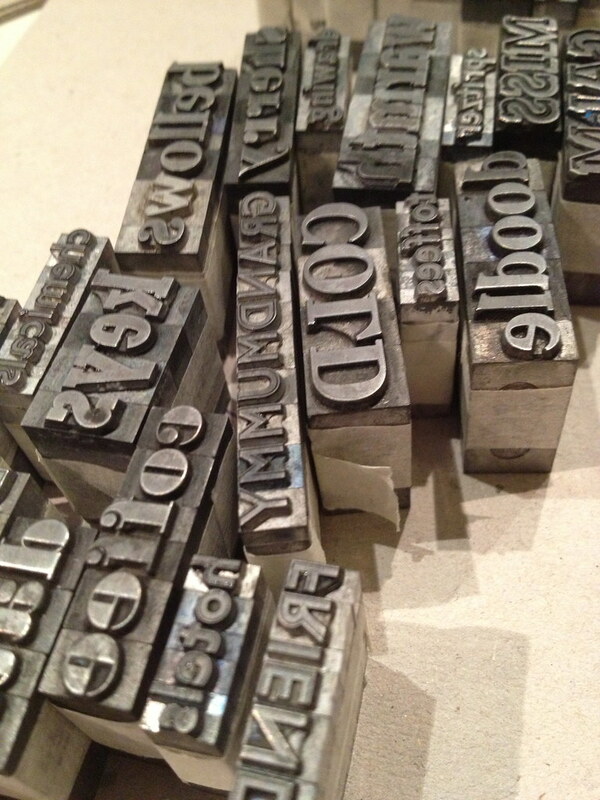 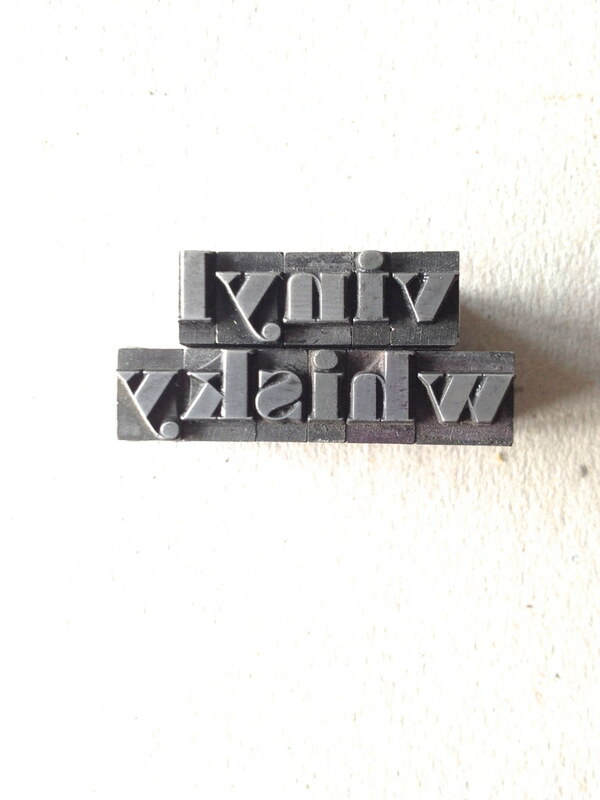 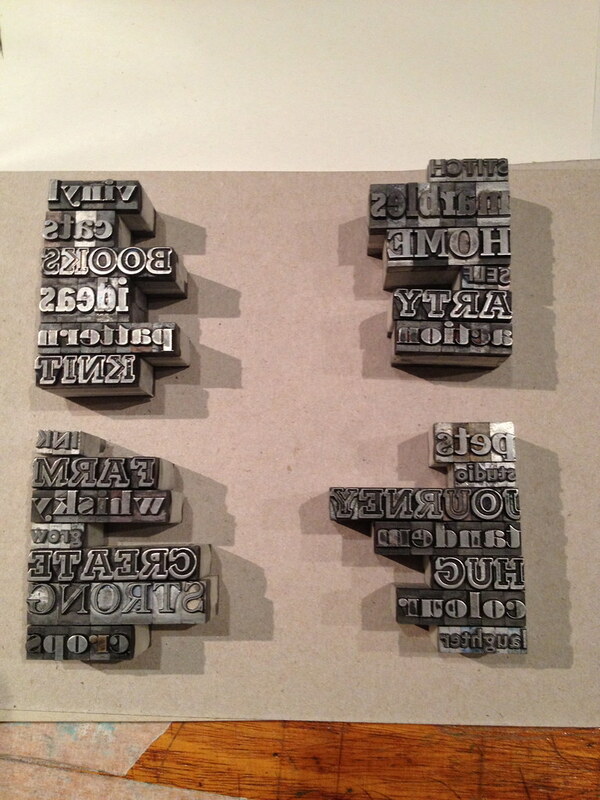 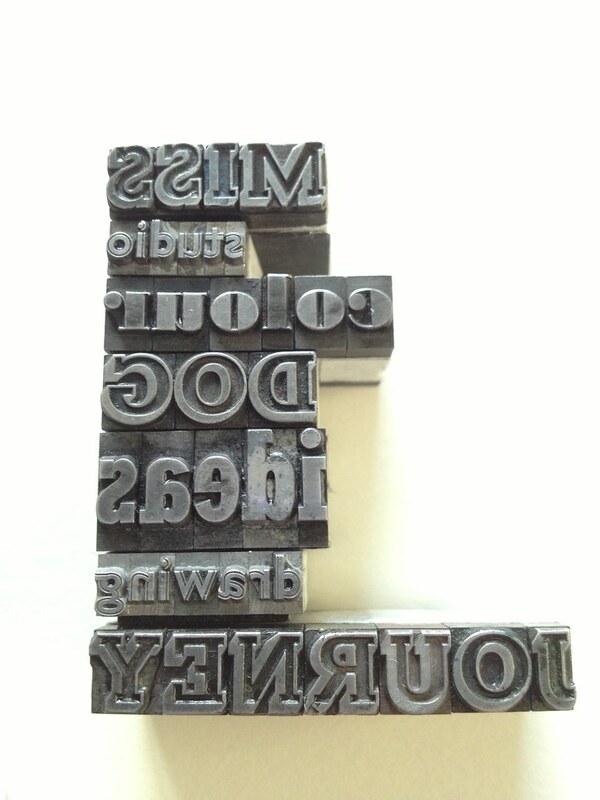 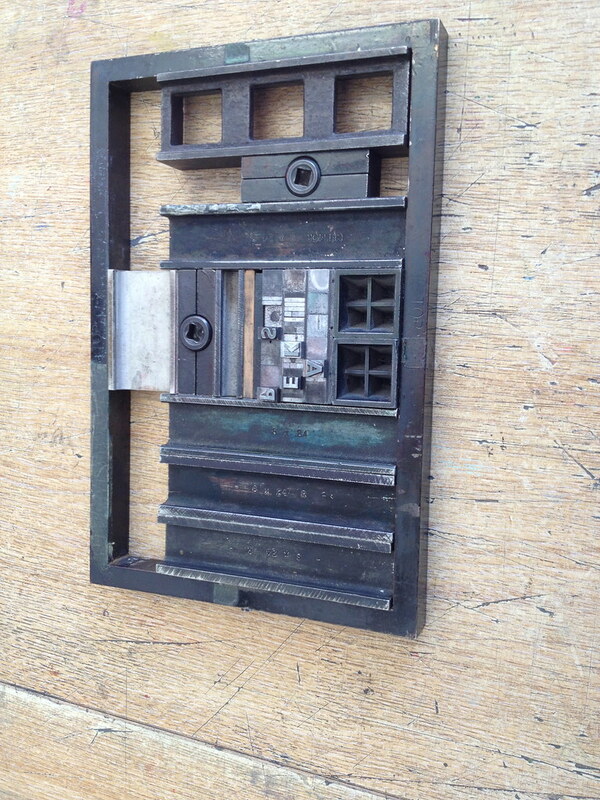 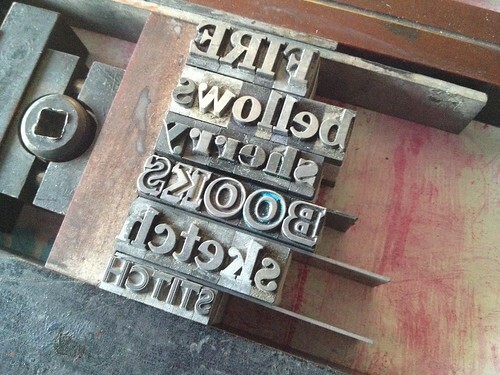 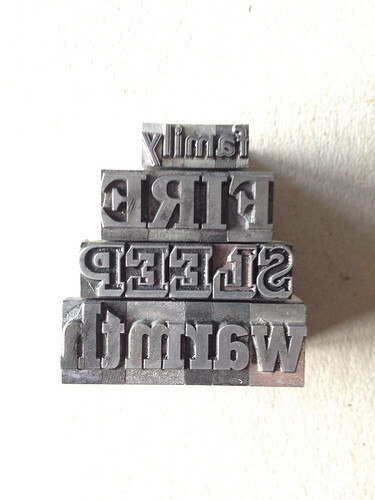 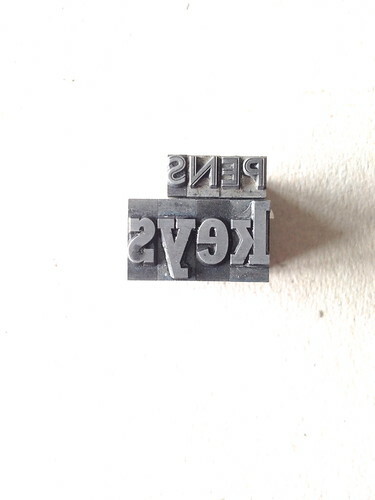 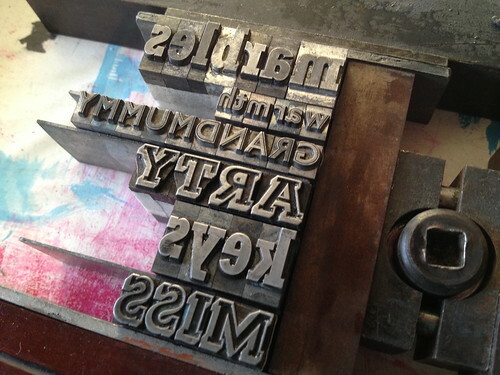 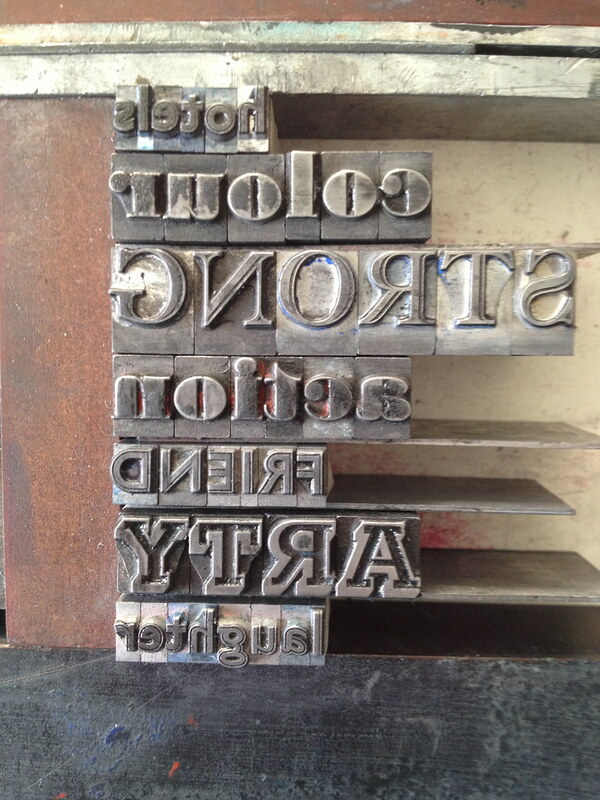 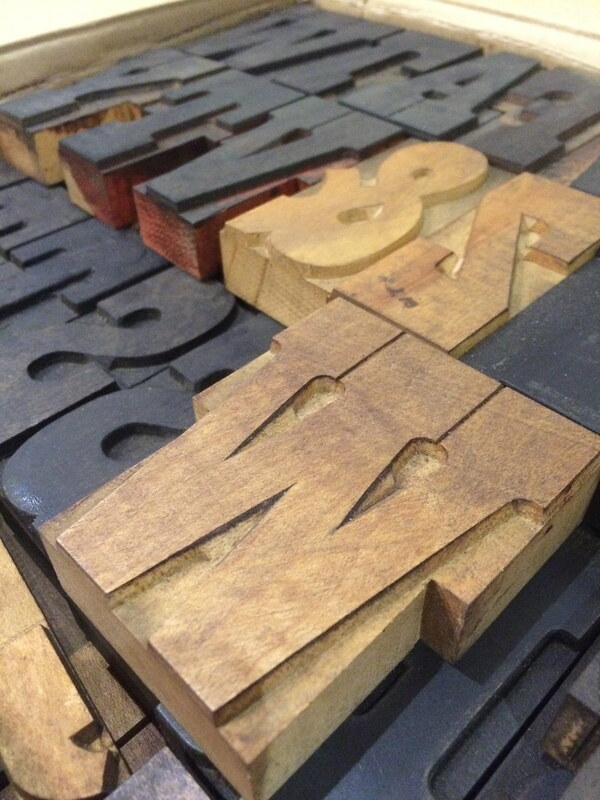 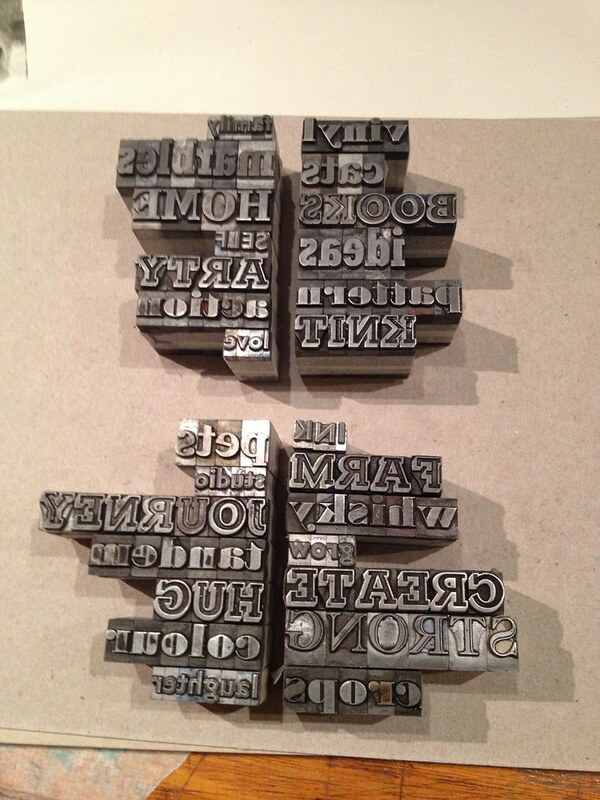 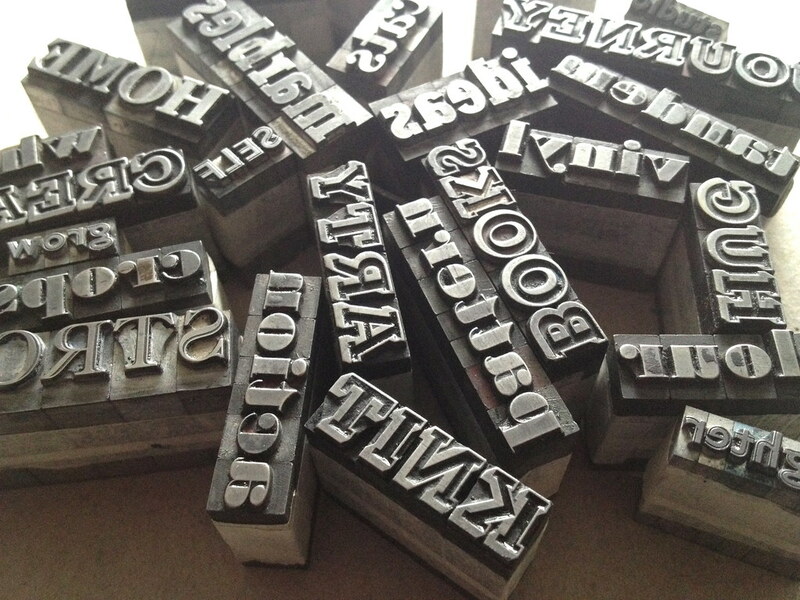 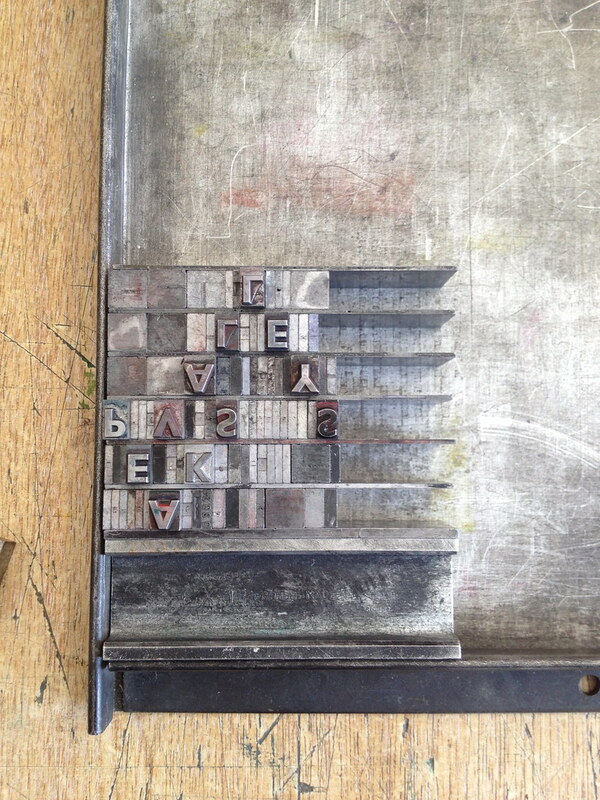 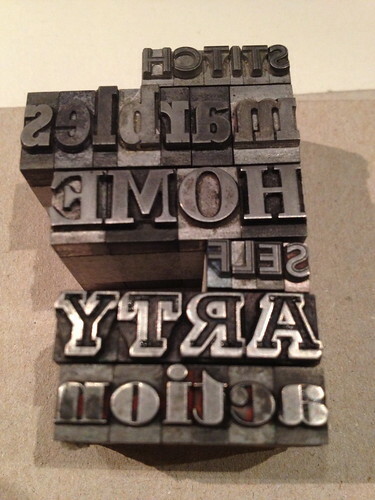 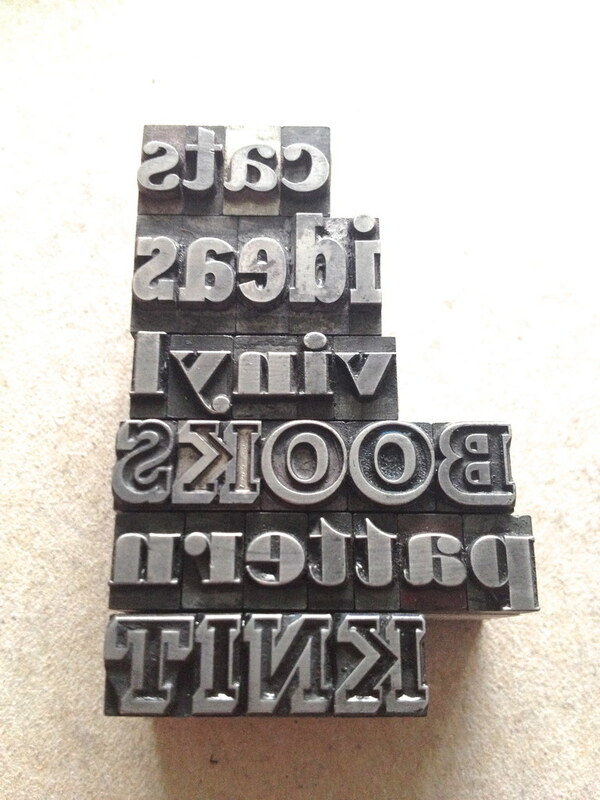 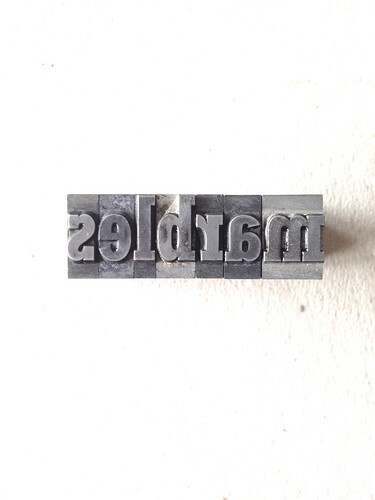 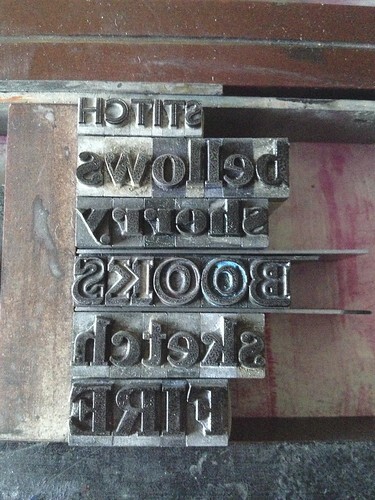 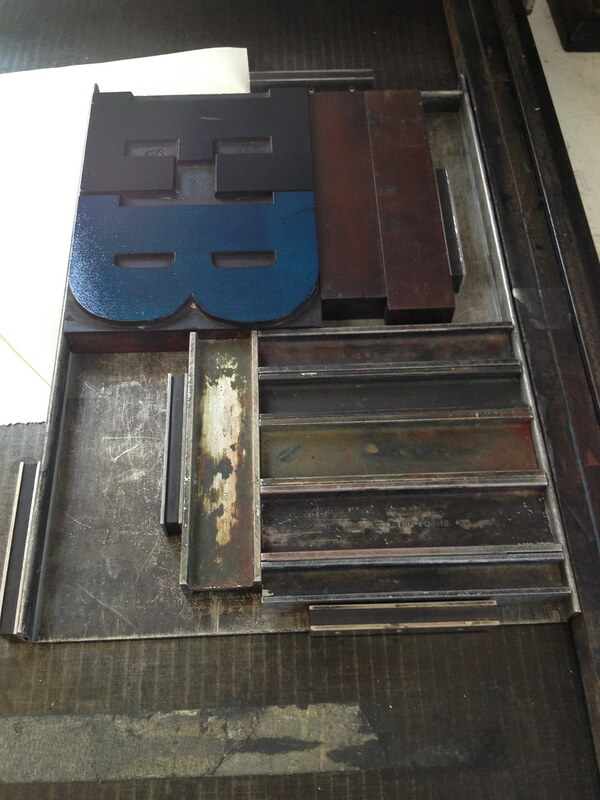 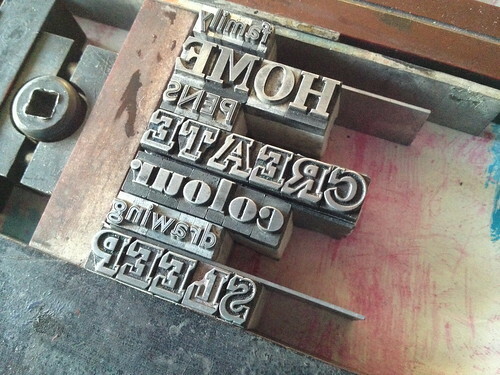 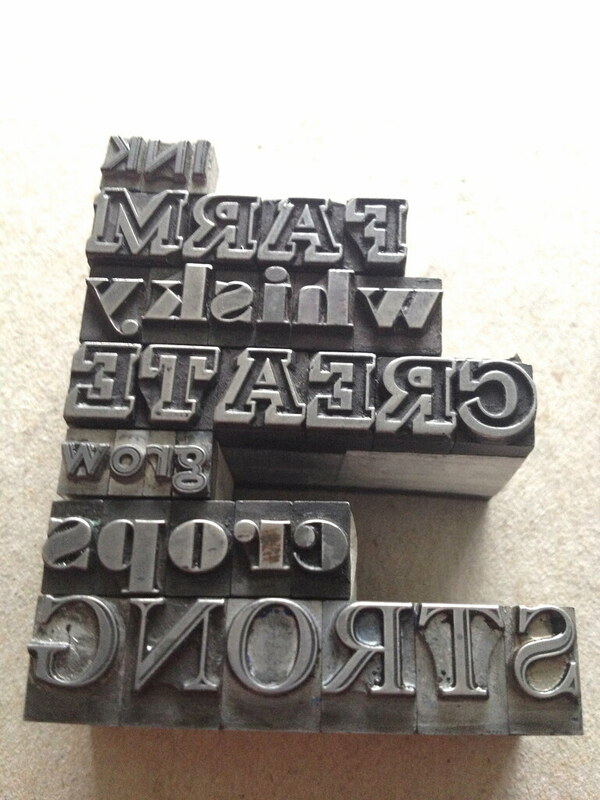 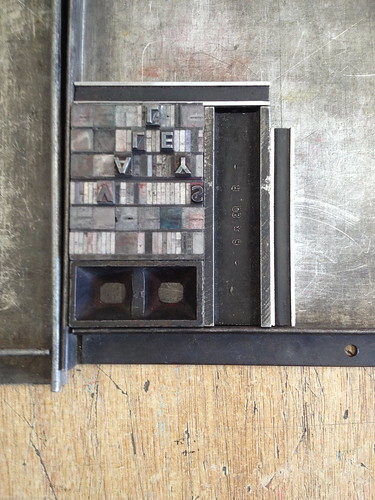 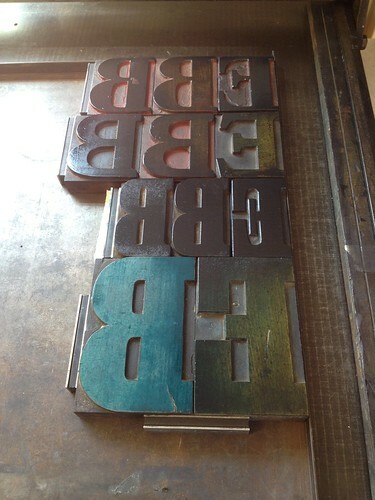 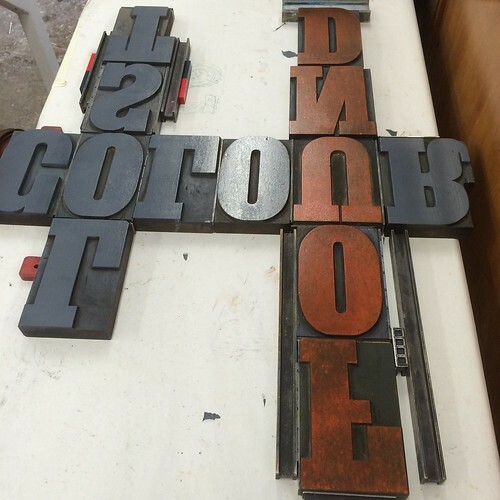 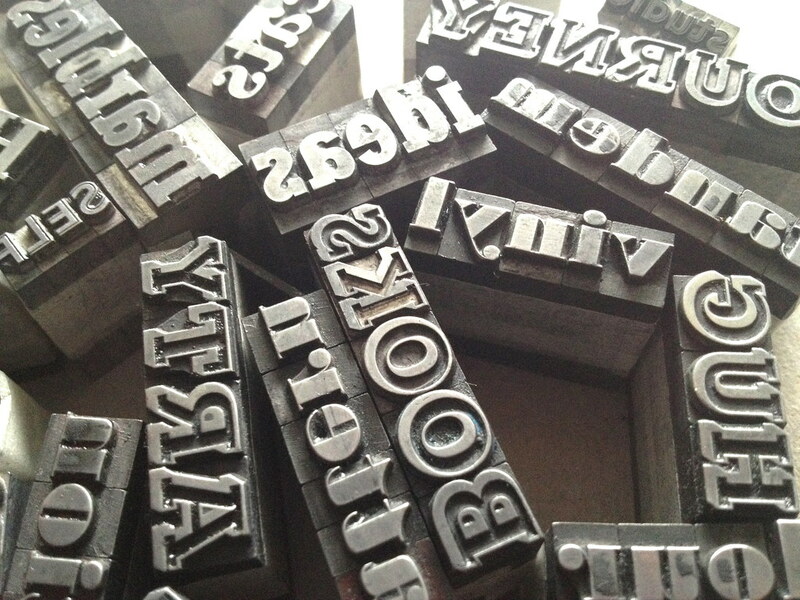 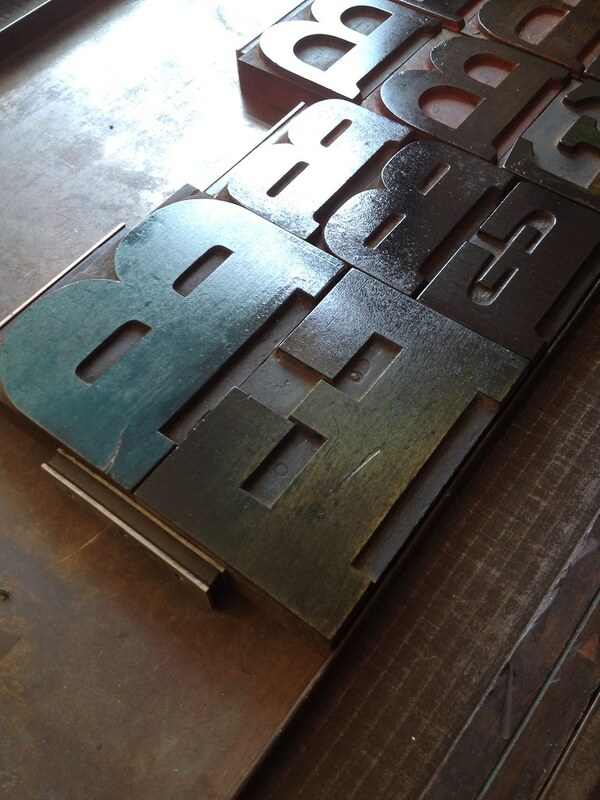 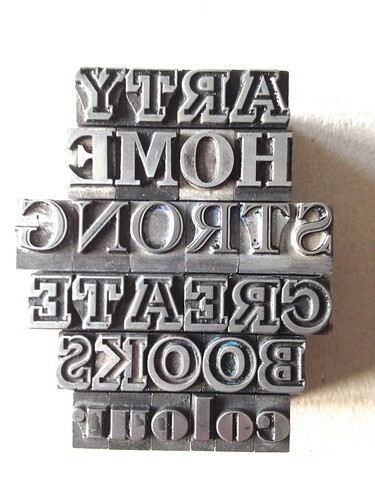 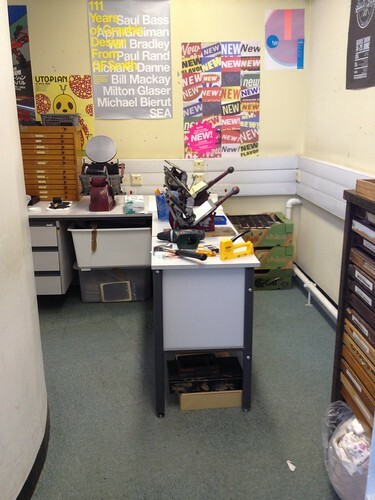 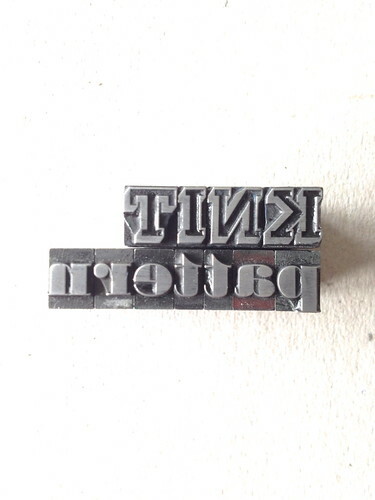 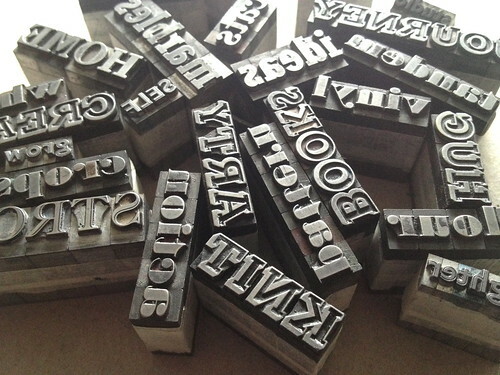 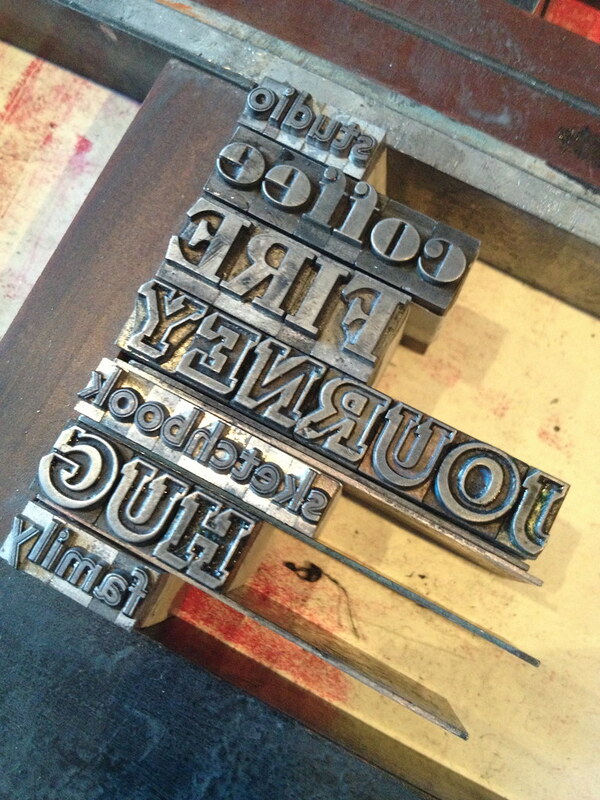 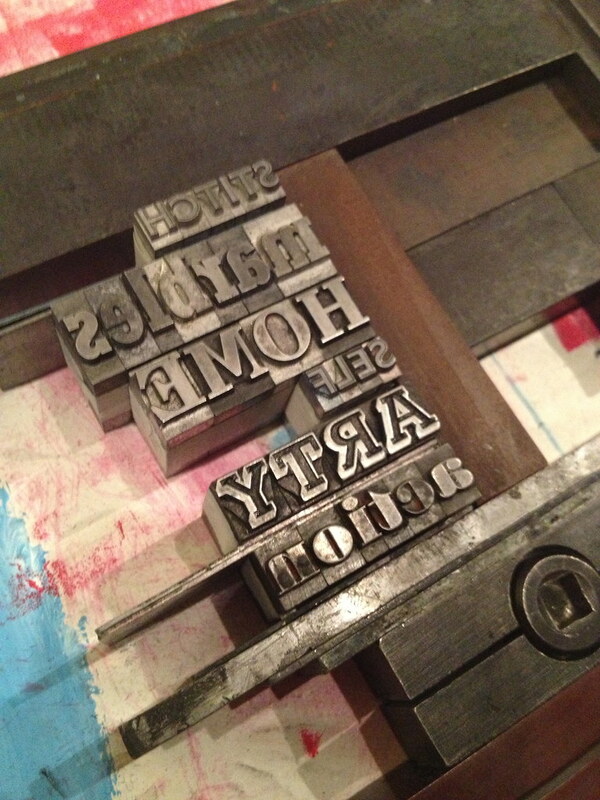 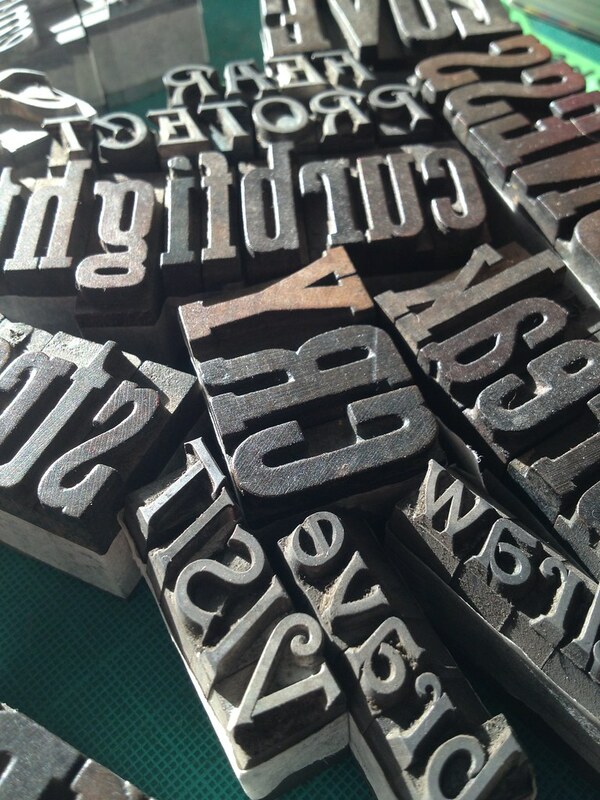 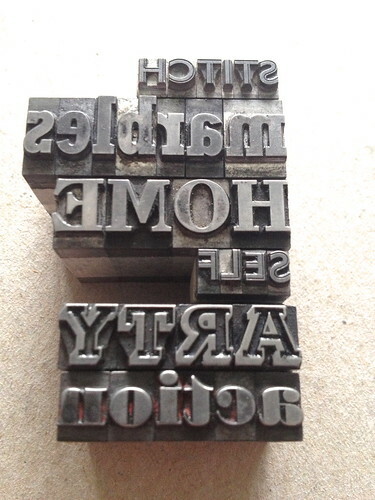 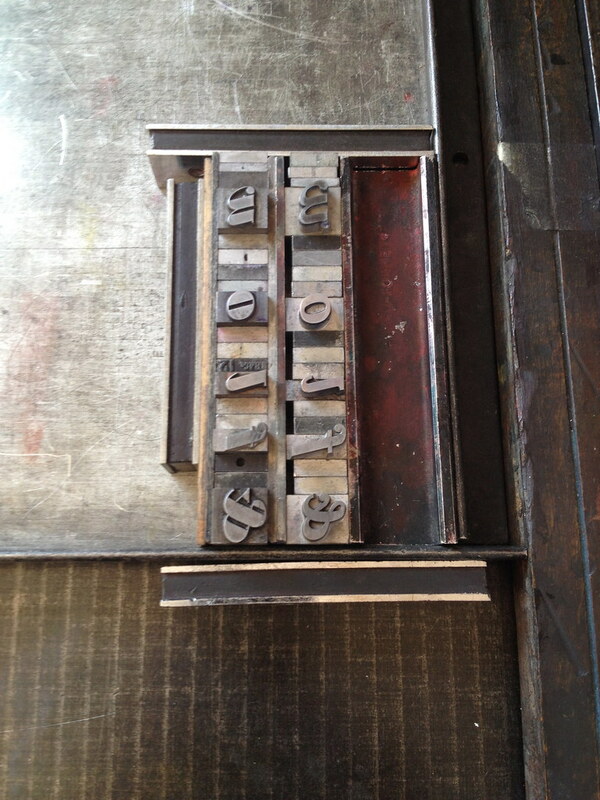 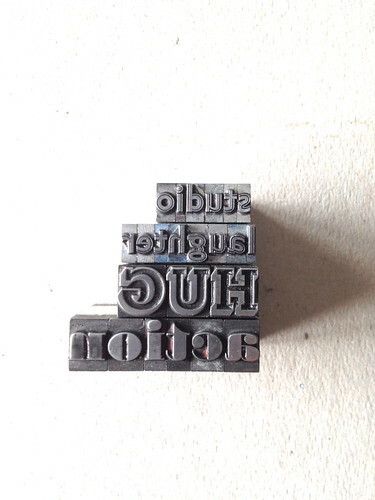 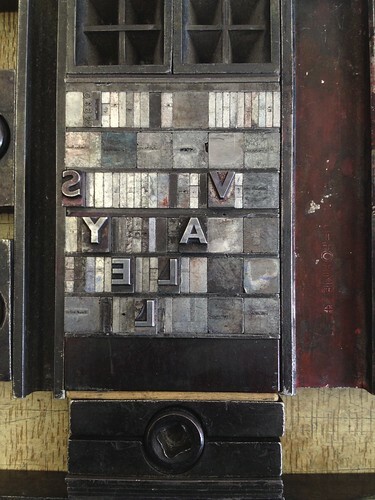 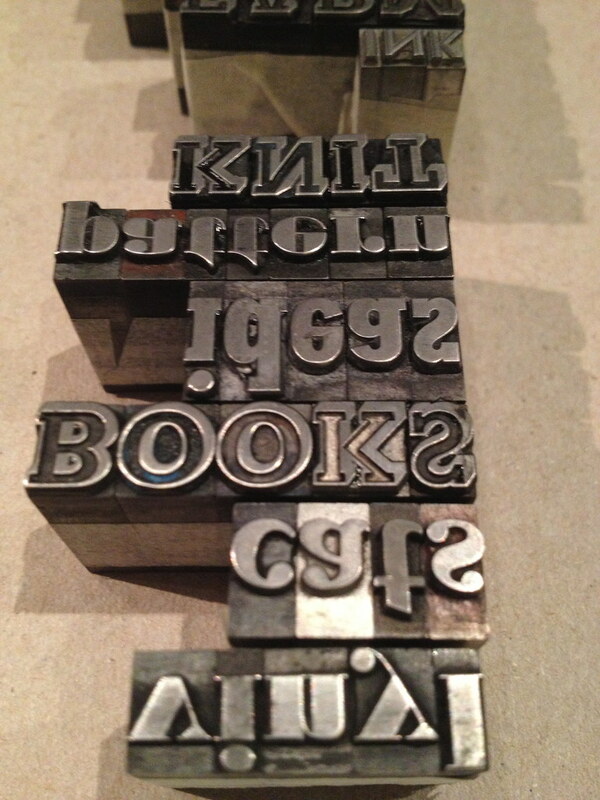 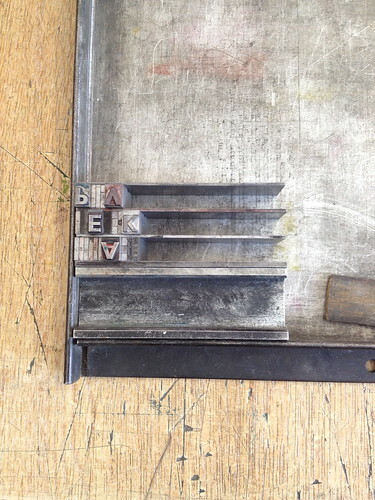 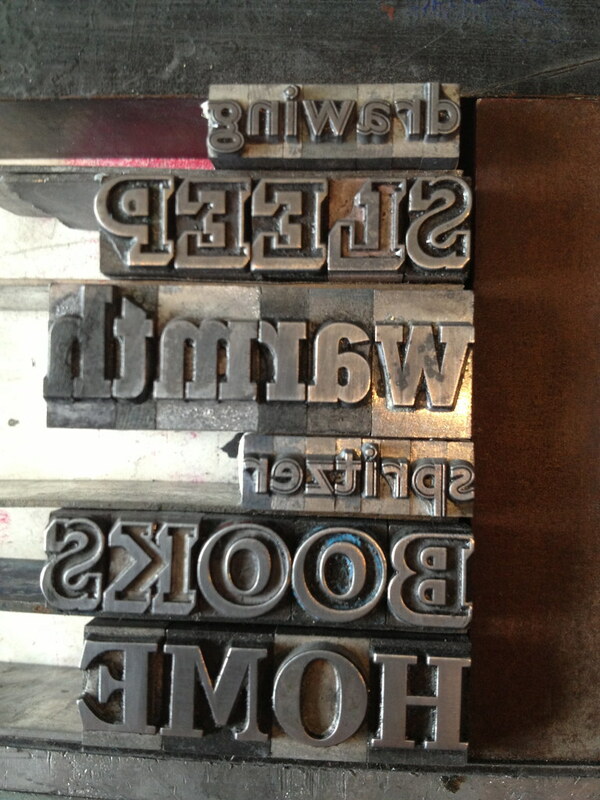 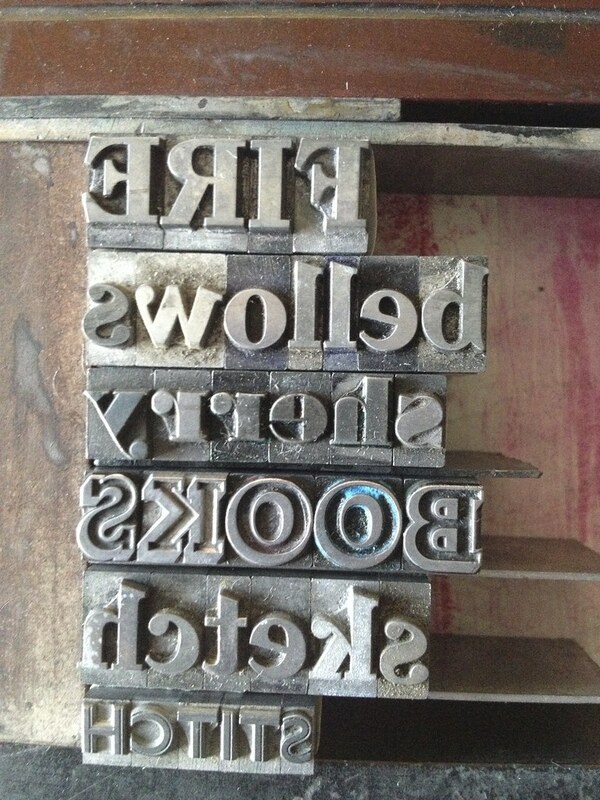 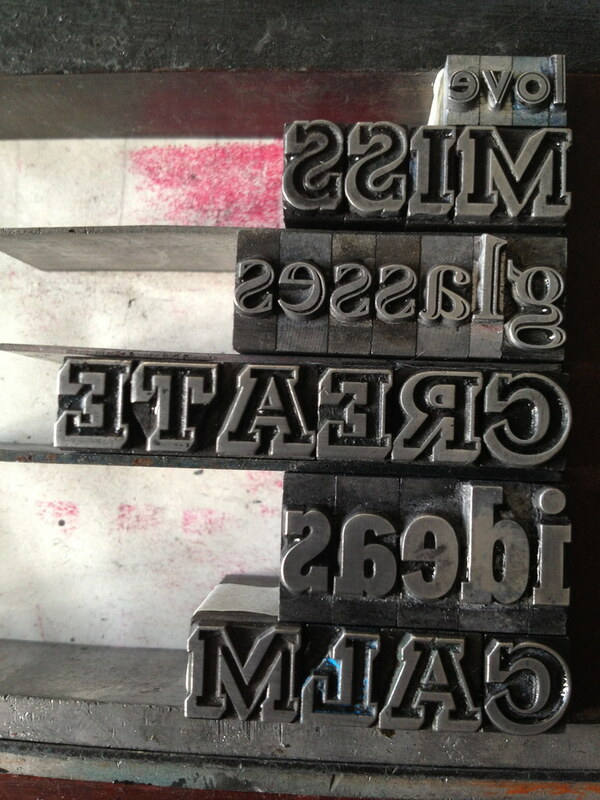 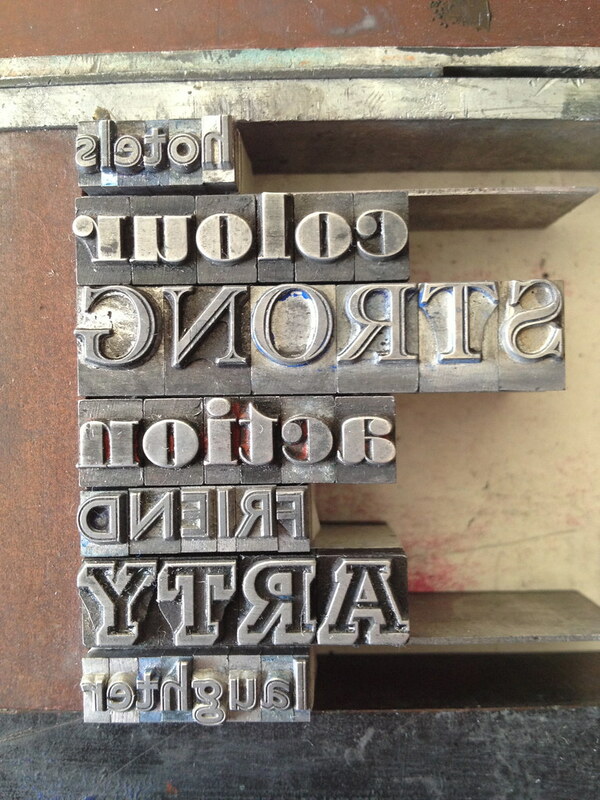 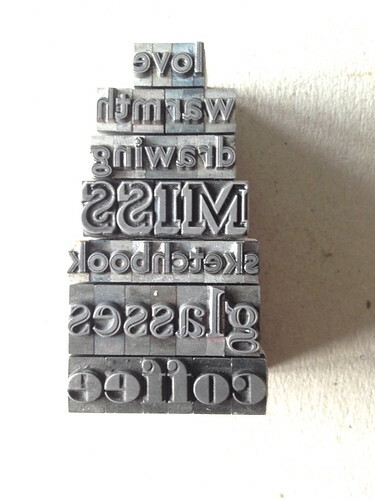 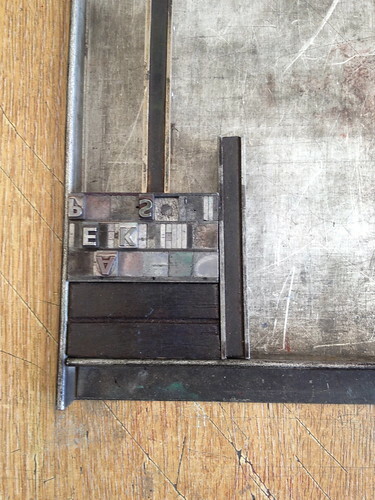 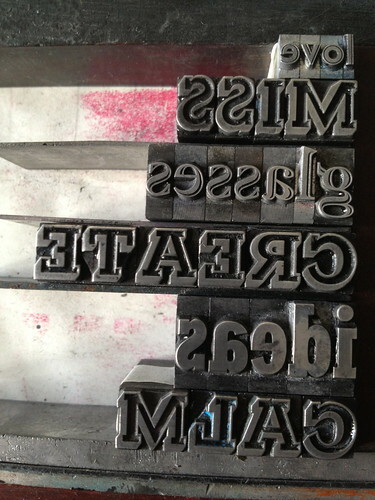 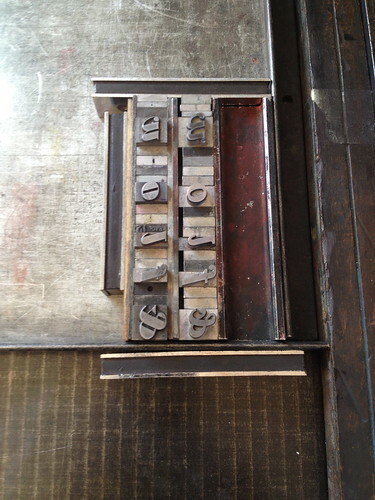 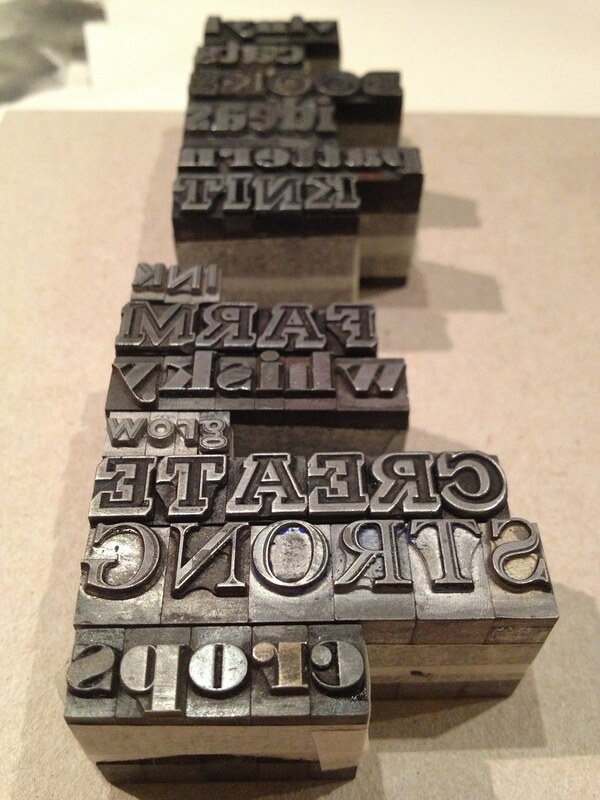 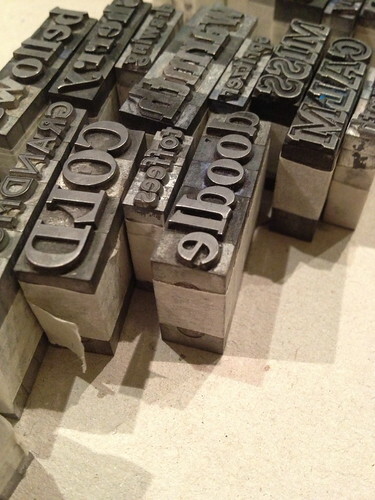 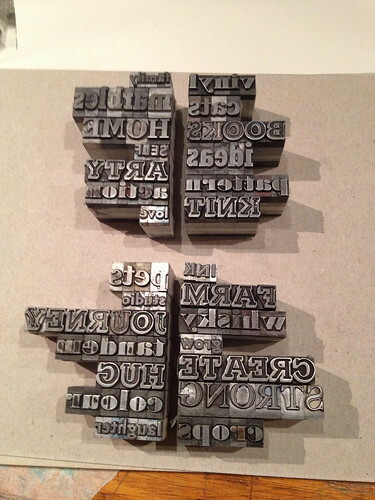 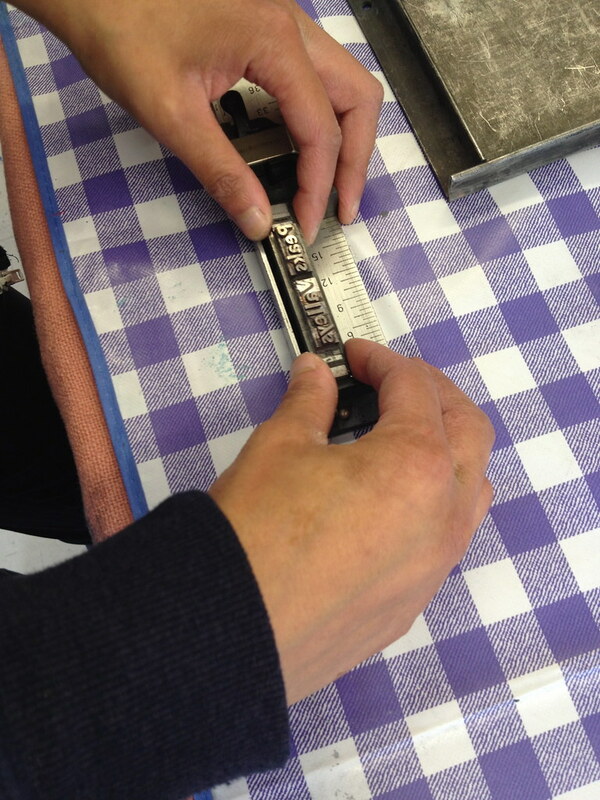 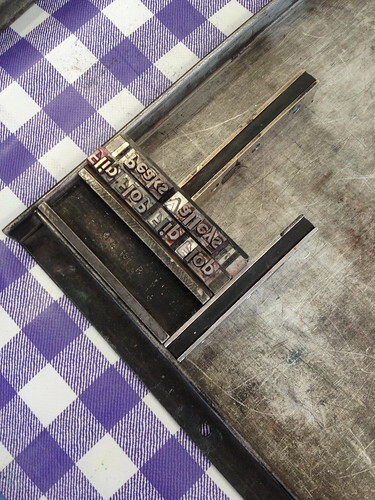 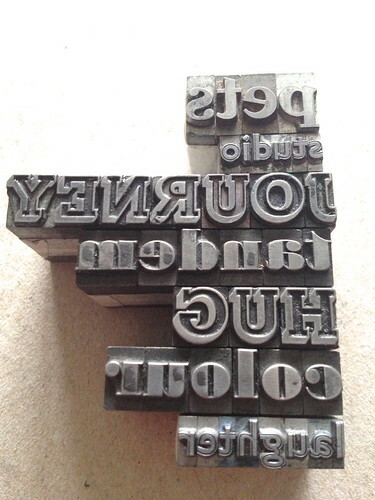 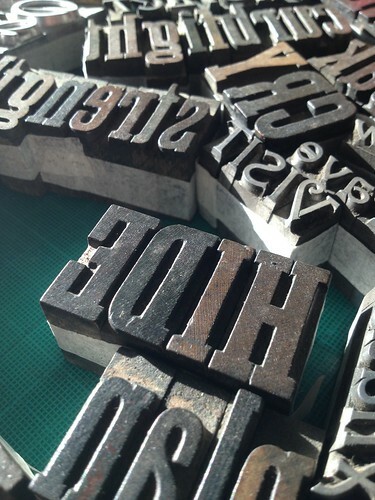 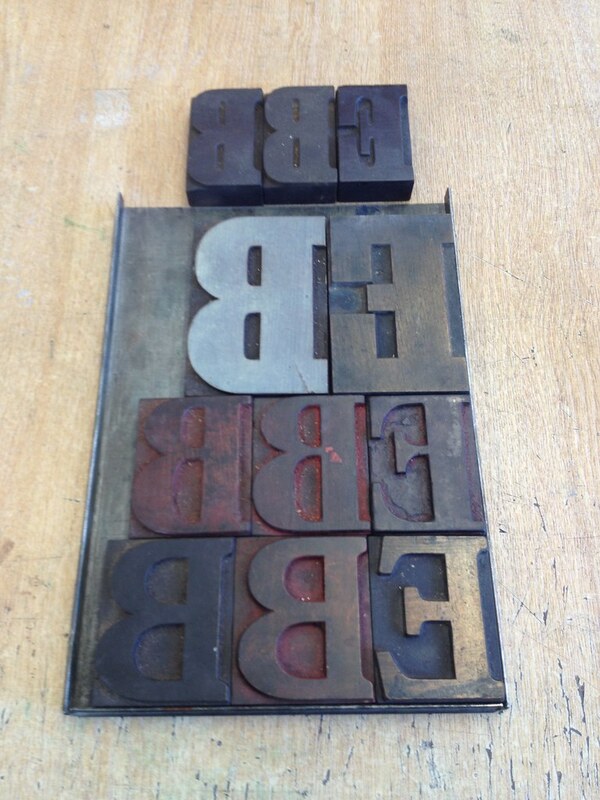 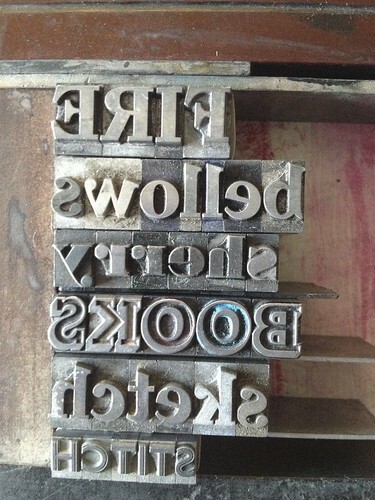 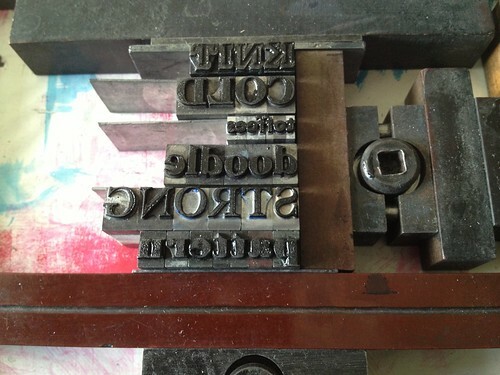 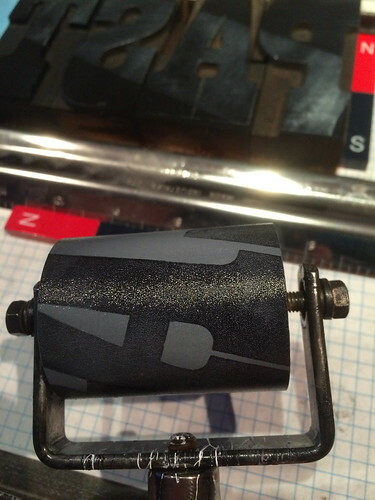 It contains 3 Adana Presses of various sizes and a large collection of type. 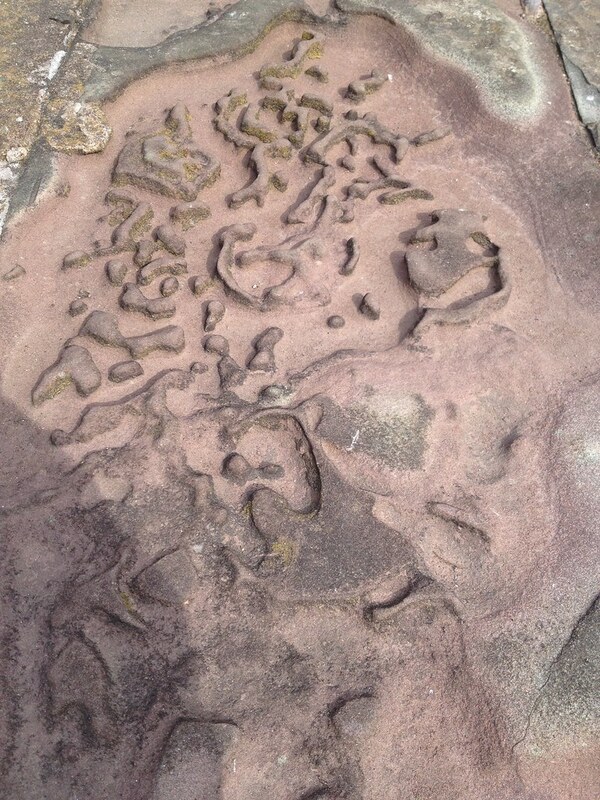 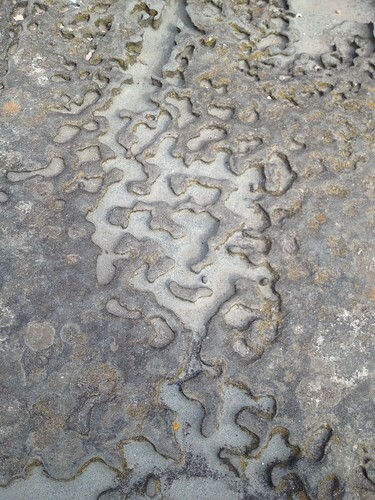 Making up the image on the stone. 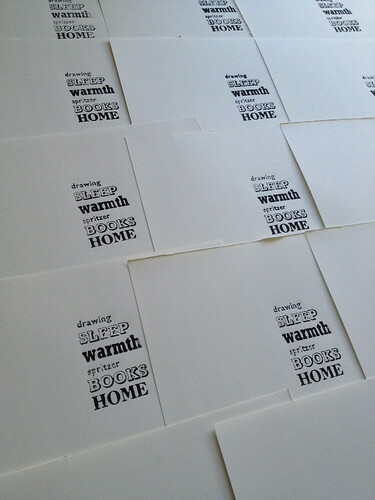 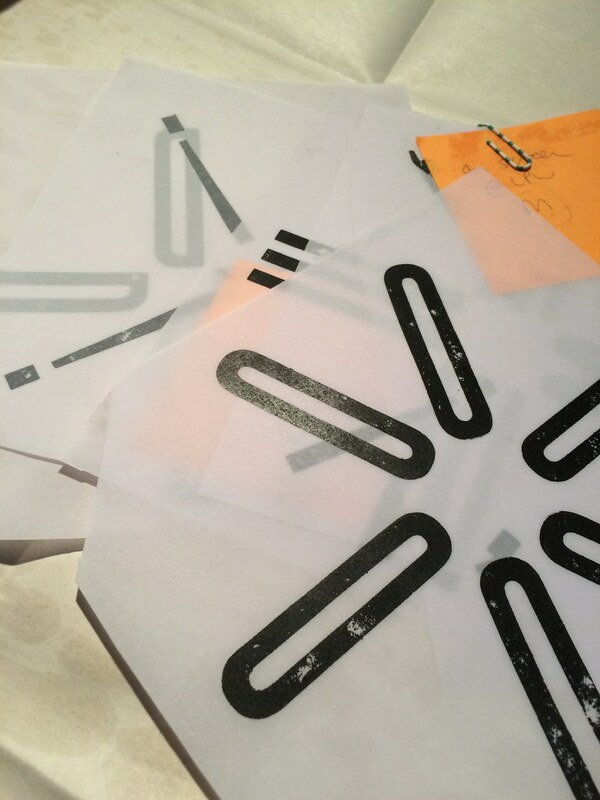 Tests for Home 2014 project. 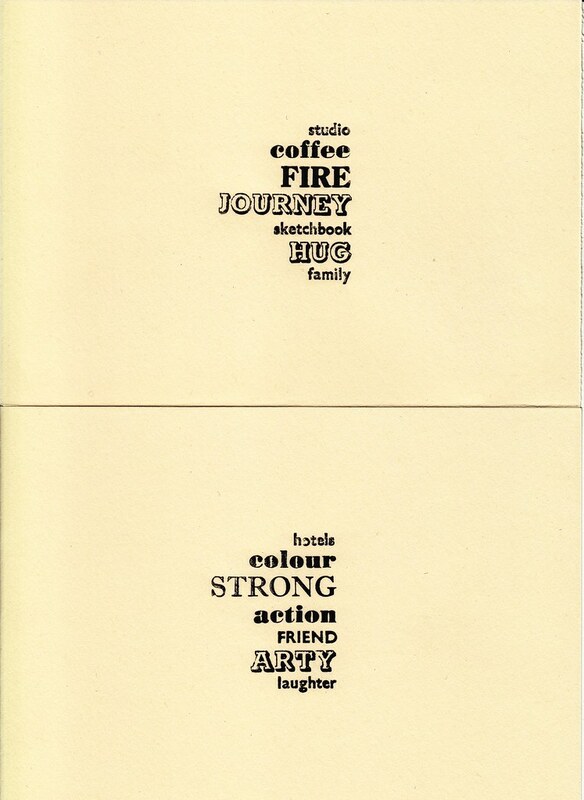 The text is based on stories about 3 people – my grandmother, my daughter and a close friend. 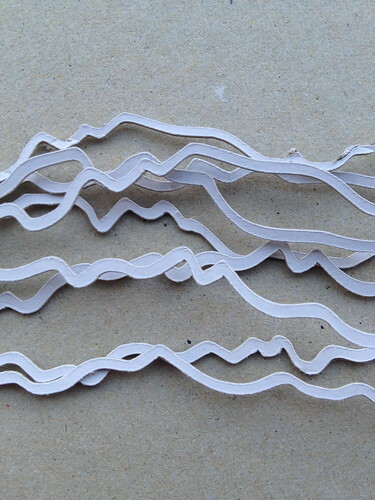 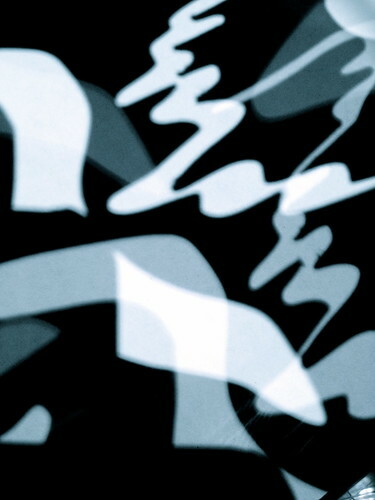 These experimental images are ideas for my entry to the wlyb Home exhibition (2014). 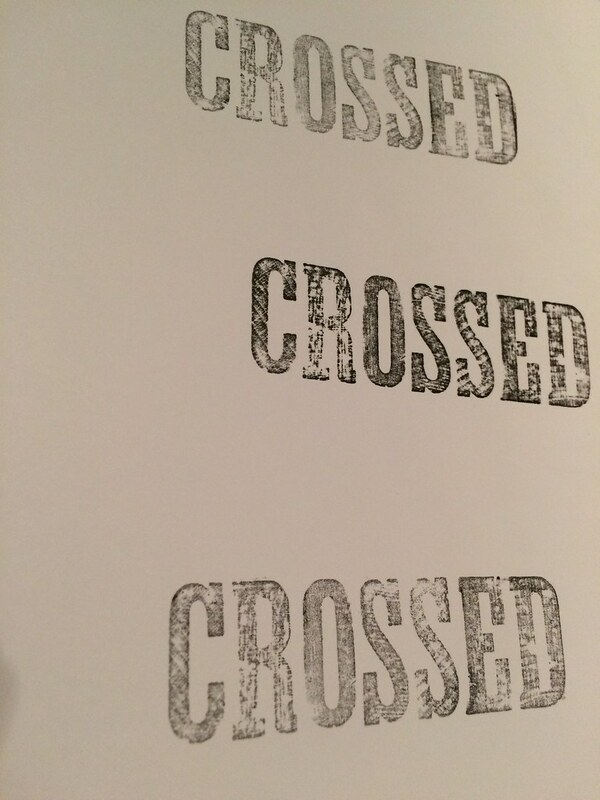 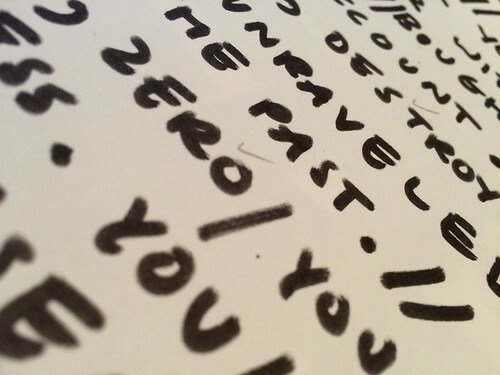 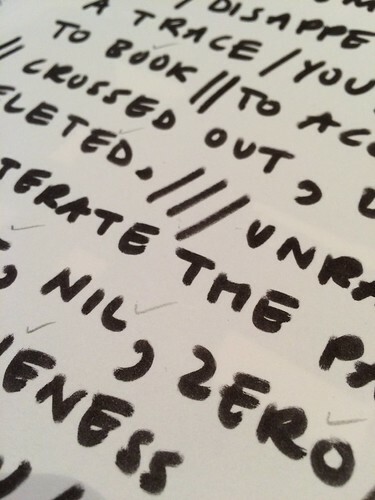 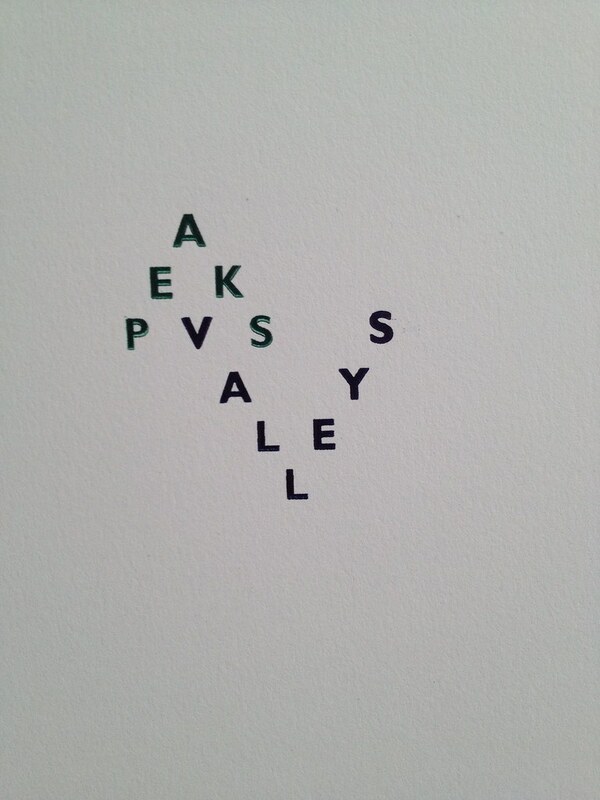 As with most of my work the text is predominantly obscured. 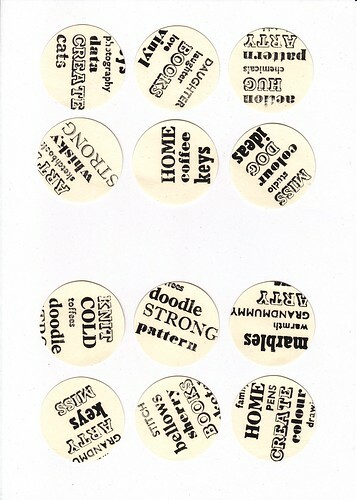 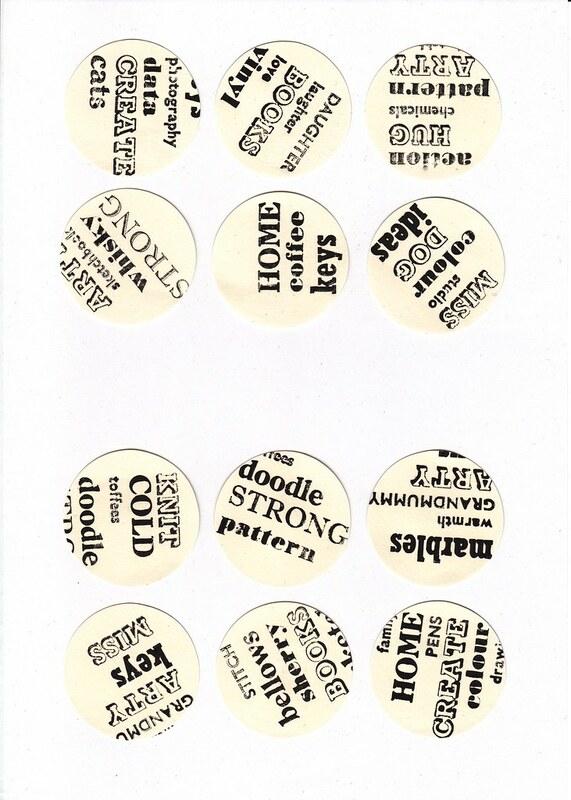 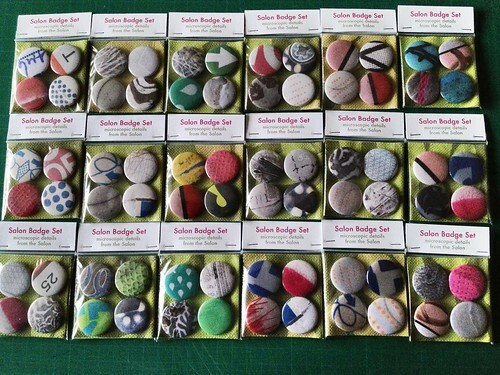 Final badge sets for The Salon project organised by EC Arts. 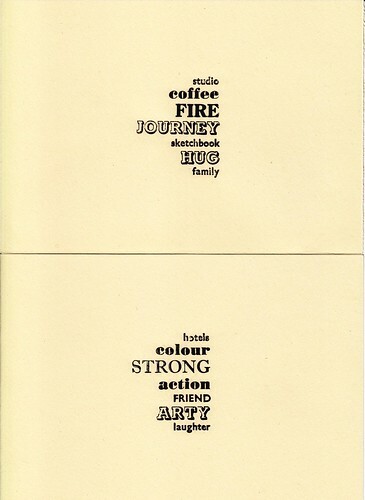 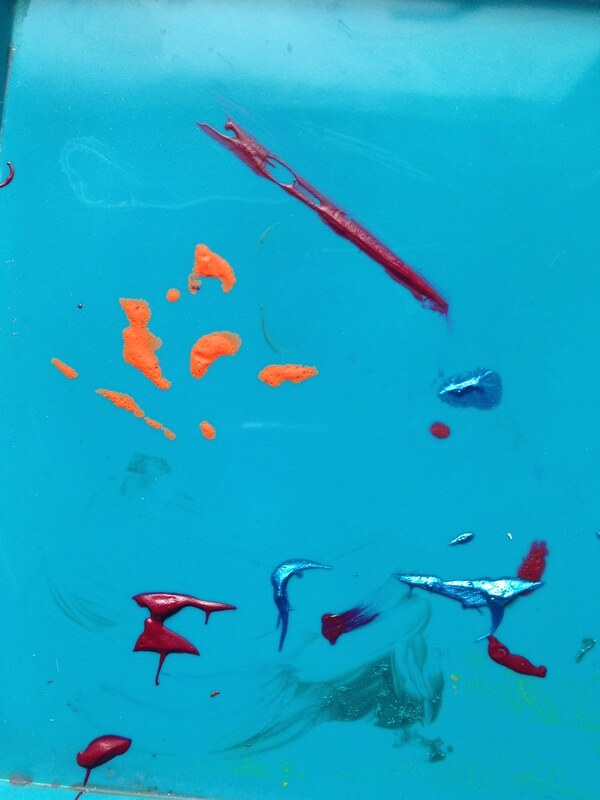 I was one of the exhibiting artists – October 2013. 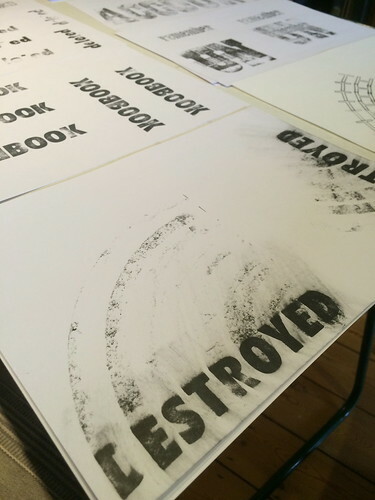 The imagery is based on close ups of items left behind in an old hairdressers.These were actual objects and pieces of the infrastructure – walls, floors and other surfaces. 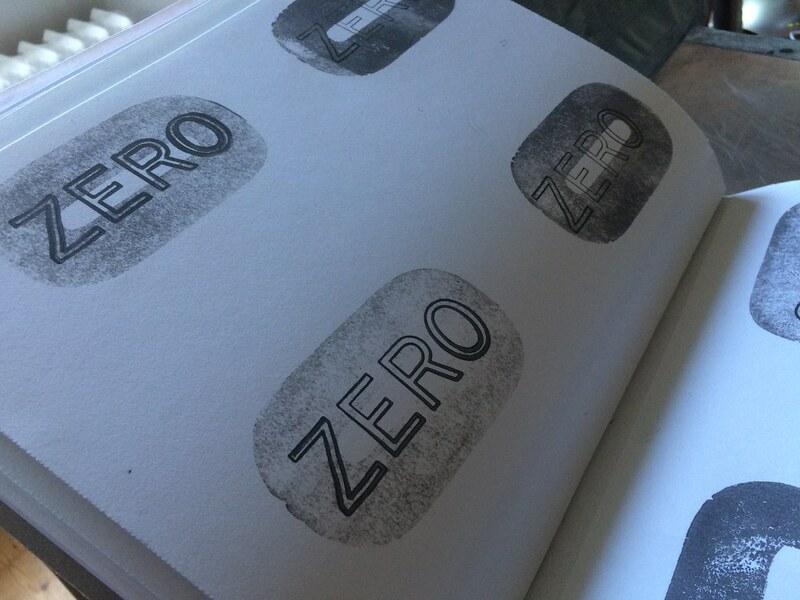 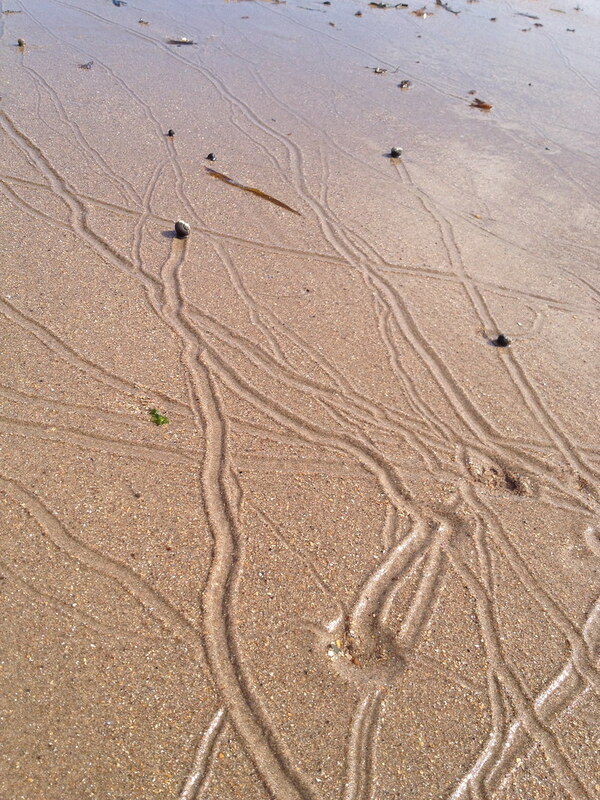 Much of the work was based on a sense of 'wabi sabi' – the erosion of surfaces and added accretions. 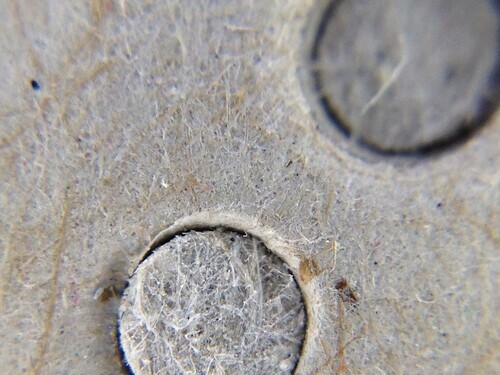 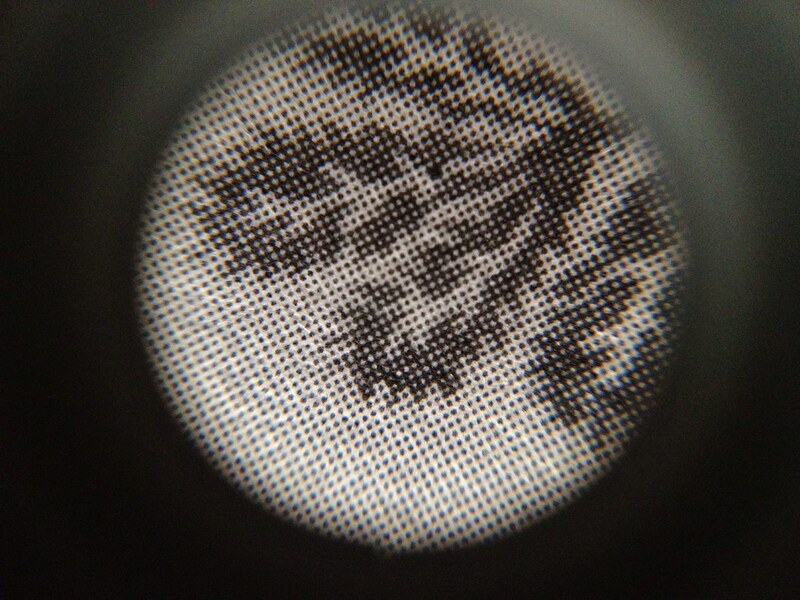 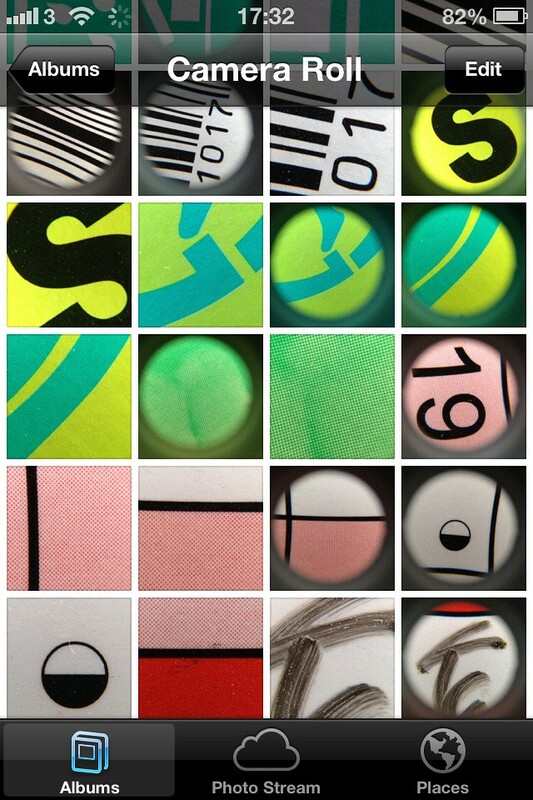 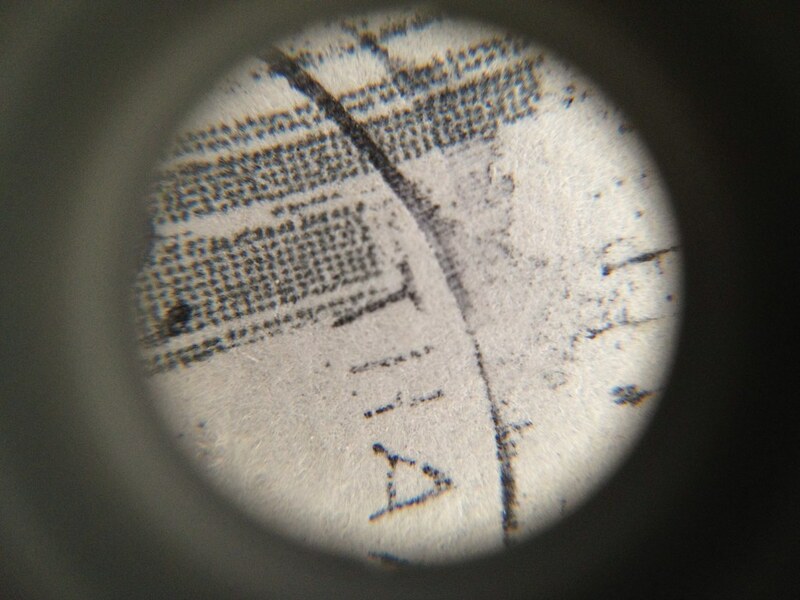 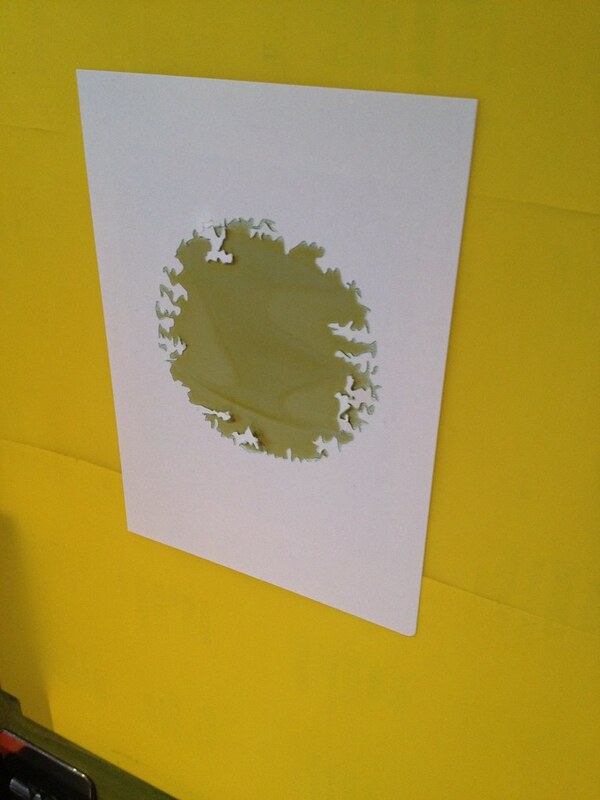 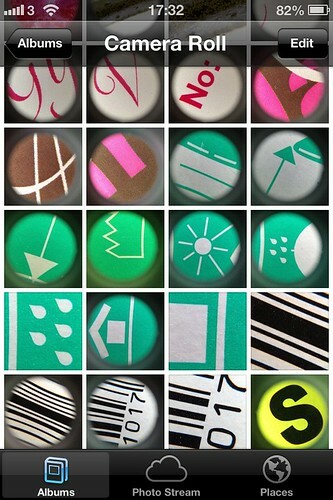 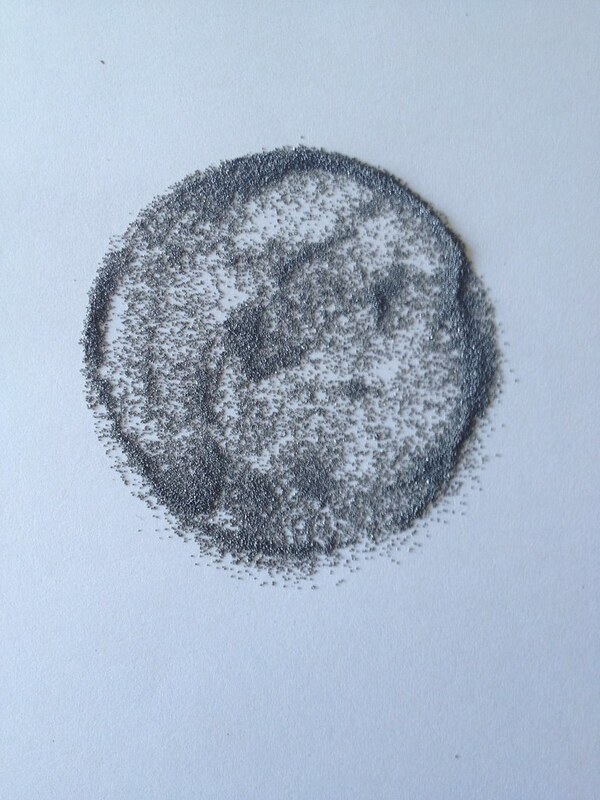 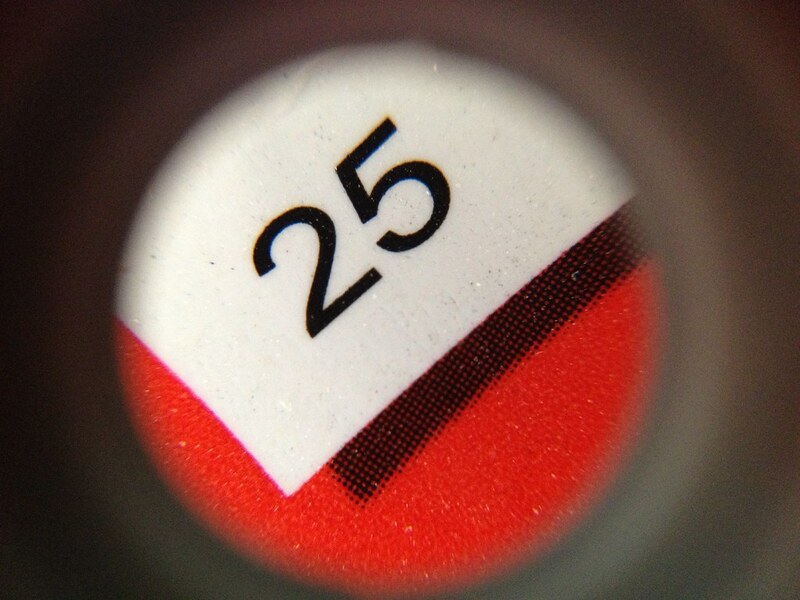 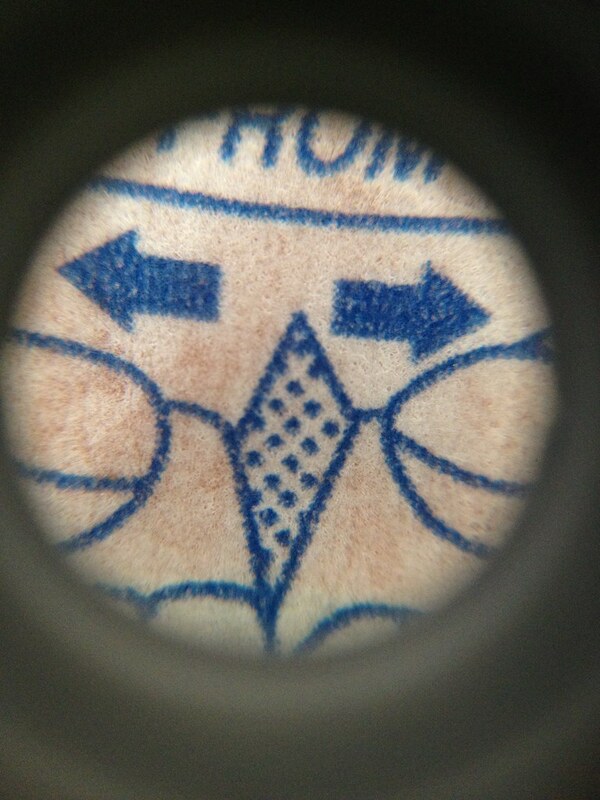 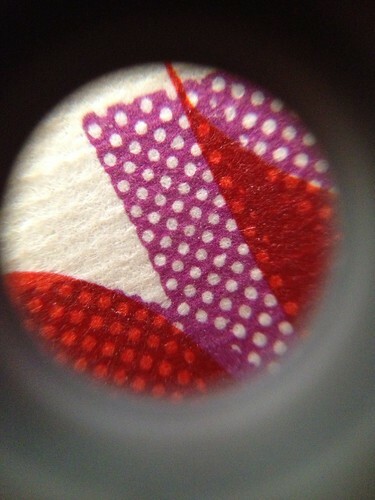 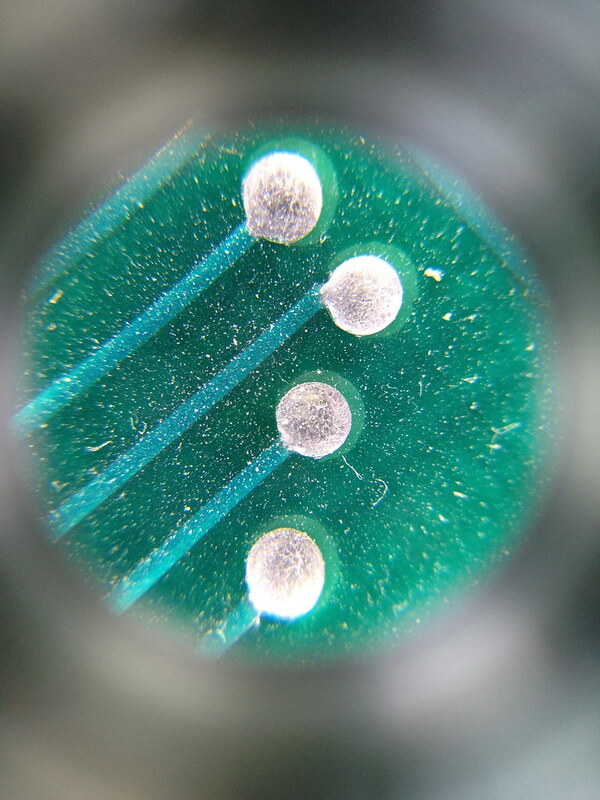 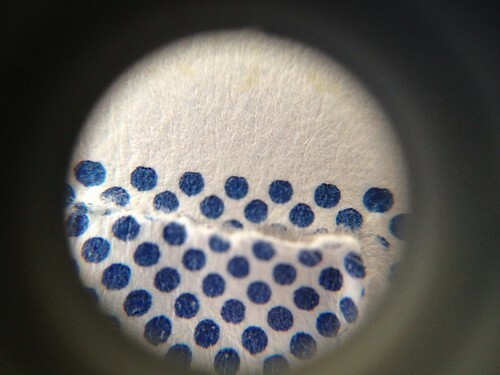 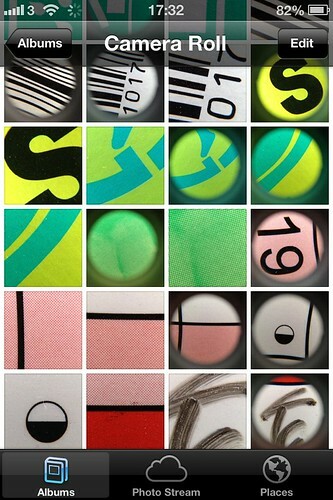 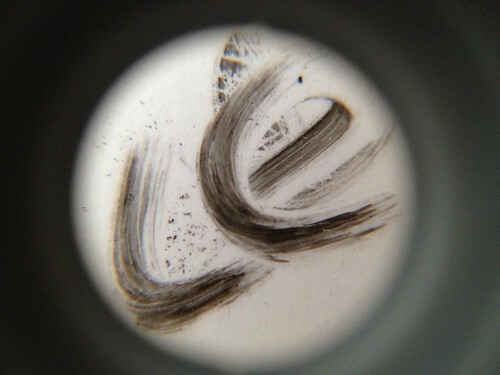 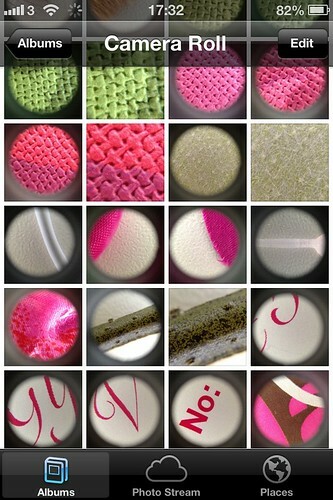 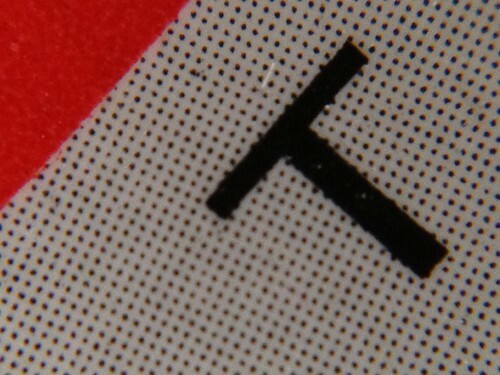 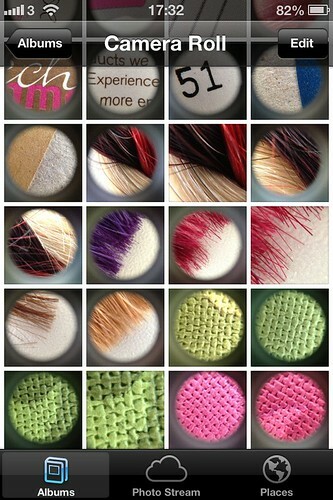 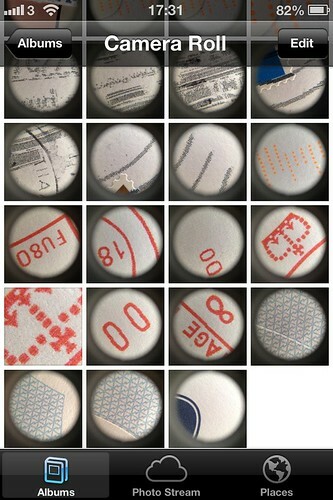 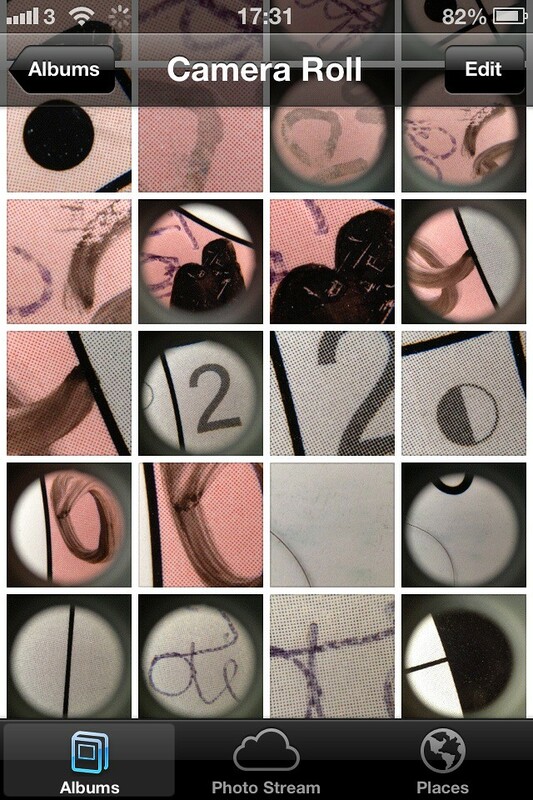 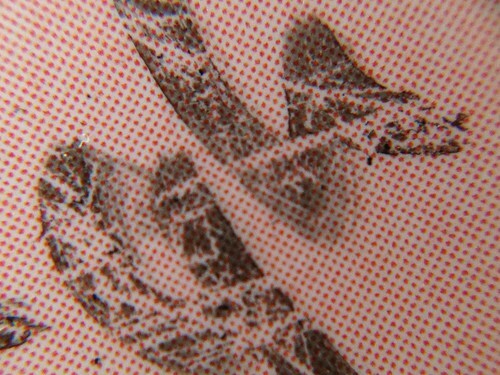 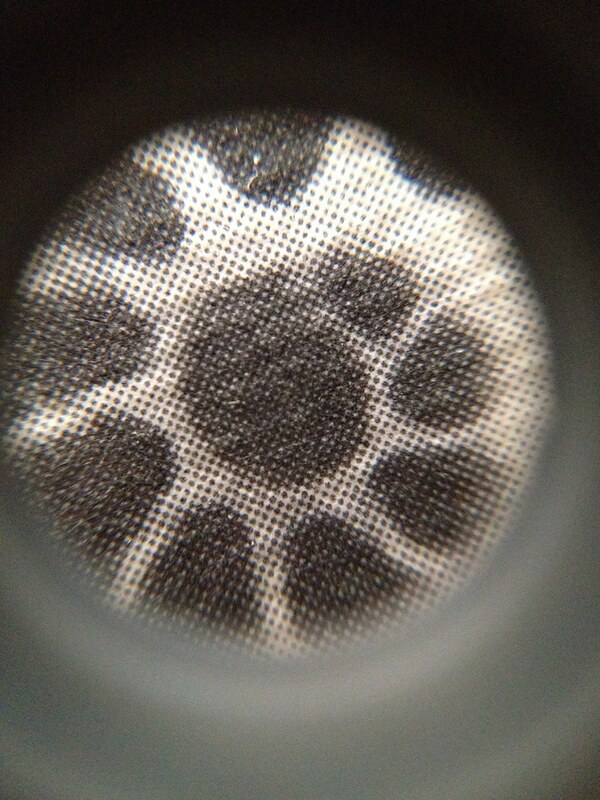 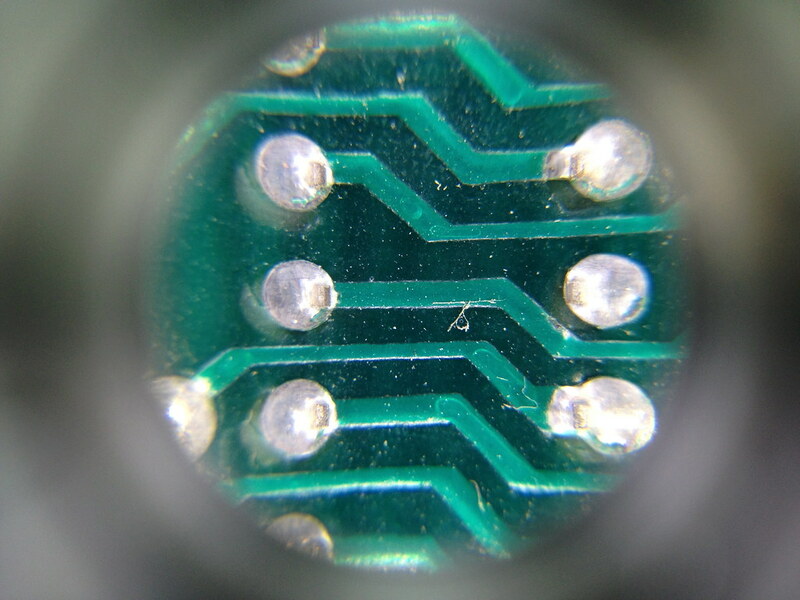 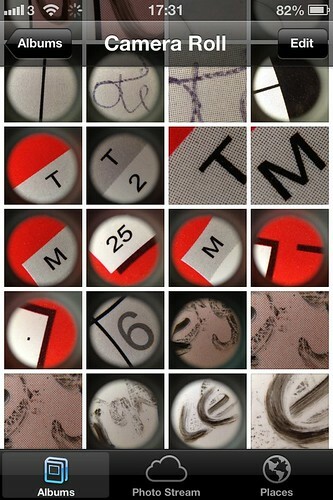 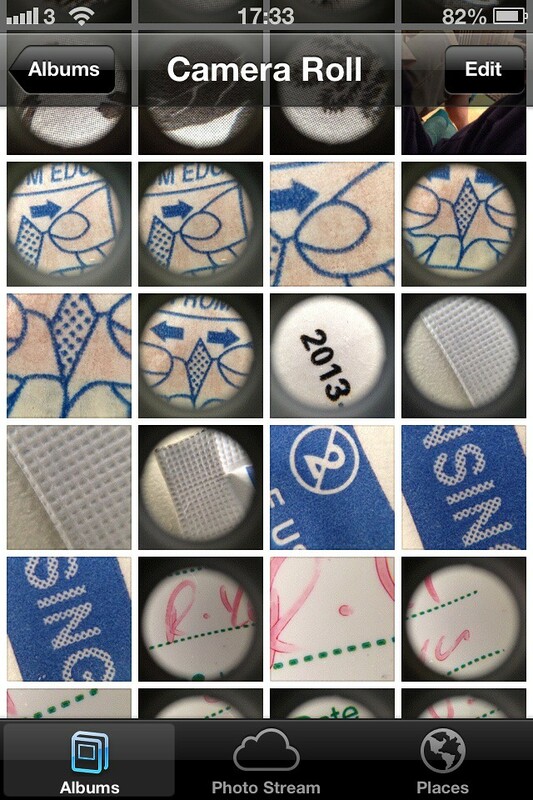 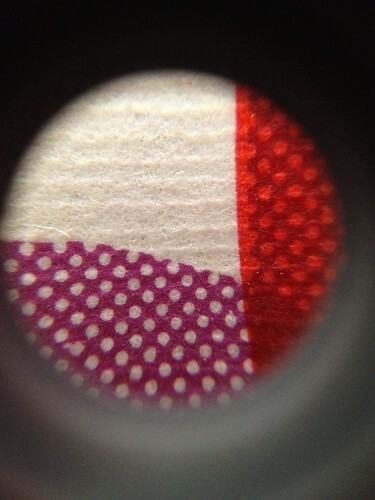 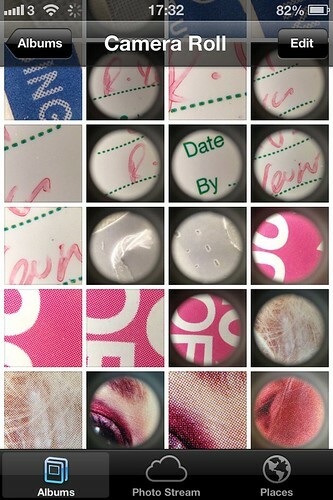 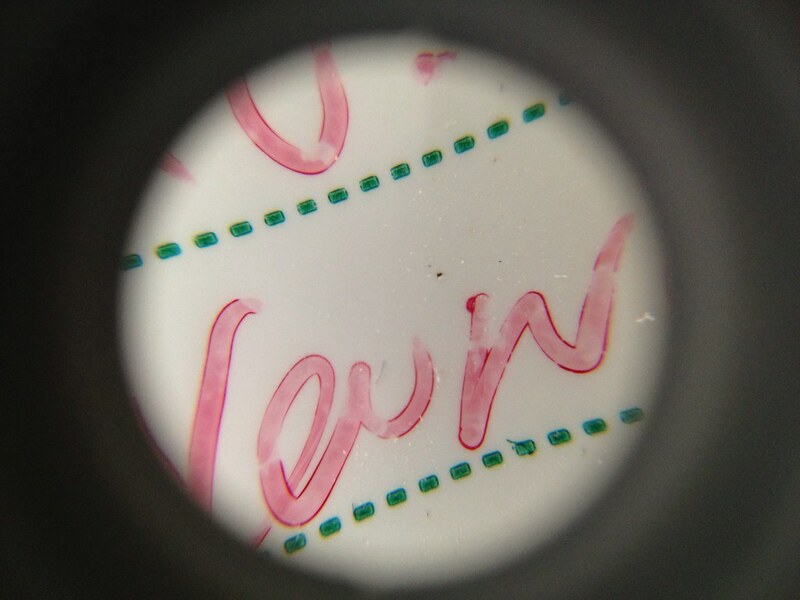 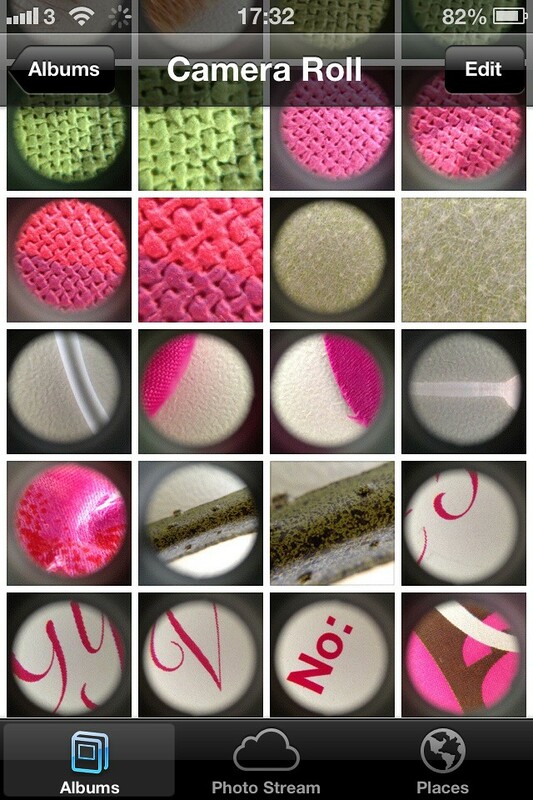 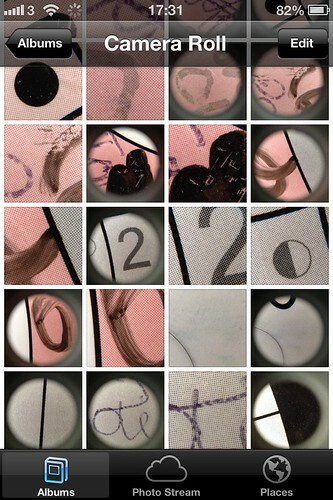 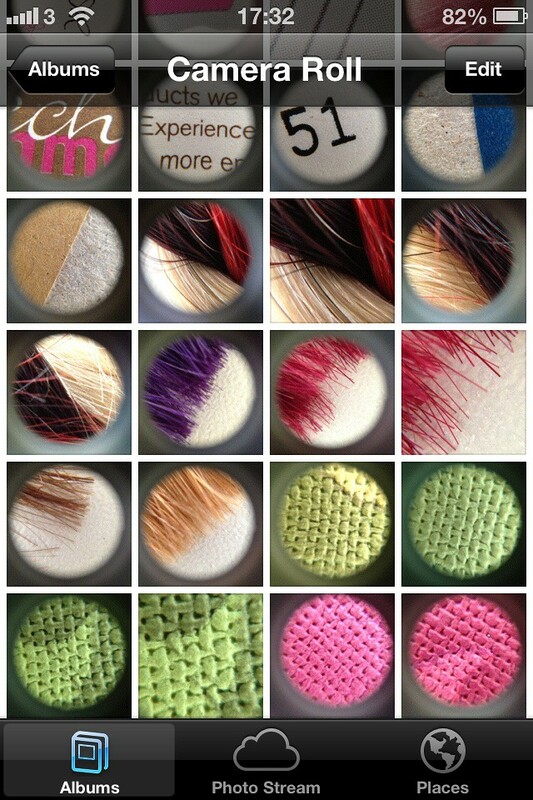 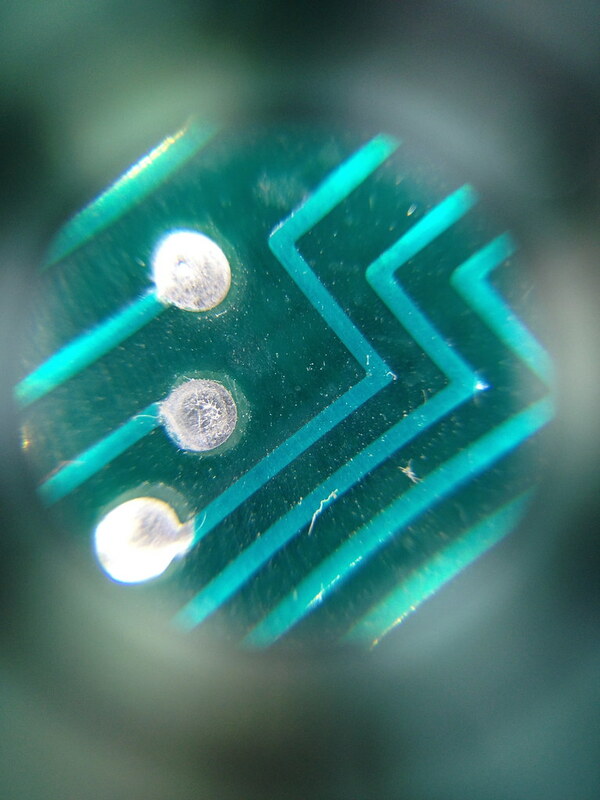 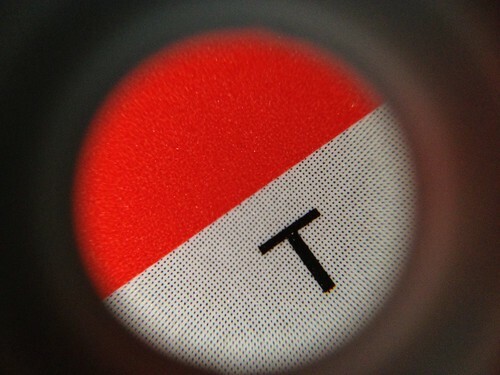 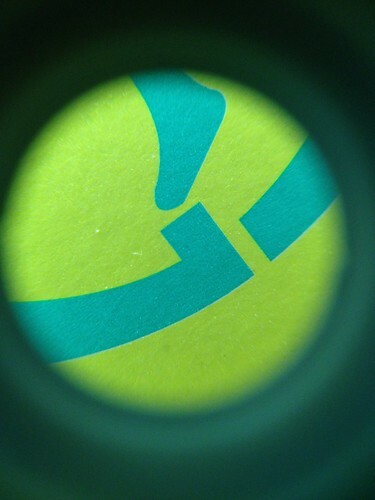 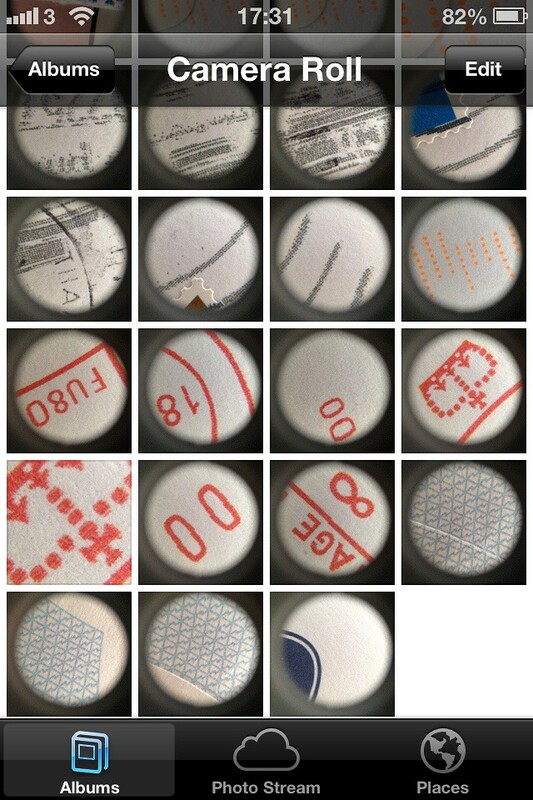 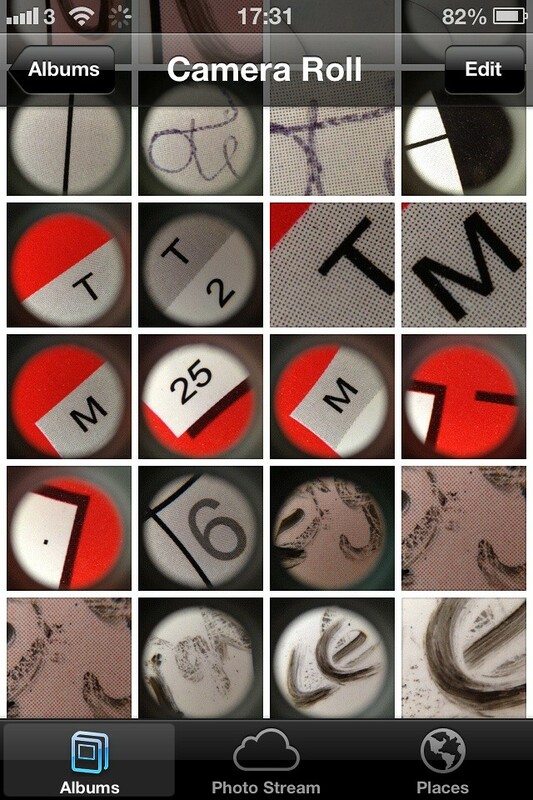 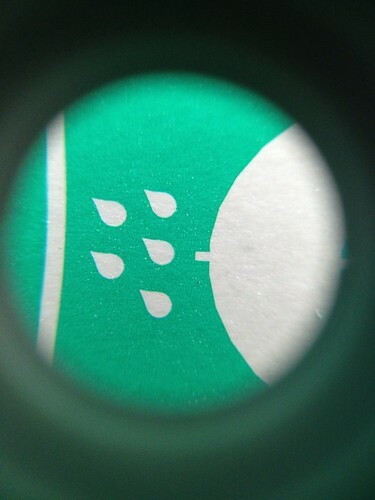 Initial image generation using a digital microscope for The Salon project organised by EC Arts. I was one of the exhibiting artists – October 2013. 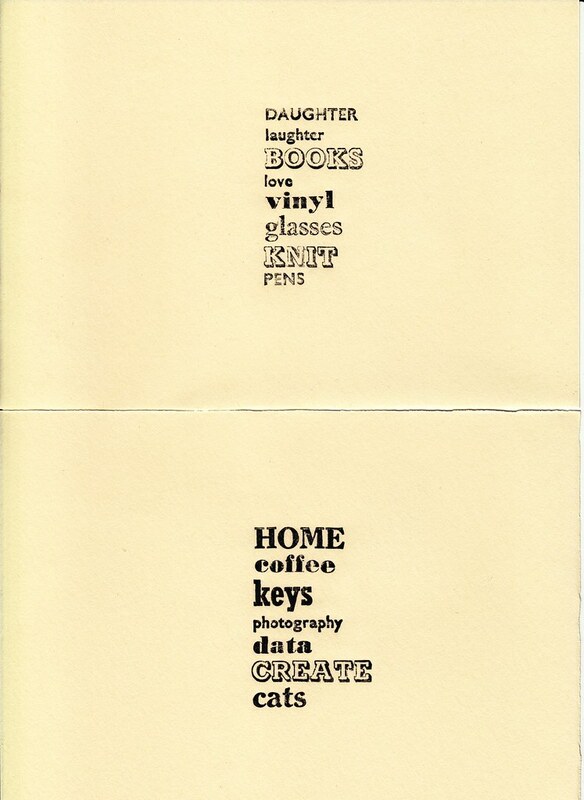 The imagery is based on close ups of items left behind in an old hairdressers.These were actual objects and pieces of the infrastructure – walls, floors and other surfaces. 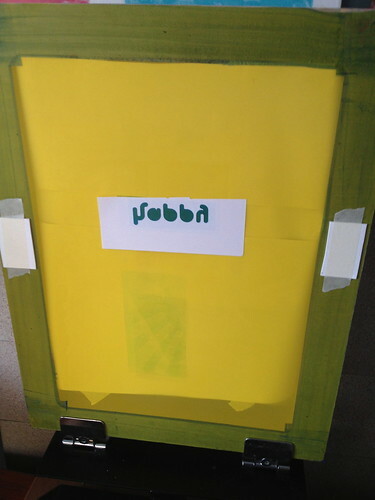 Much of the work was based on a sense of 'wabi sabi' – the erosion of surfaces and added accretions. Enjoying some time in my studio. 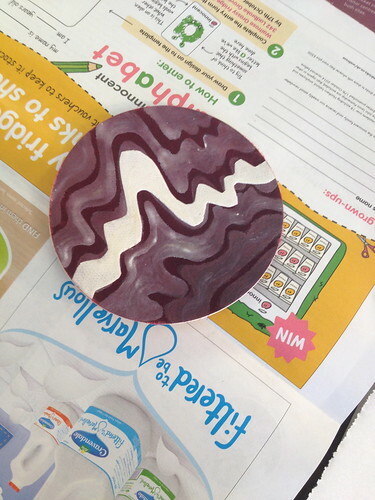 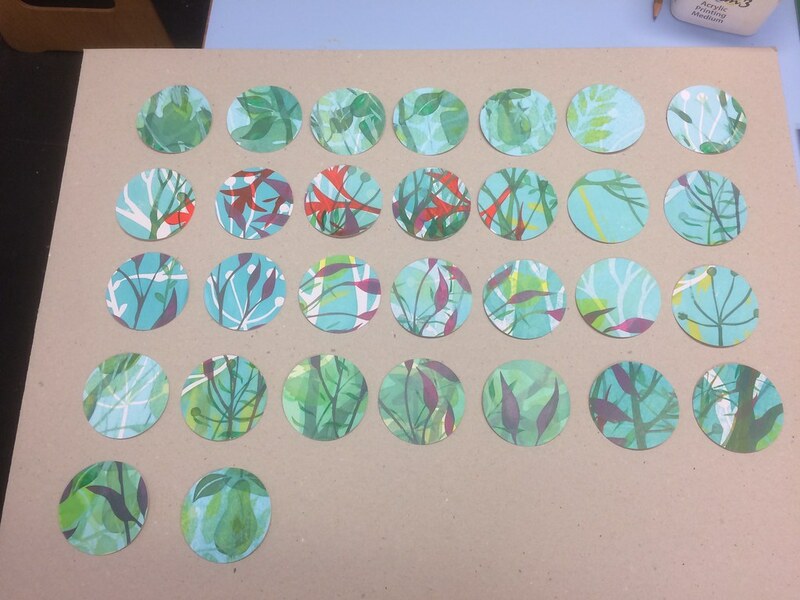 Looking at my circle colour tests and trying some rogue colours in a bit. 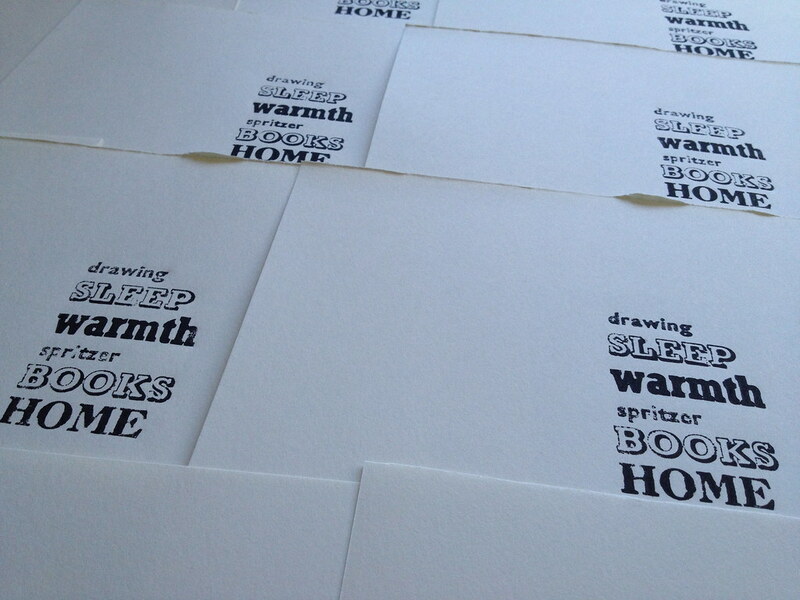 Turns out having a studio space away from home makes you very productive and good at using your time wisely! 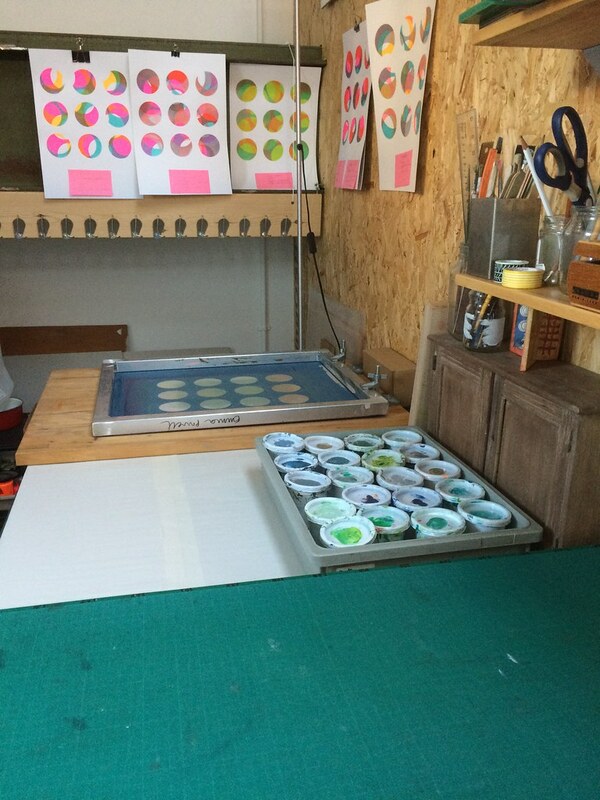 A busy day in my new studio today. 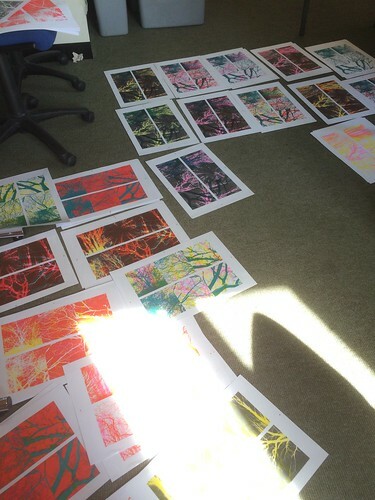 Hanging some recent prints and starting some new ones. Having only just moved in I have already covered every available space in drying screenprints! 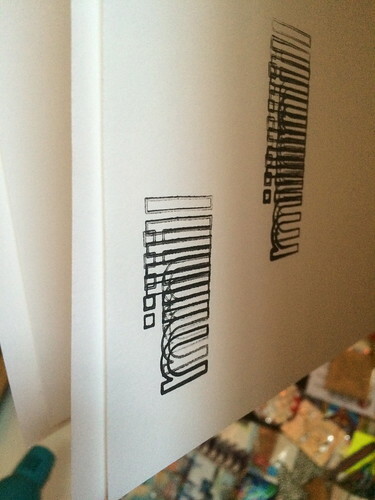 Have even finished packaging some prints ready for sale. 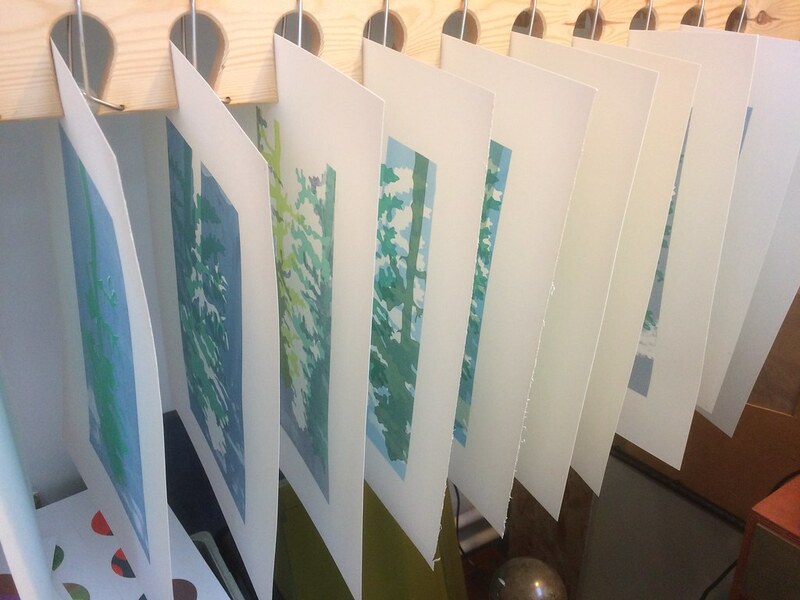 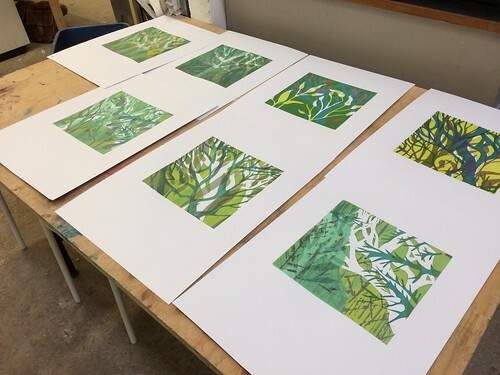 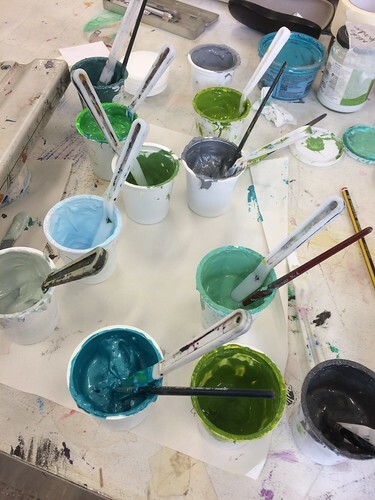 I am excited to say that one of them will be ‘April’ in the Leicester Print Workshop 2018 calendar. 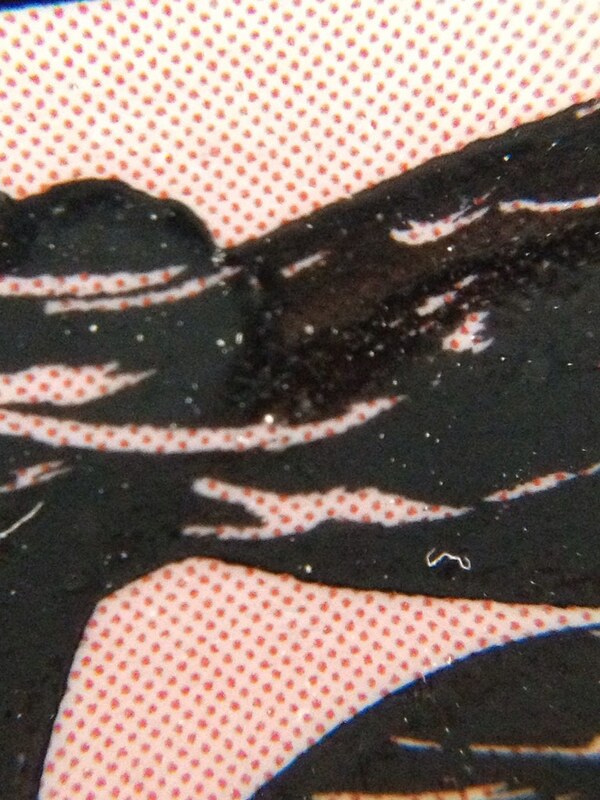 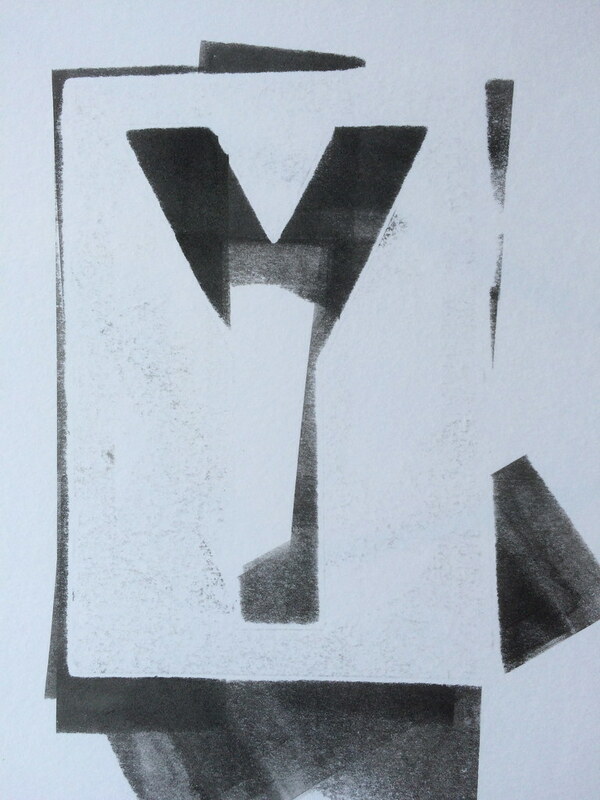 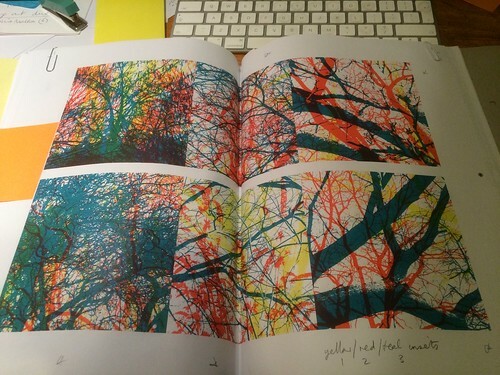 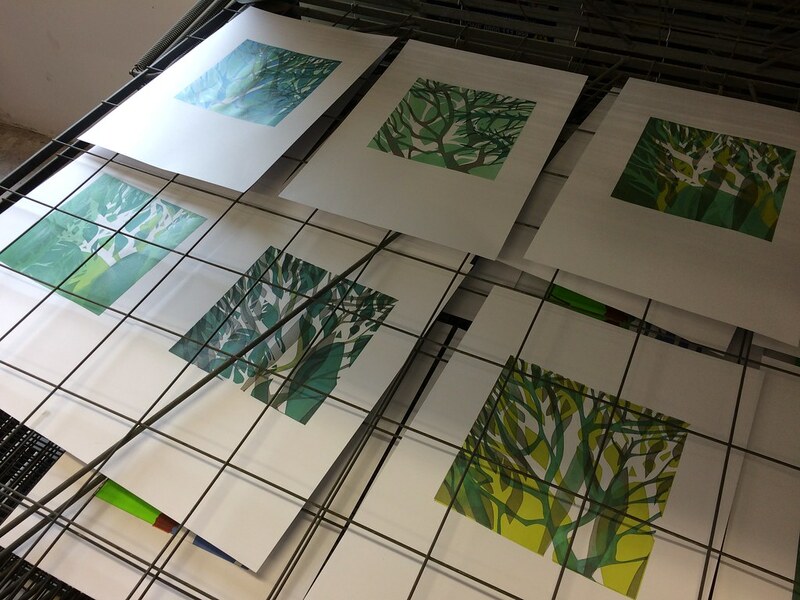 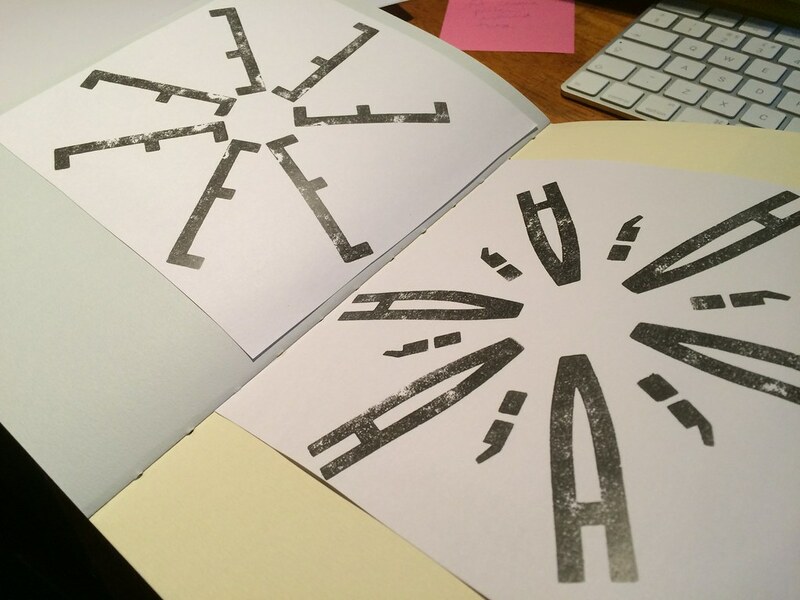 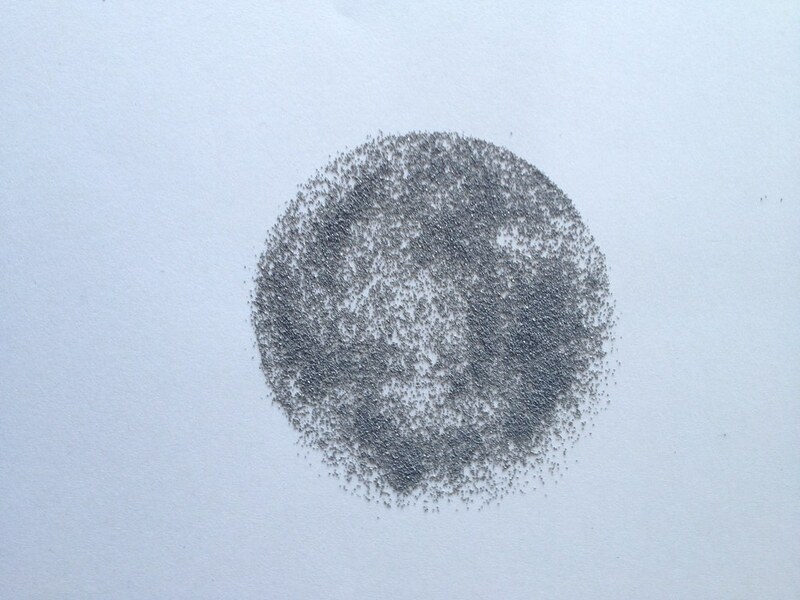 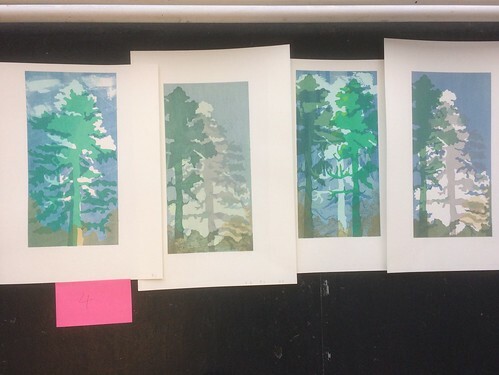 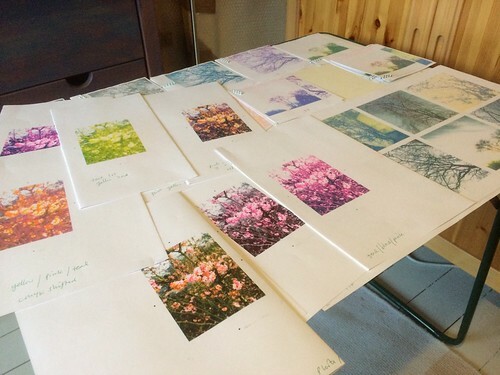 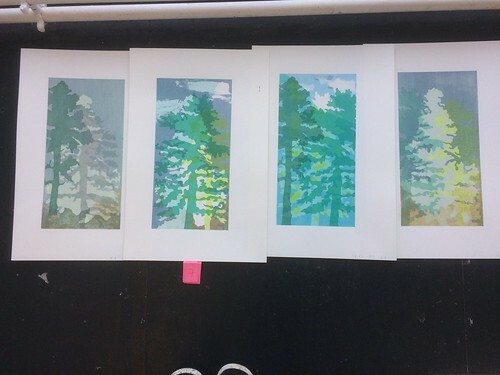 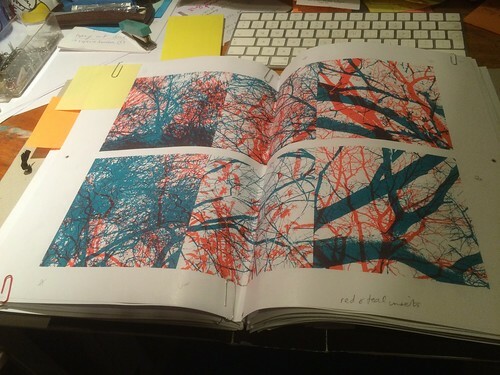 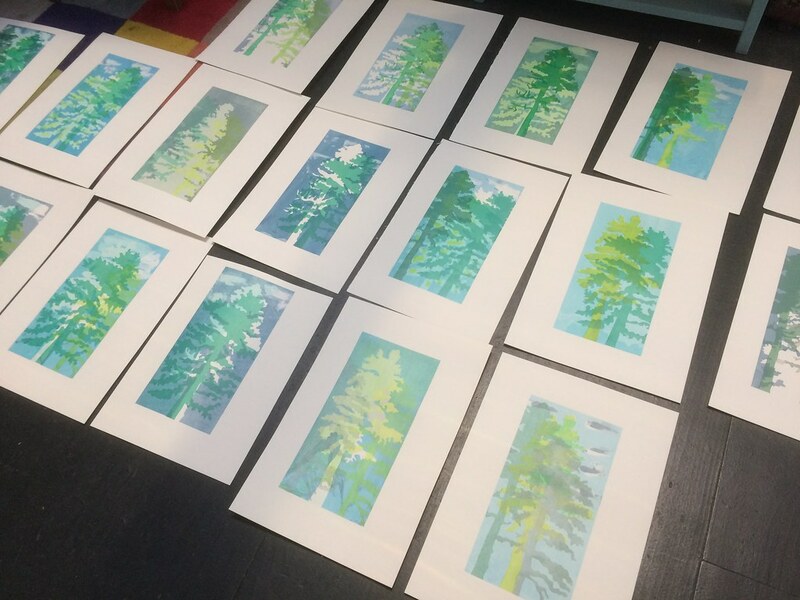 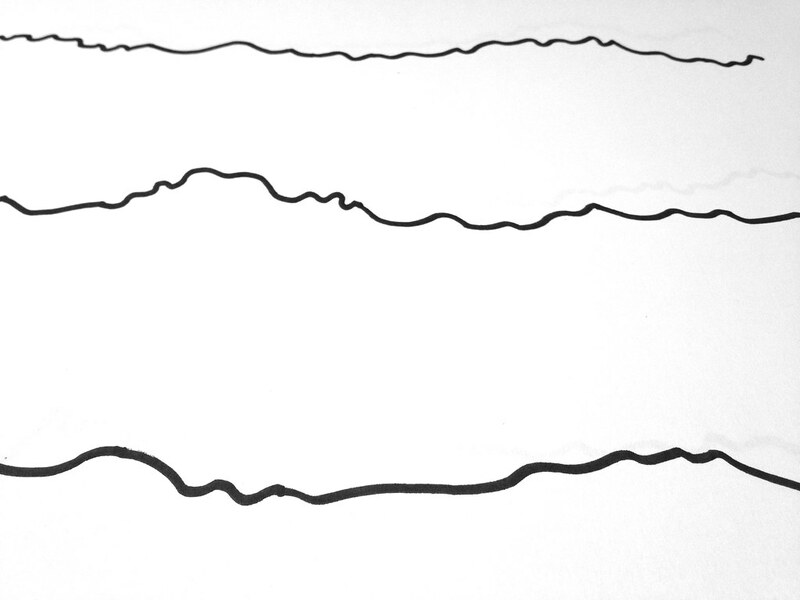 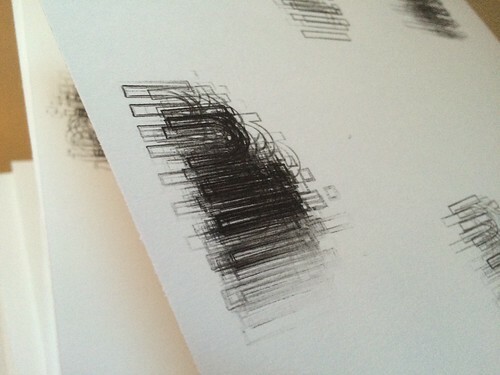 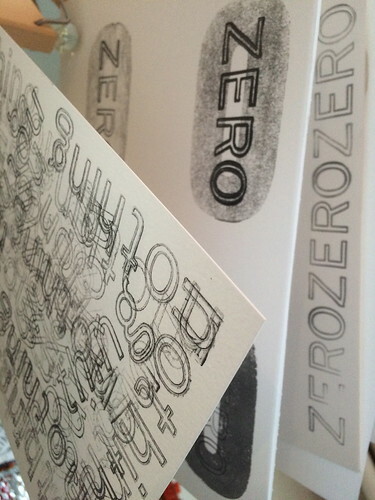 Now setting out the Riso images to make book 2 that will intersect with book 1.